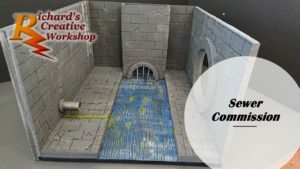 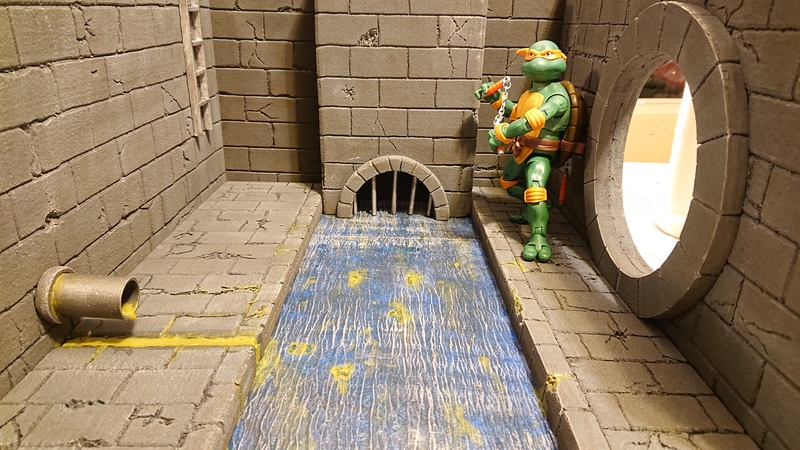 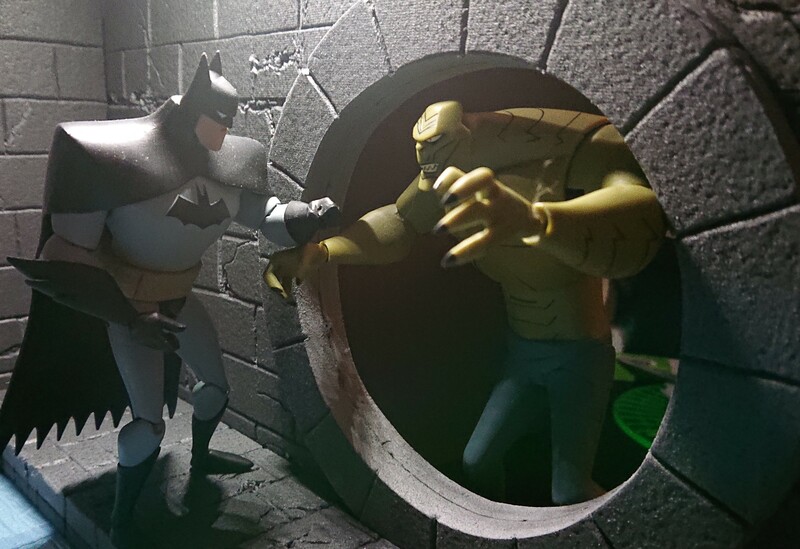 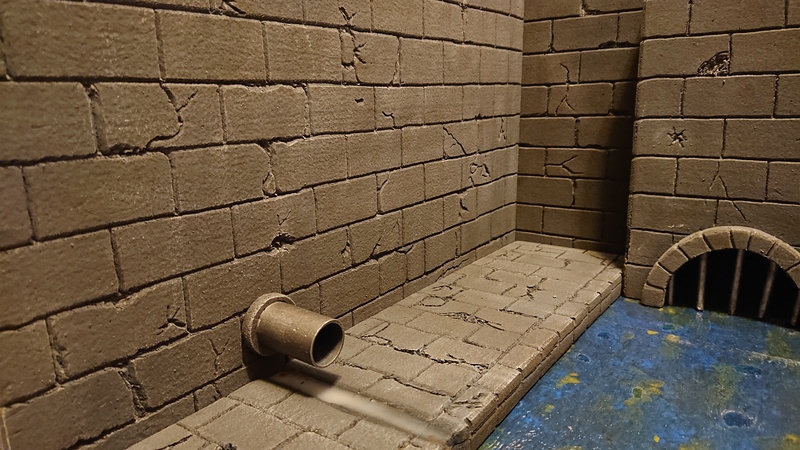 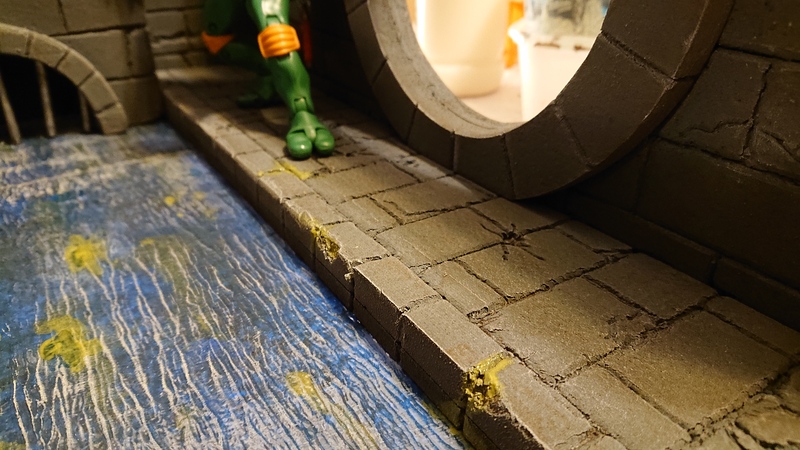 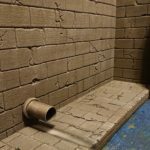 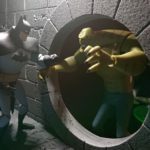 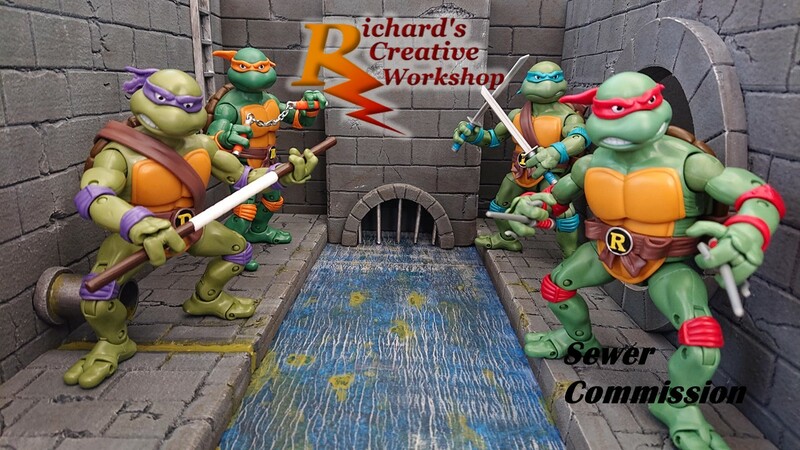 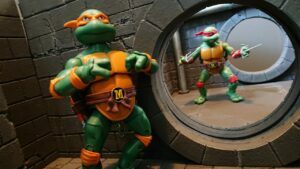 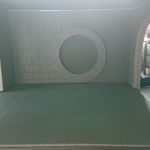 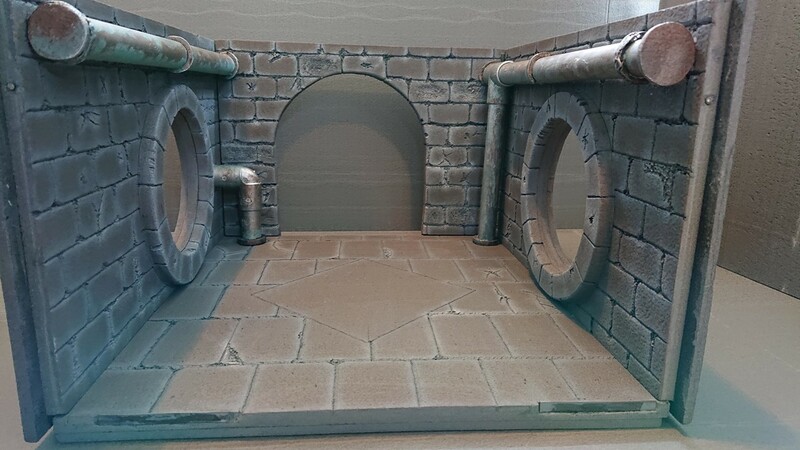 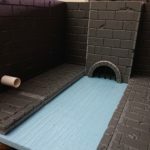 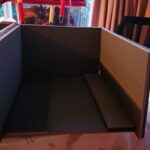 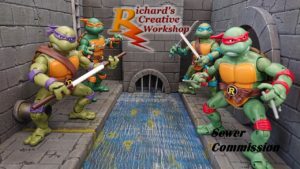 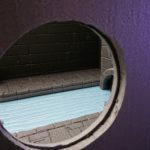 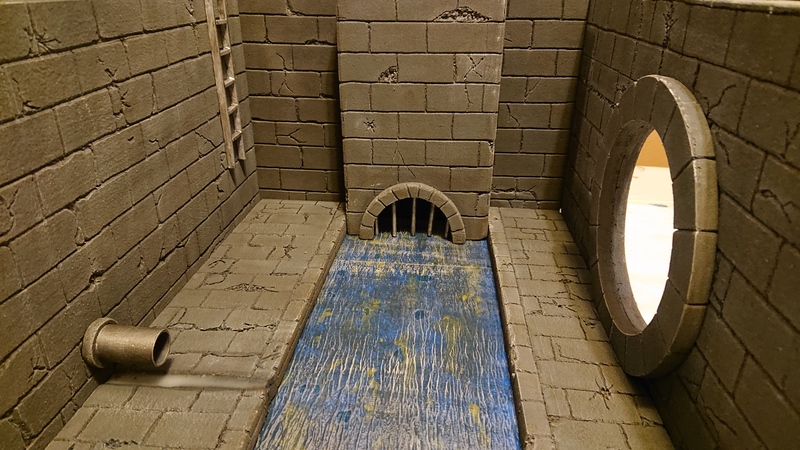 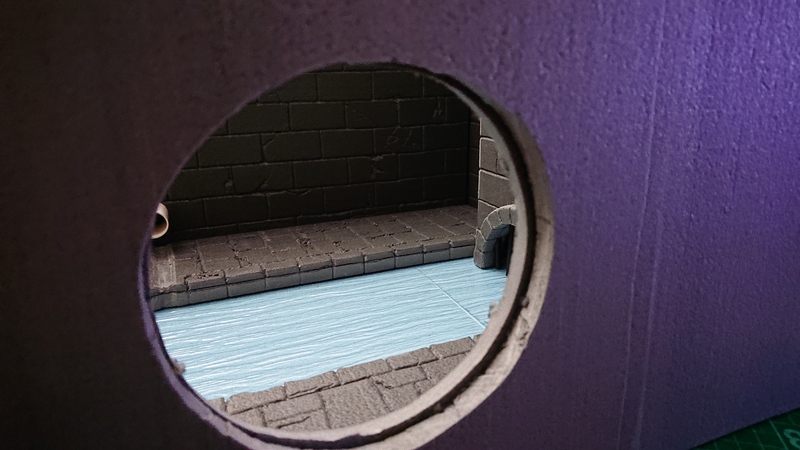 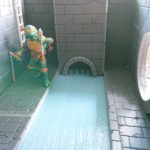 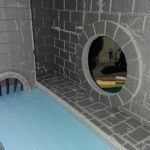 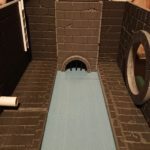 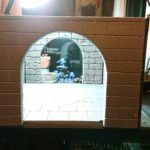 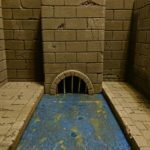 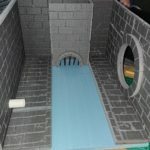 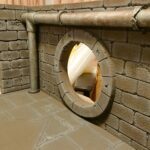 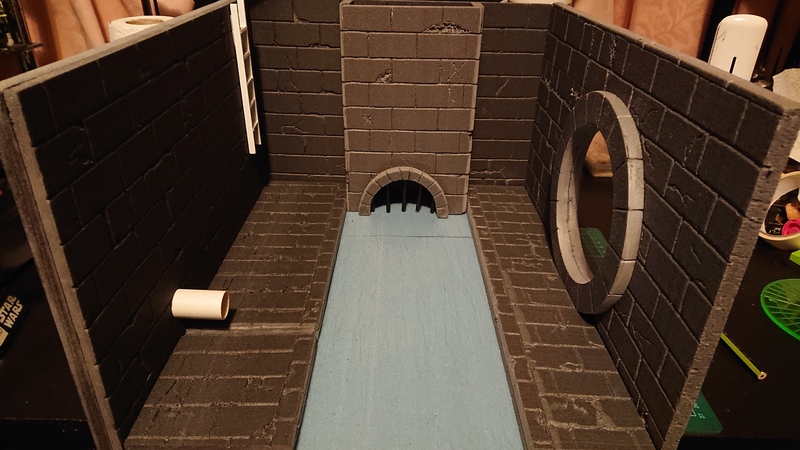 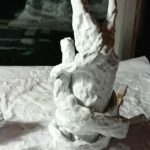 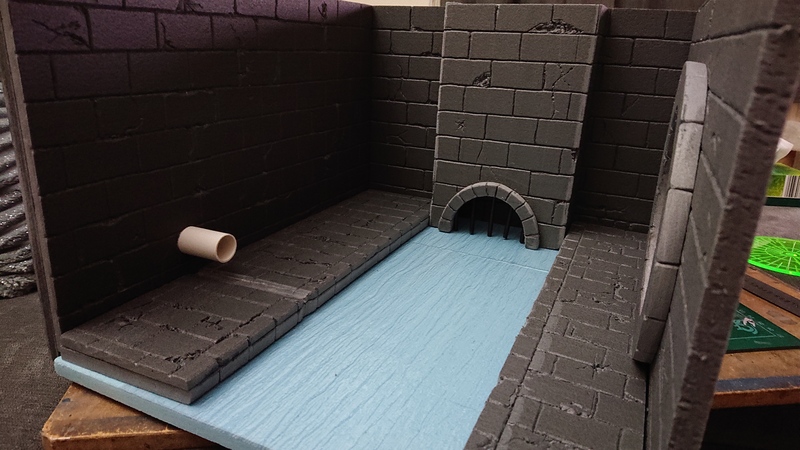 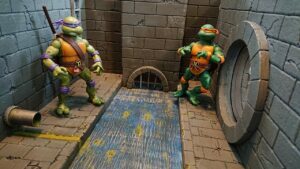 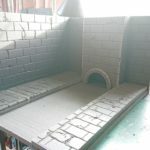 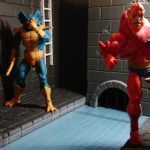 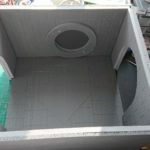 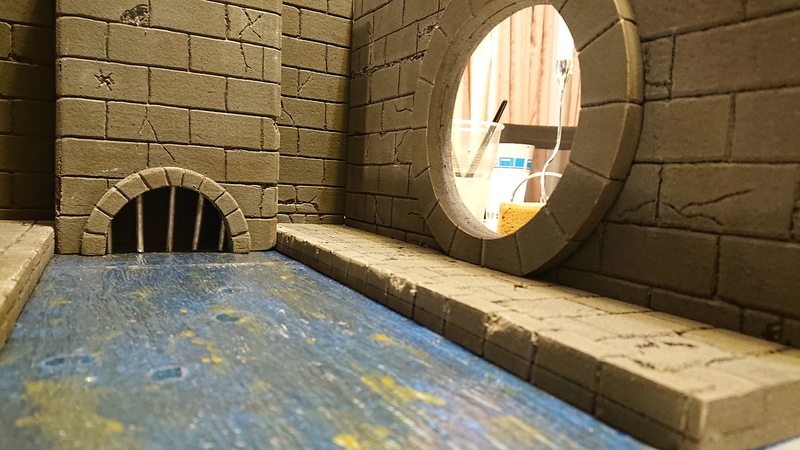 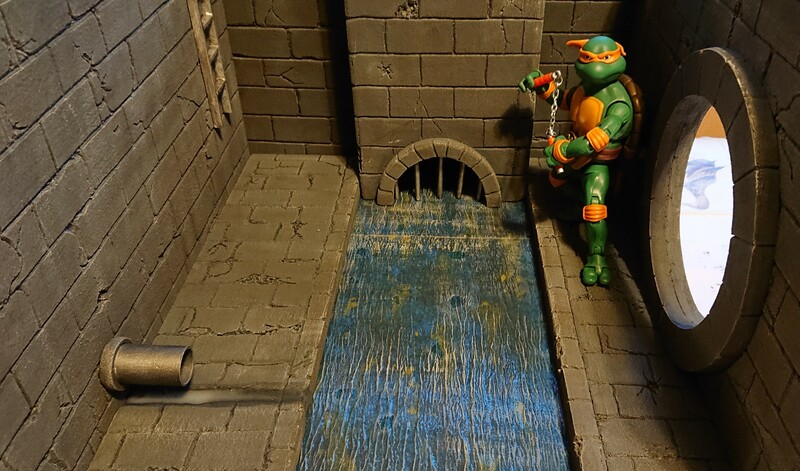 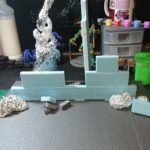 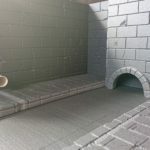 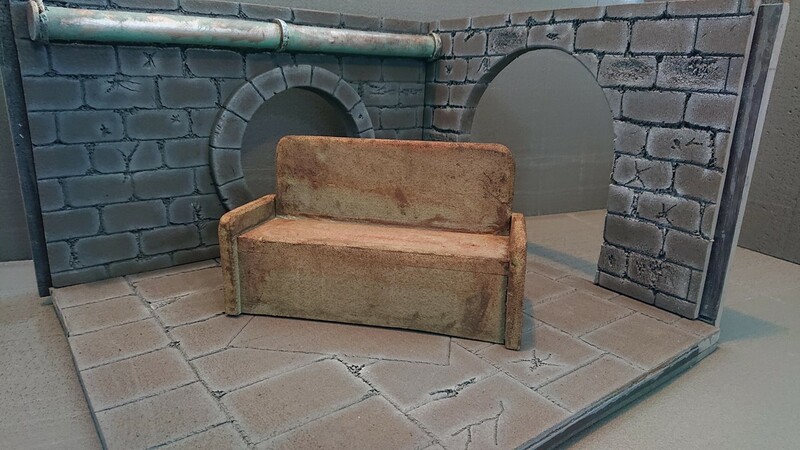 I’ve been commissioned to produce a couple of sewer dioramas, one identical to the one I had created earlier this year. 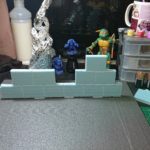 As you can see I have the basic form of one and the other two are in the process of joining this one. 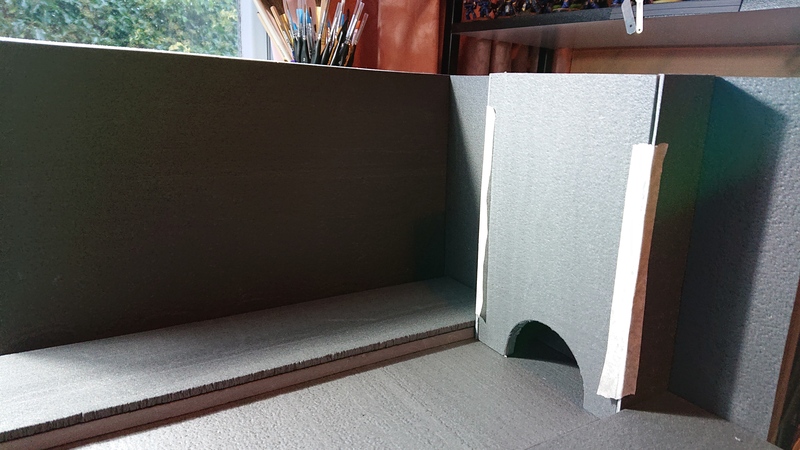 With the design agreed I can now branch this piece of onto it’s own page. My client has asked for a few of changes to be made previous version. 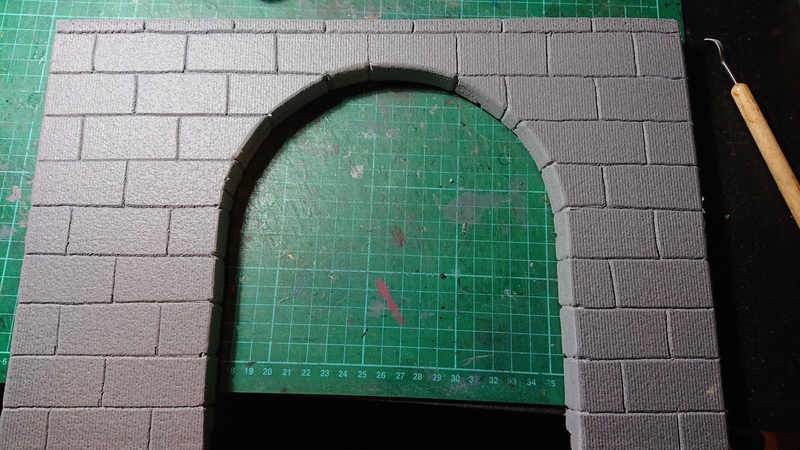 Instead of the central column with grate, he would like it replaced with a barred tunnel entrance, damp walls with multiple pipes running along the sides. 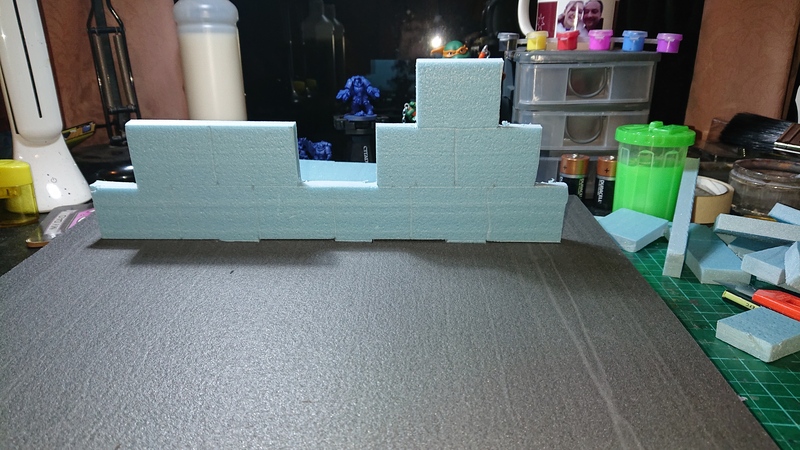 To apply the magnets to the walls I sanded all the sides down, having the magnets in place at this stage, I find it easier to work with model. 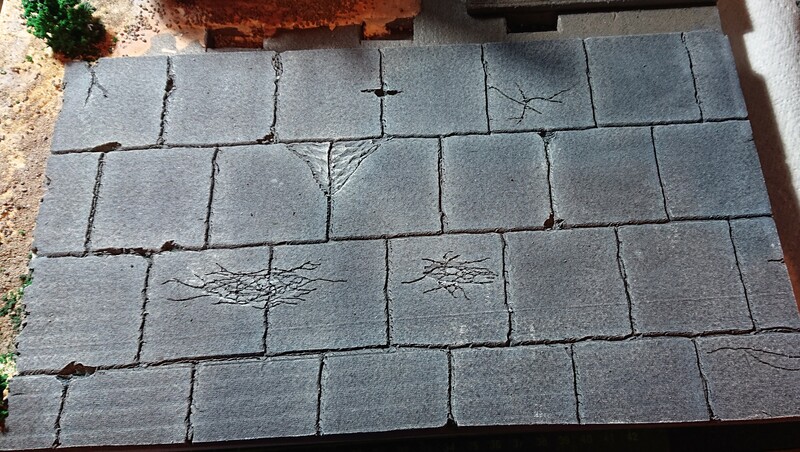 The brick work has been marked out and ready to be scored. 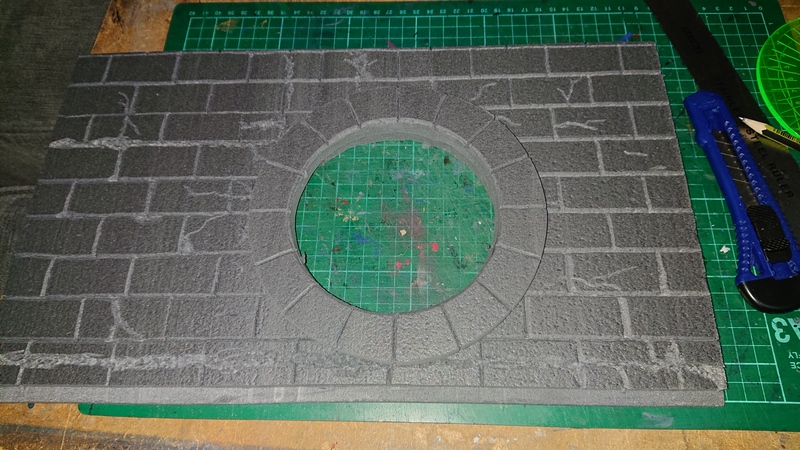 I had marked out the size of the tunnel entrance and toyed with the idea of adding a raised smaller sewer pipe further down one of the wall. 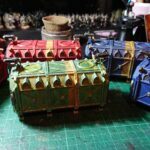 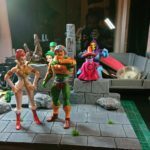 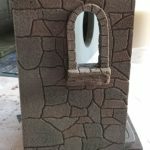 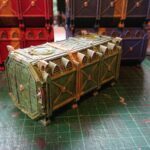 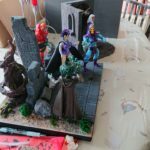 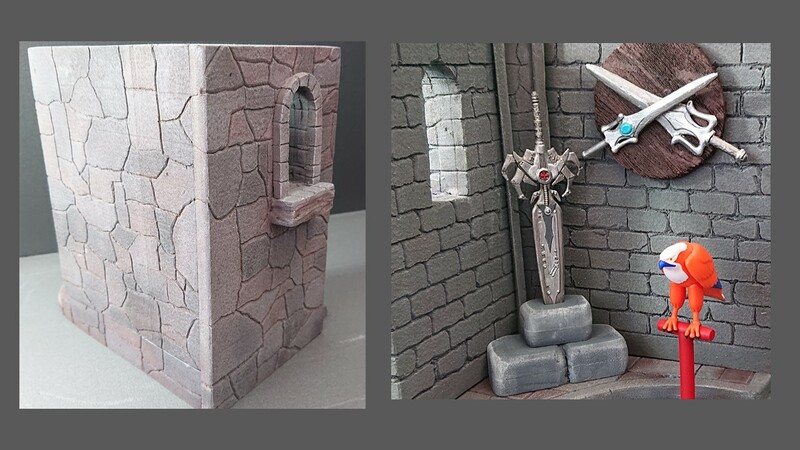 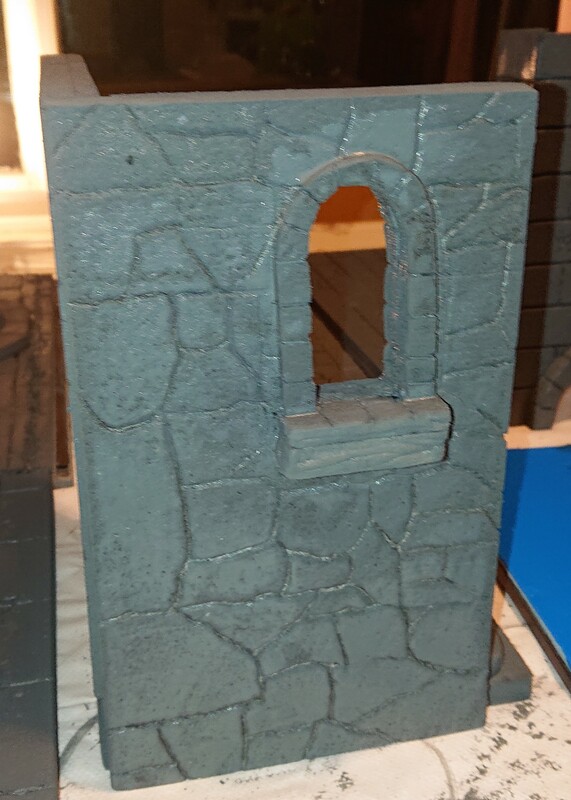 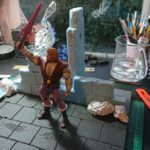 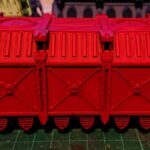 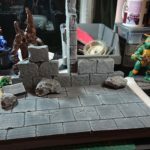 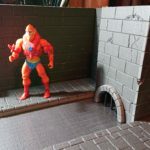 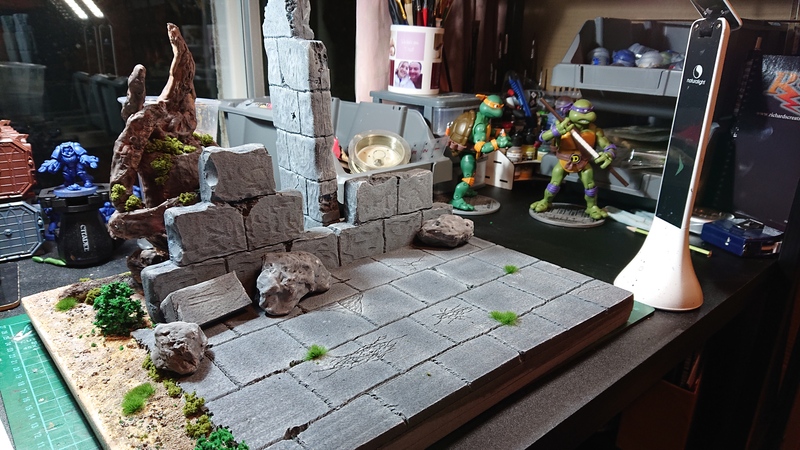 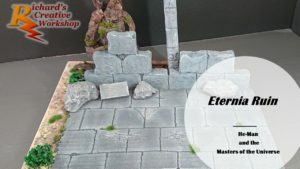 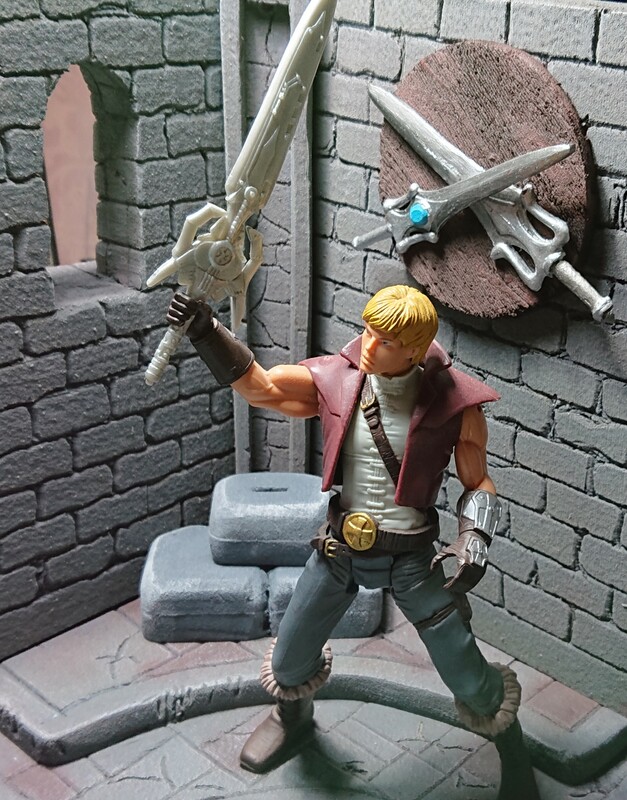 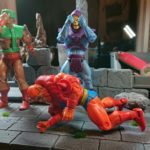 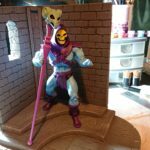 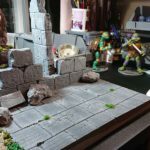 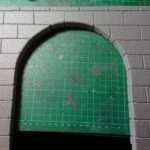 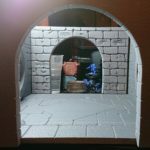 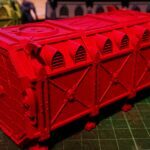 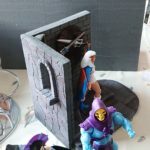 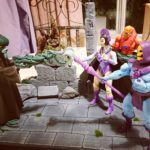 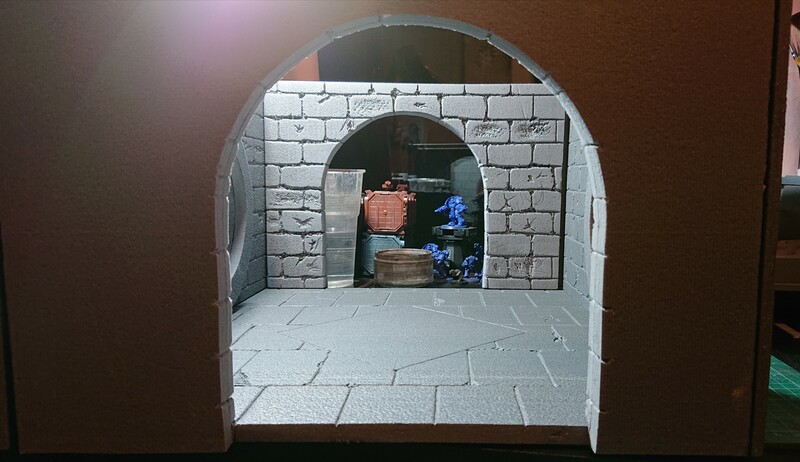 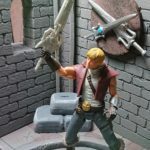 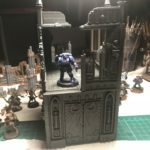 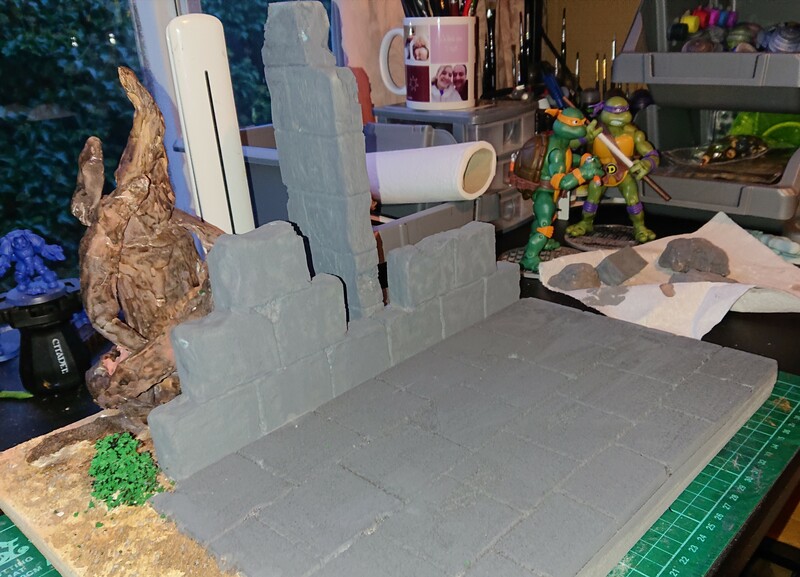 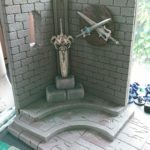 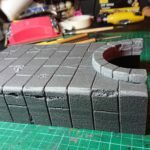 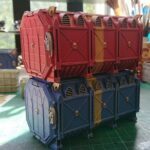 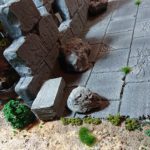 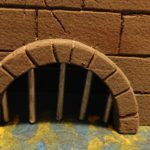 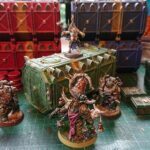 I’ve been commissioned to create a set similar to my Eternia Ruin with removable pillars. 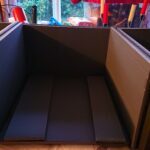 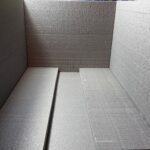 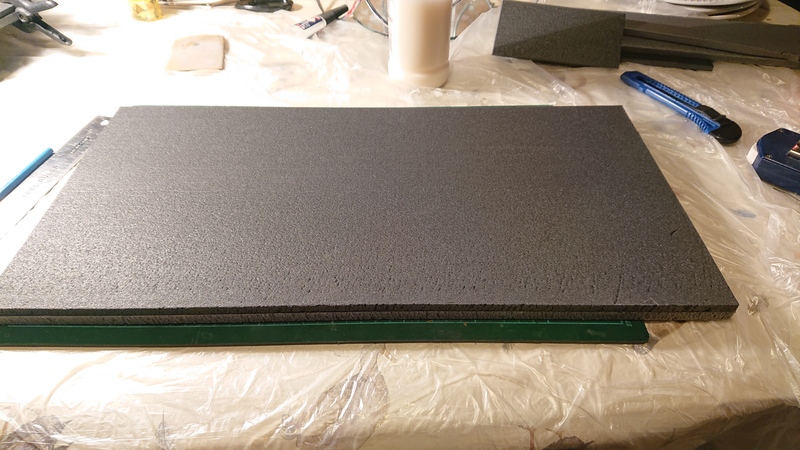 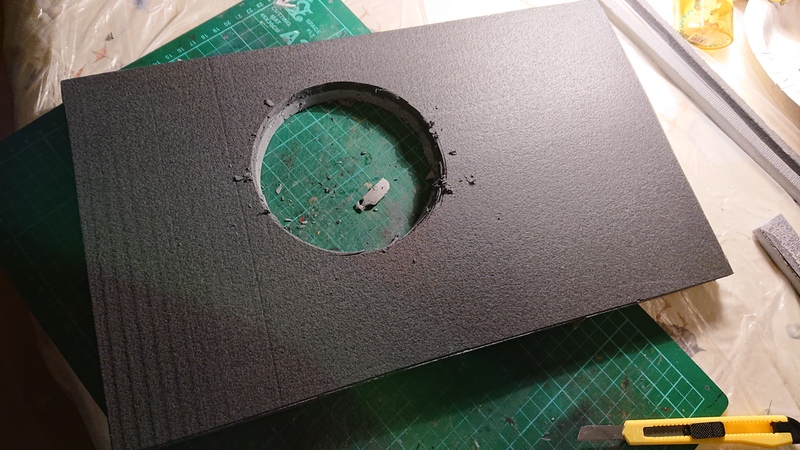 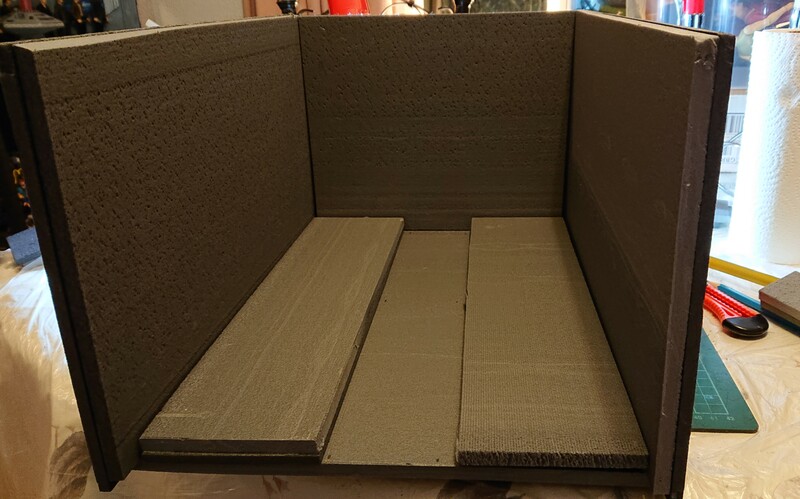 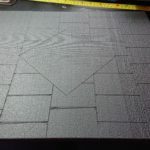 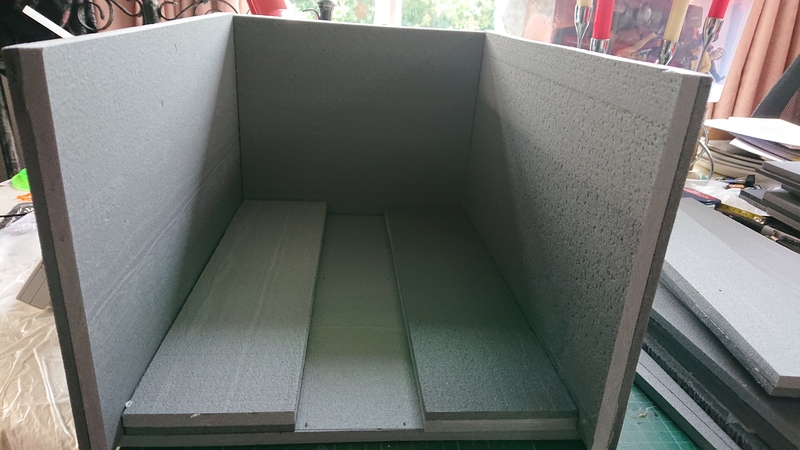 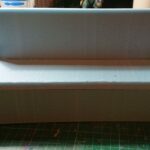 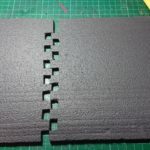 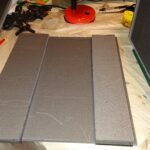 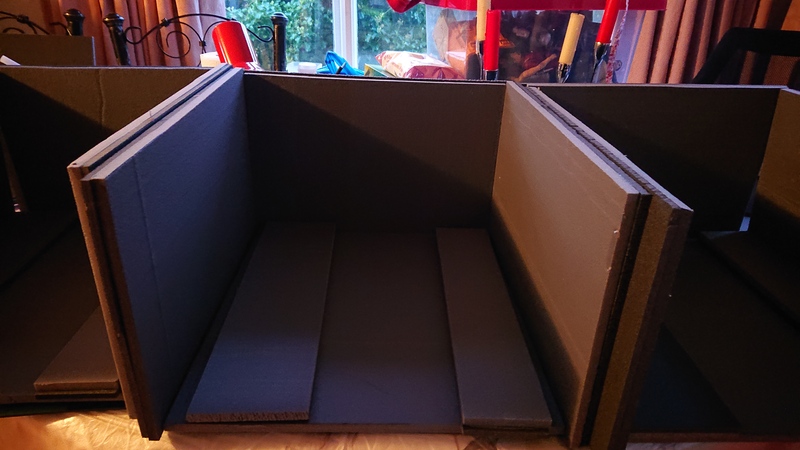 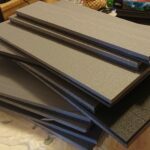 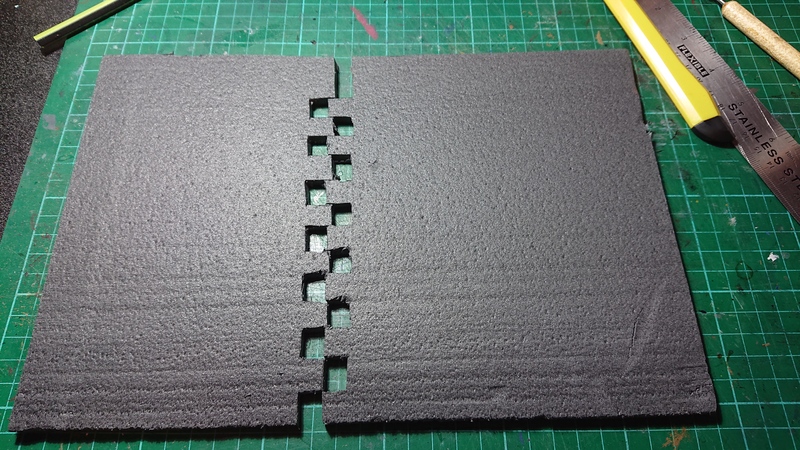 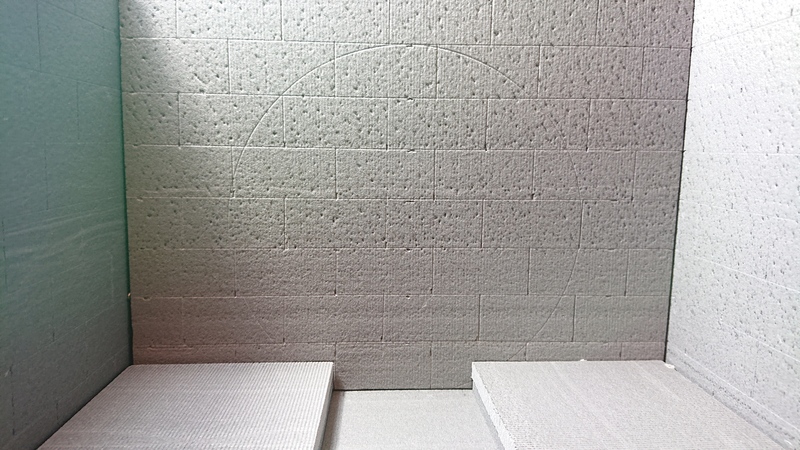 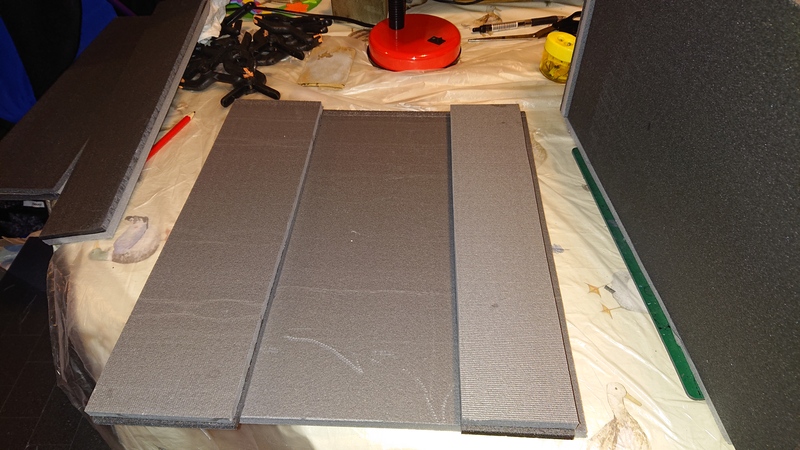 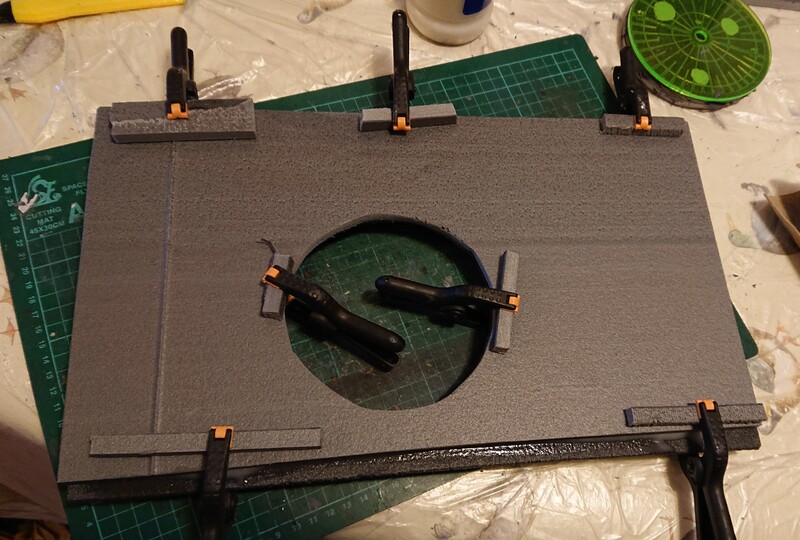 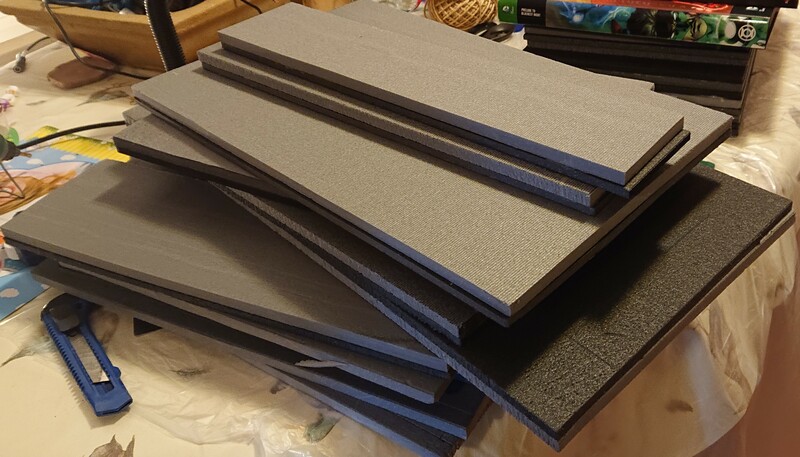 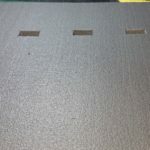 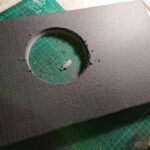 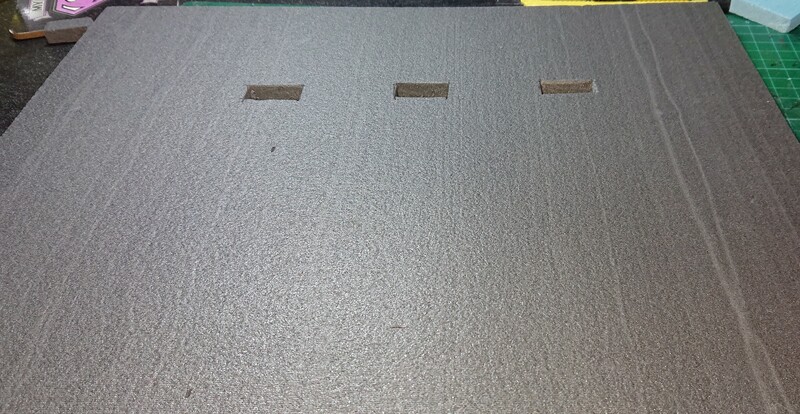 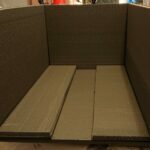 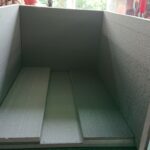 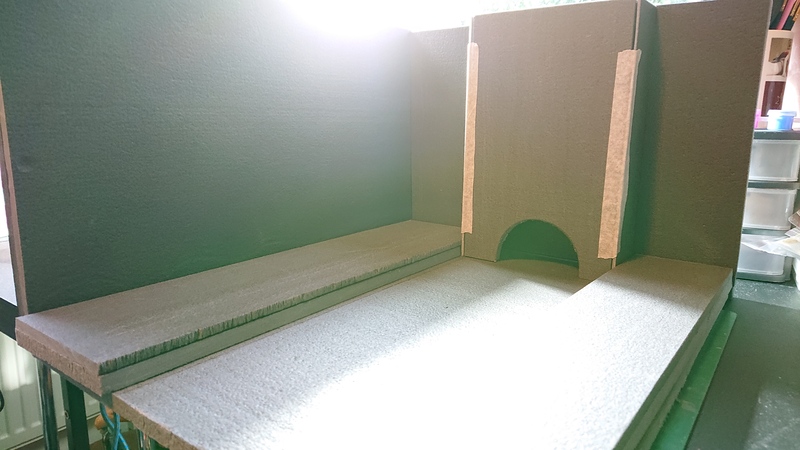 The base is made of 2 pieces of foam board 20″ x 10″, the boards were glued together using PVA glue. 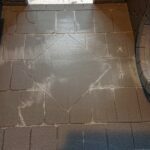 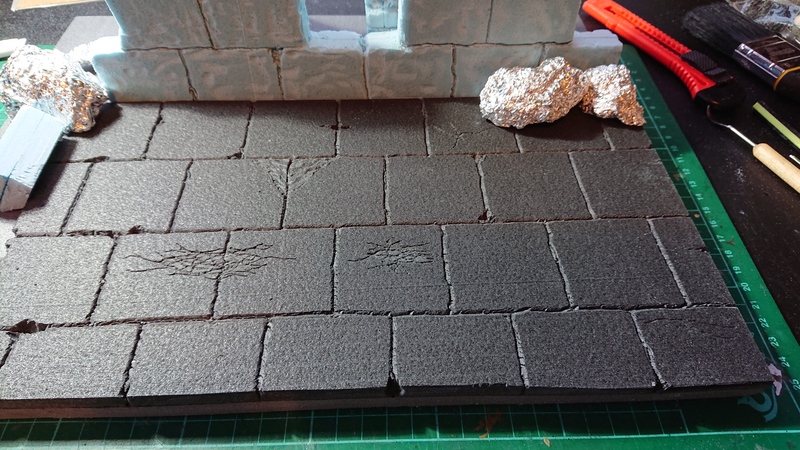 Once they dried I’d marked out the tiled floor, where each flag stone is 3″ x 2.5″. 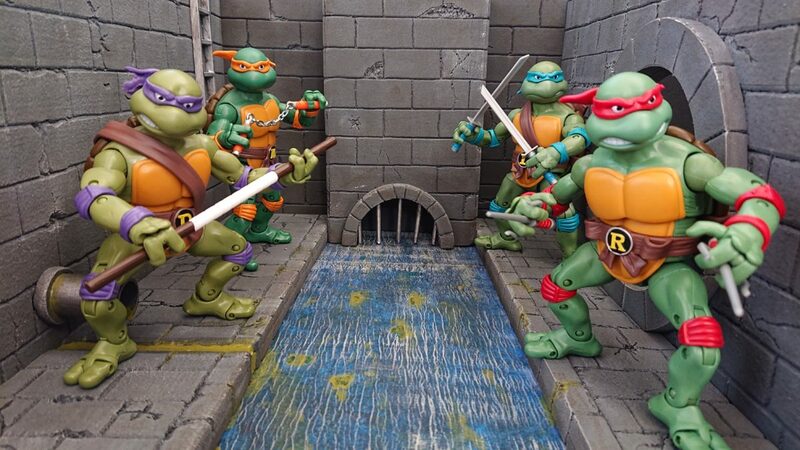 As you can see I have the basic form of one and the other two are in the process of joining this one. 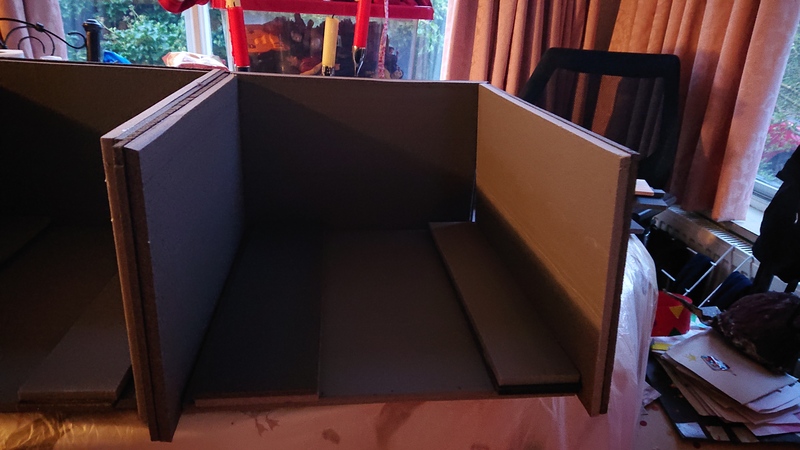 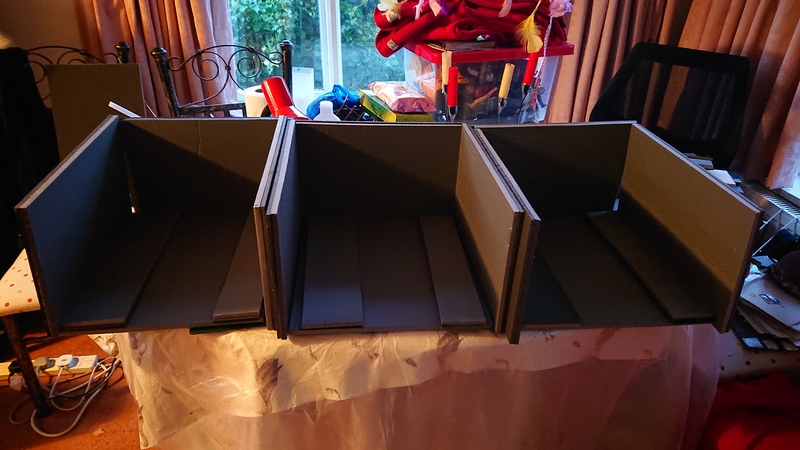 The other two will be getting their pages as they develop, as you can see they are still in their early construction phase. 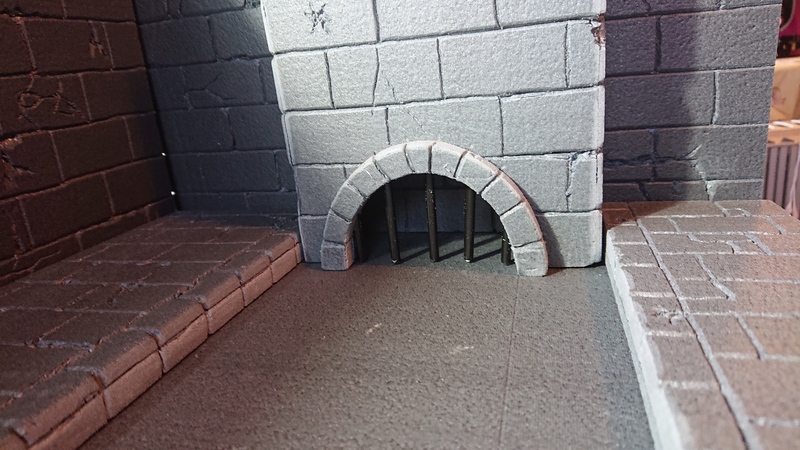 With the walls dry it was time to cut the mouths of the sewer tunnels into one wall of two of the sewers. 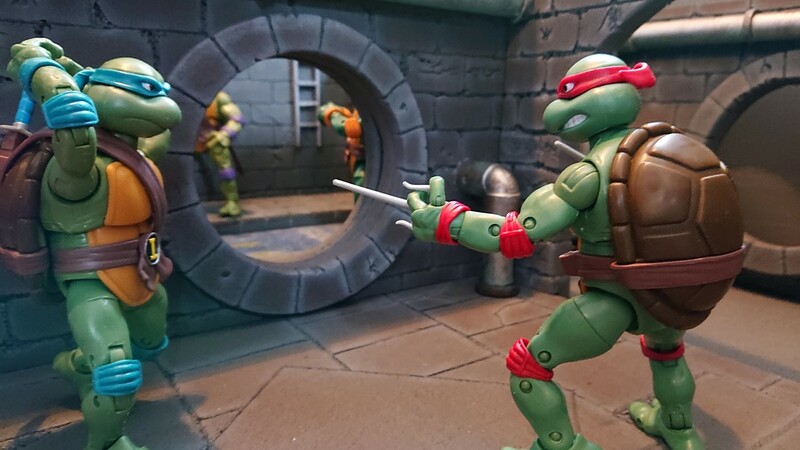 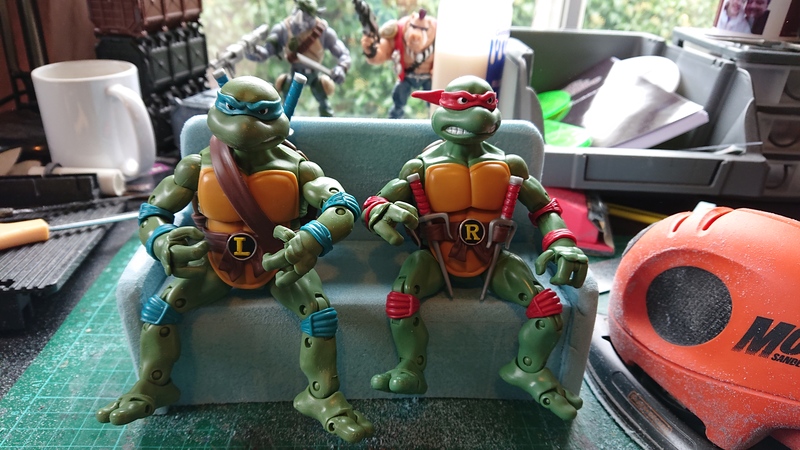 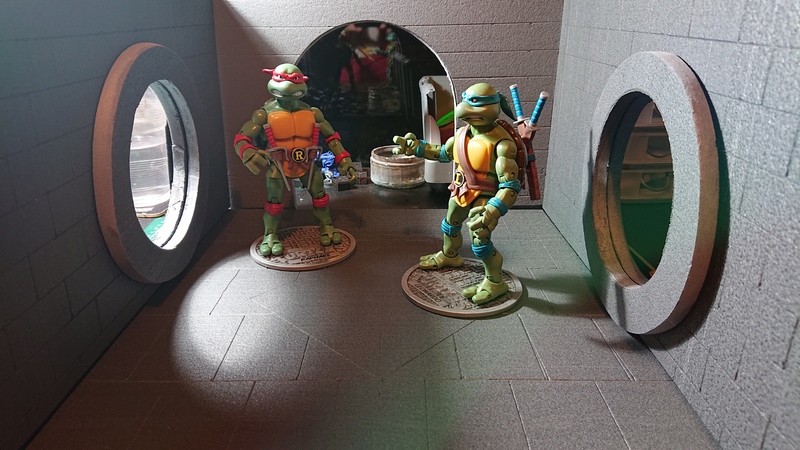 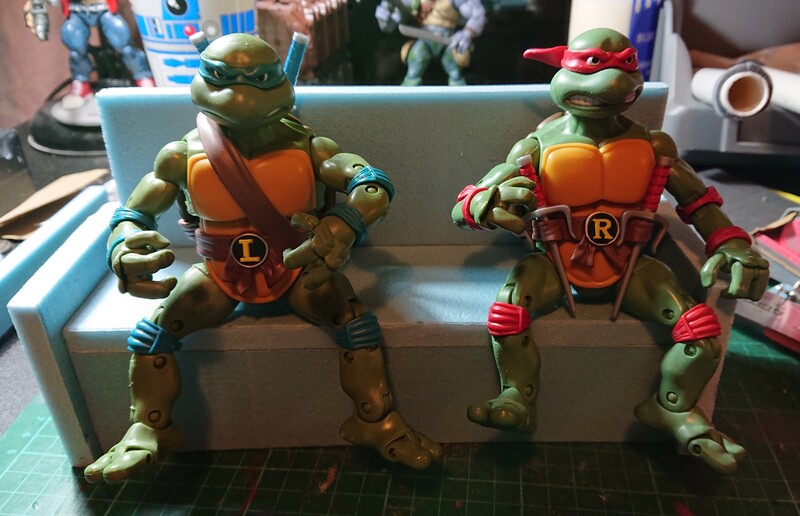 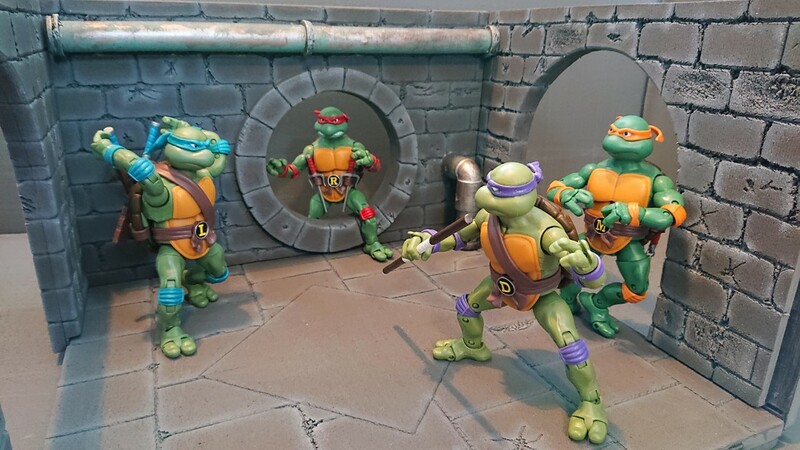 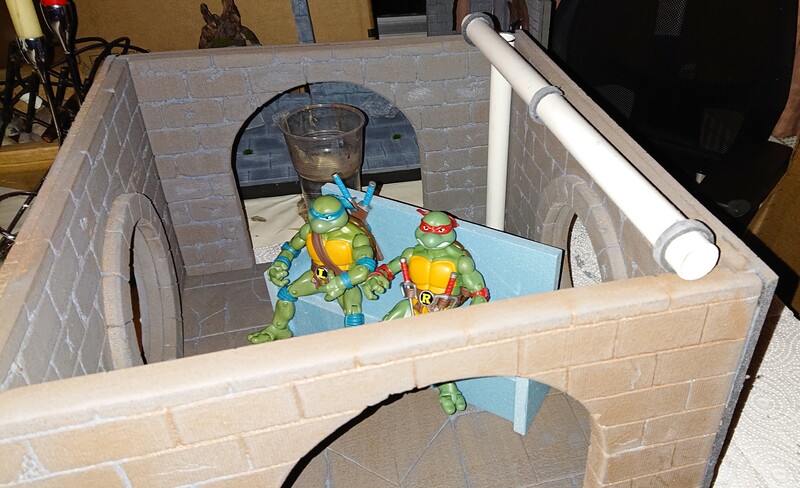 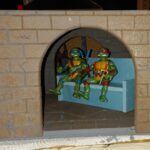 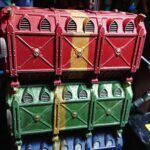 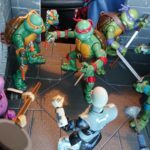 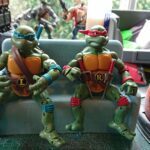 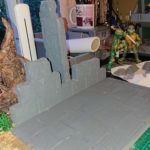 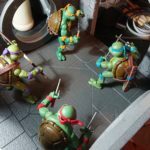 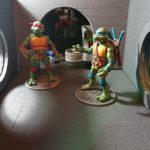 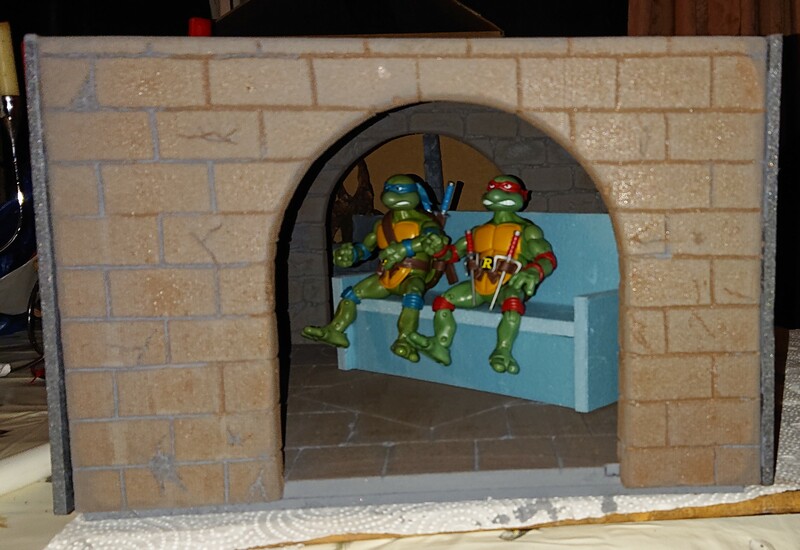 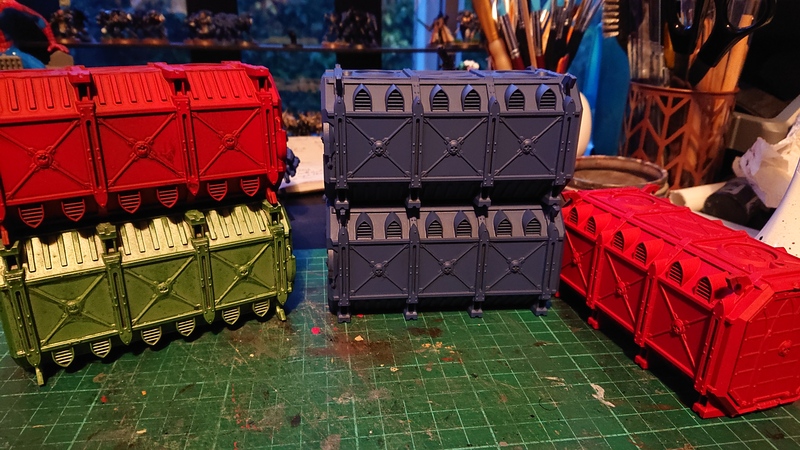 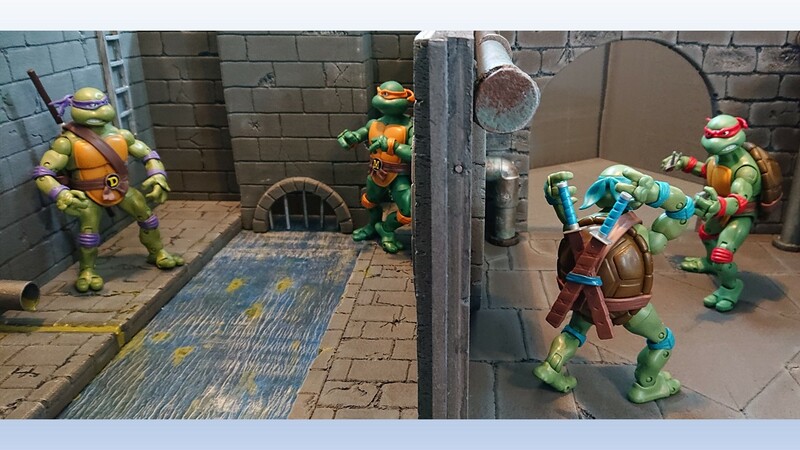 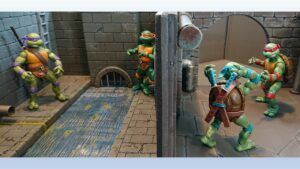 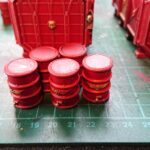 I wanted these sets to marry up with the ones I had previously cut for me TMNT Lair I made a couple of months ago. 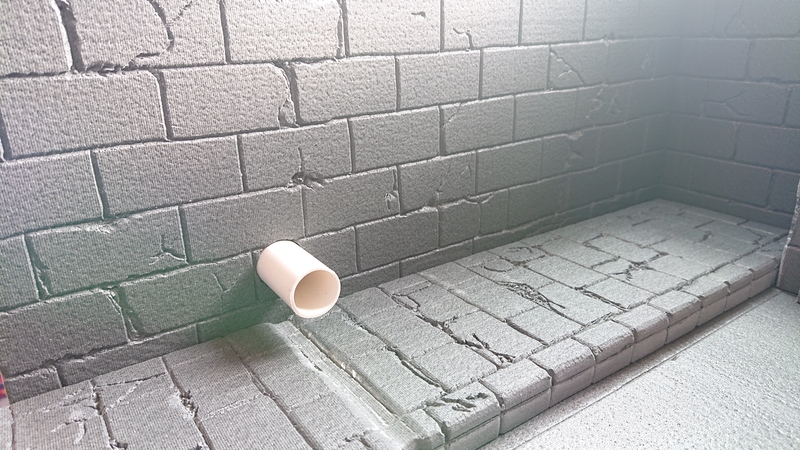 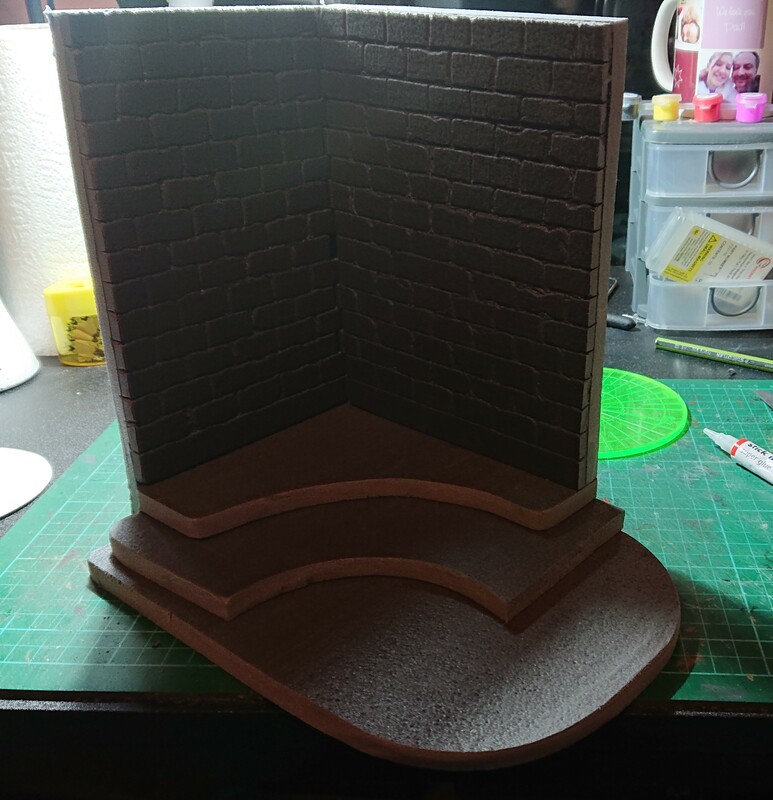 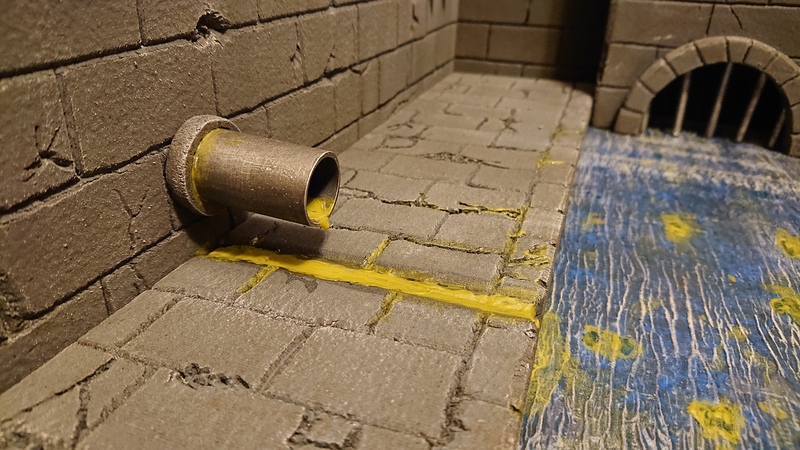 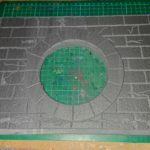 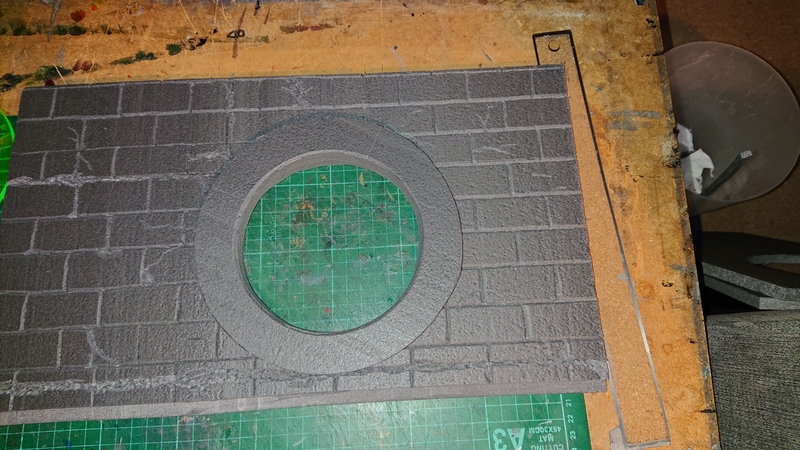 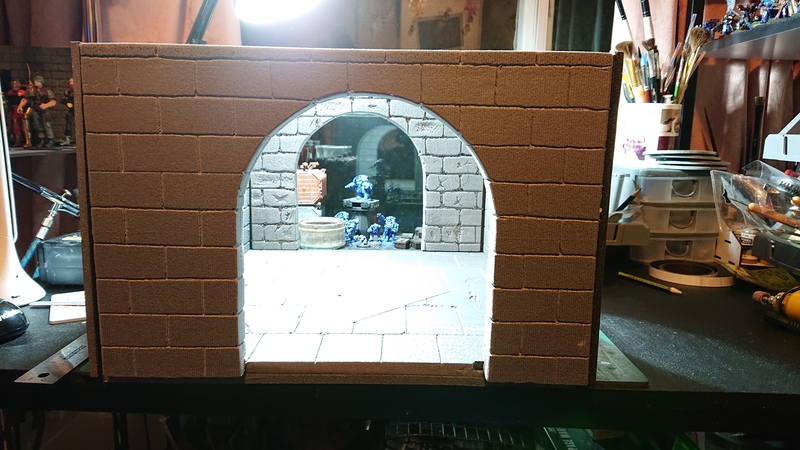 With this done I can now start to etch in the brick work into the walls of these two sewers. 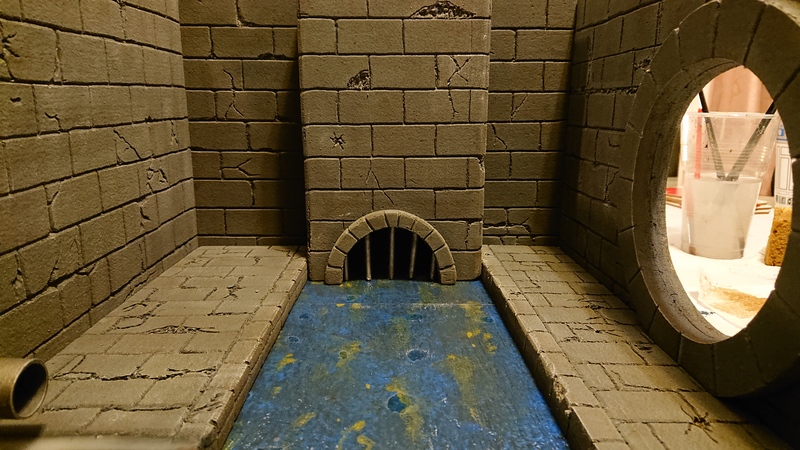 The third sewer I need to cut a sewer tunnel mouth in the center of the middle wall. 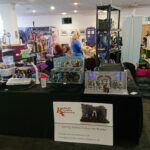 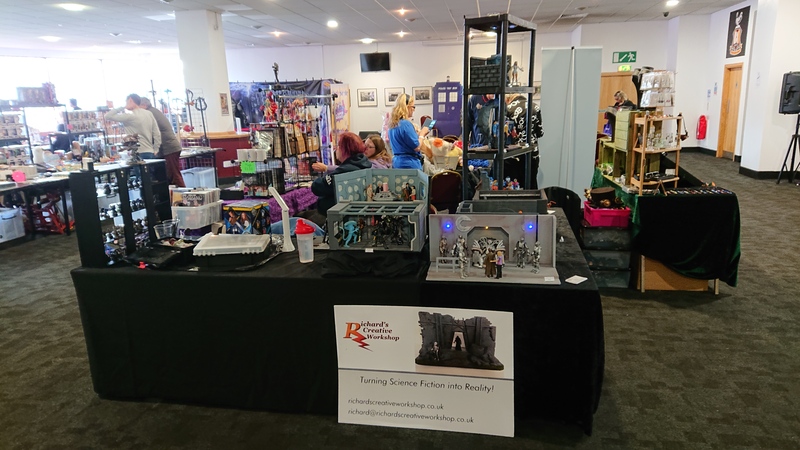 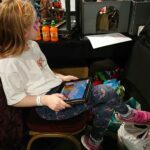 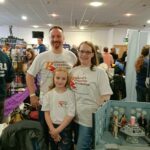 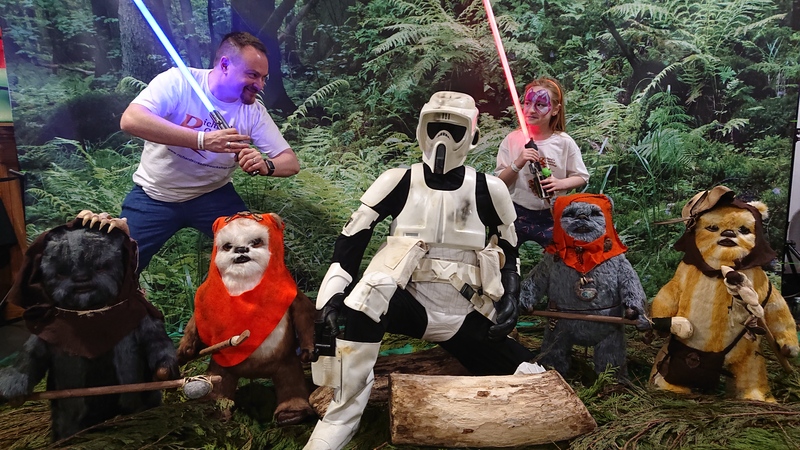 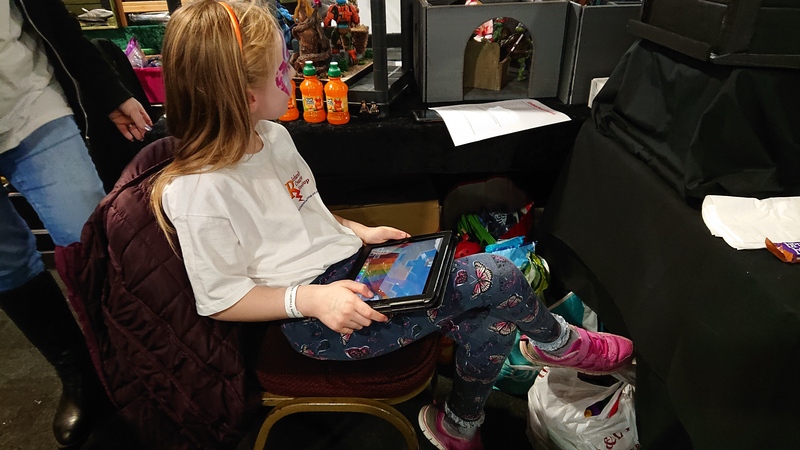 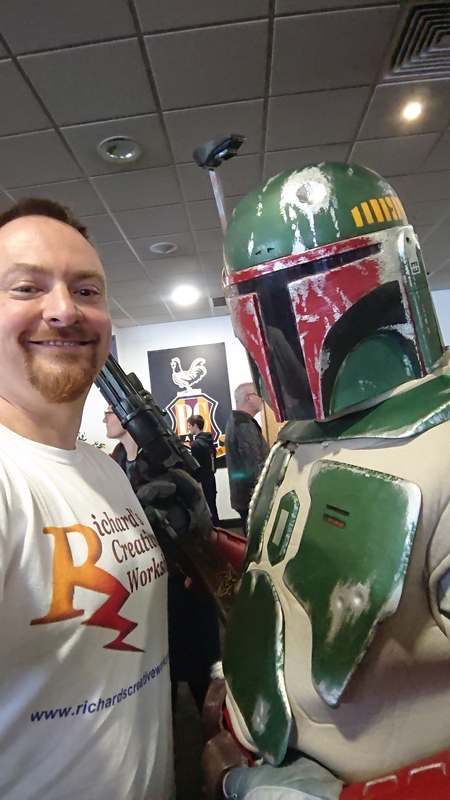 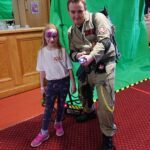 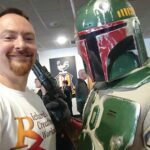 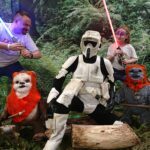 I attended Bradford Unleashed on Sunday, I had a great plot in hall. 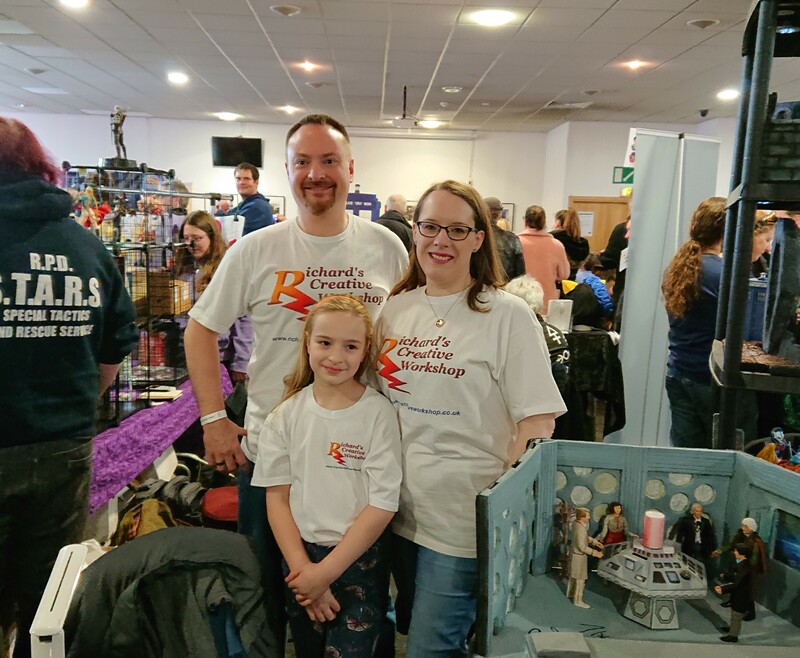 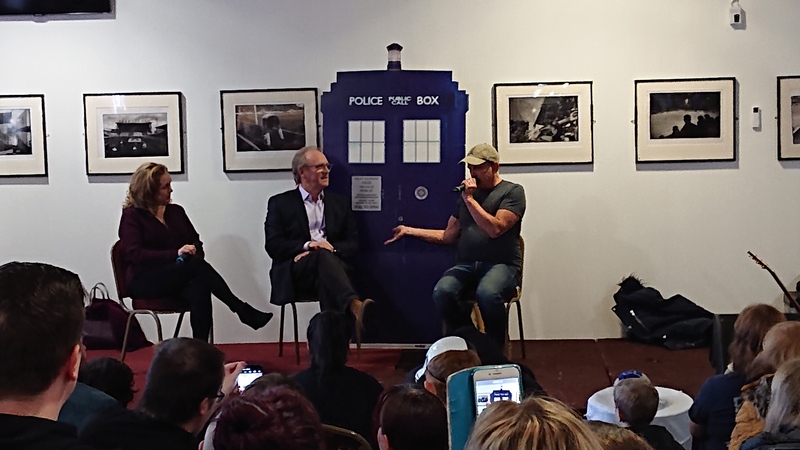 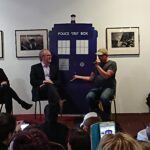 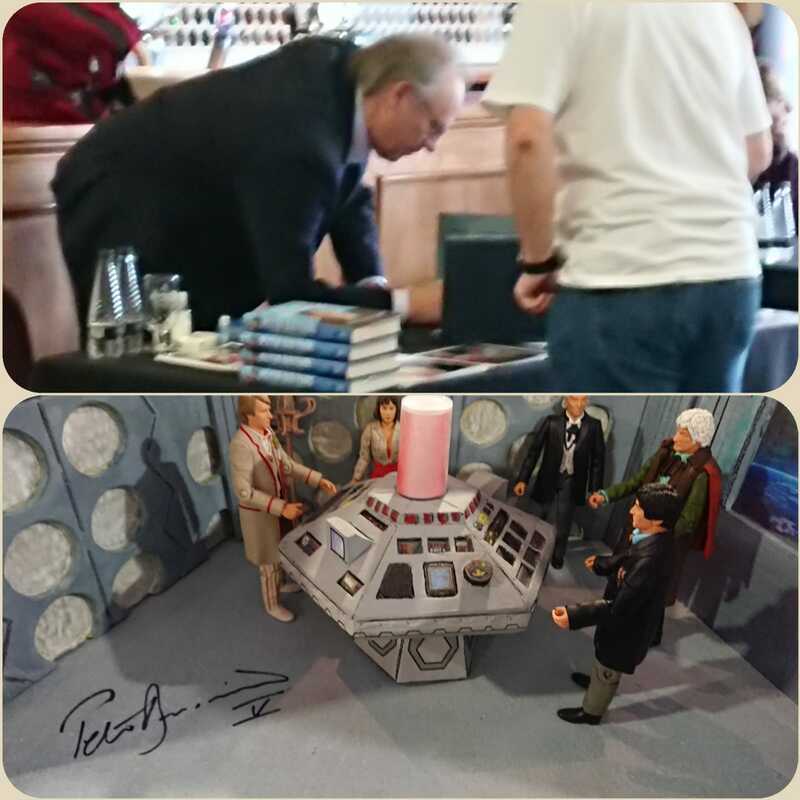 To my absolute joy I was placed diagonally opposite Peter Davidson, the fifth Doctor Who. 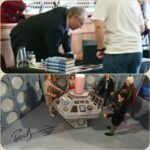 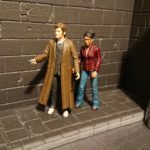 It cost but I got him to sign my 80’s Doctor Who Tardis diorama. 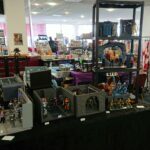 I had a wonderful day, met some great people who are really interested in my work. 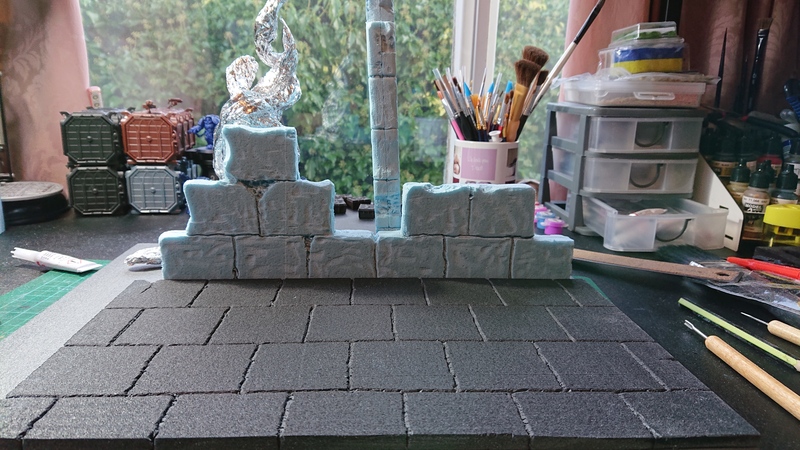 Half way through the day my youngest daughter joined me making this a family affair, even though by the end of the day she got a little bored. 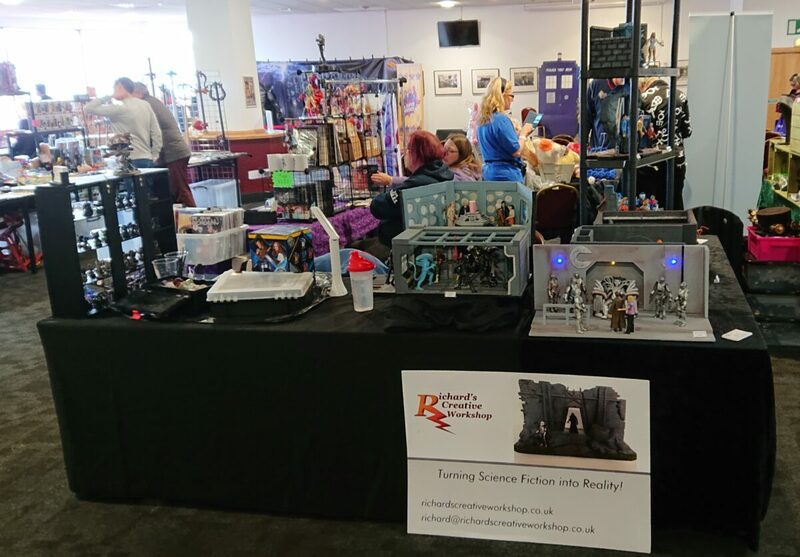 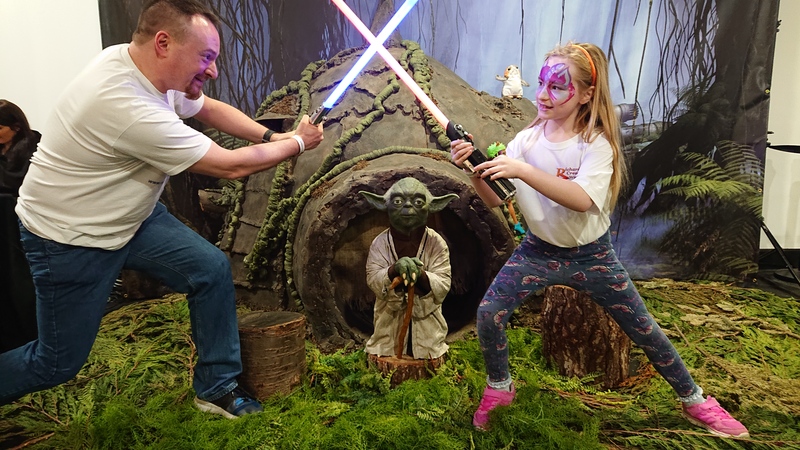 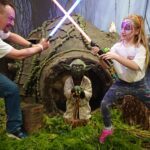 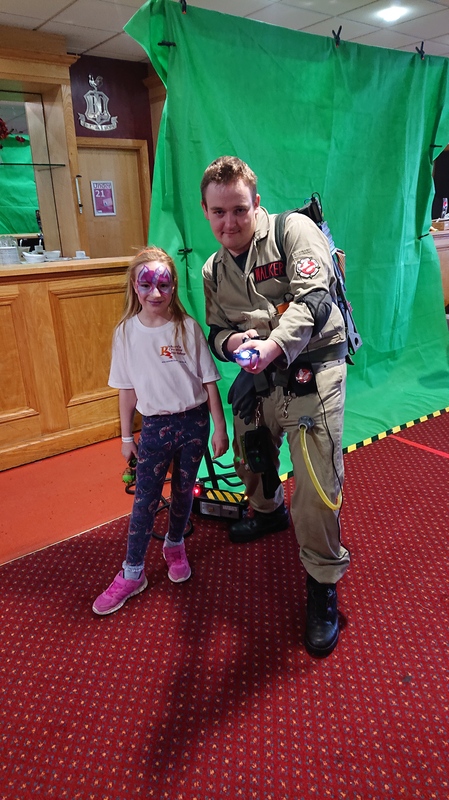 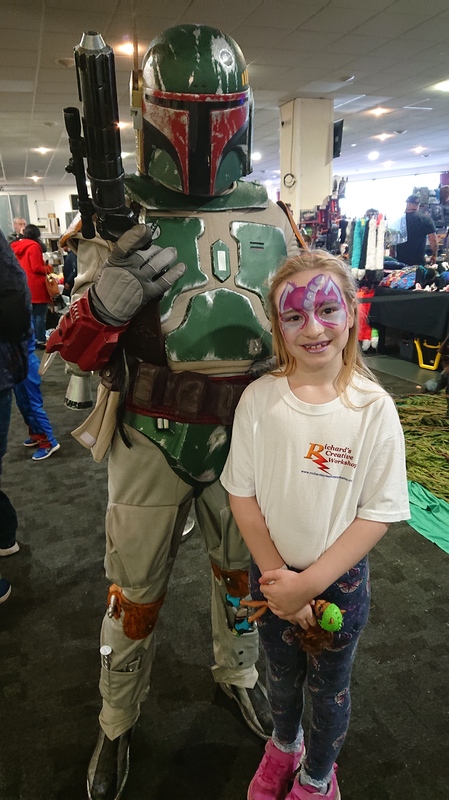 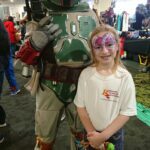 A great day had by all and looking forward to the next one! 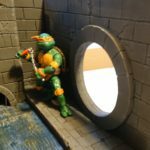 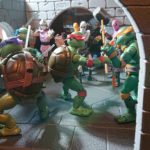 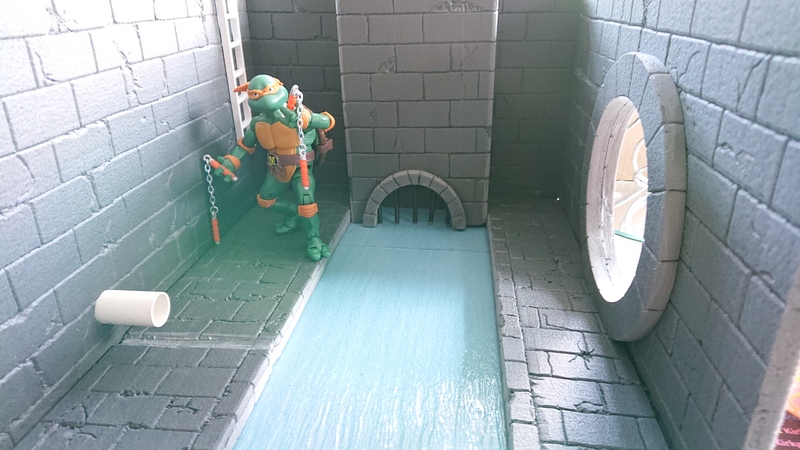 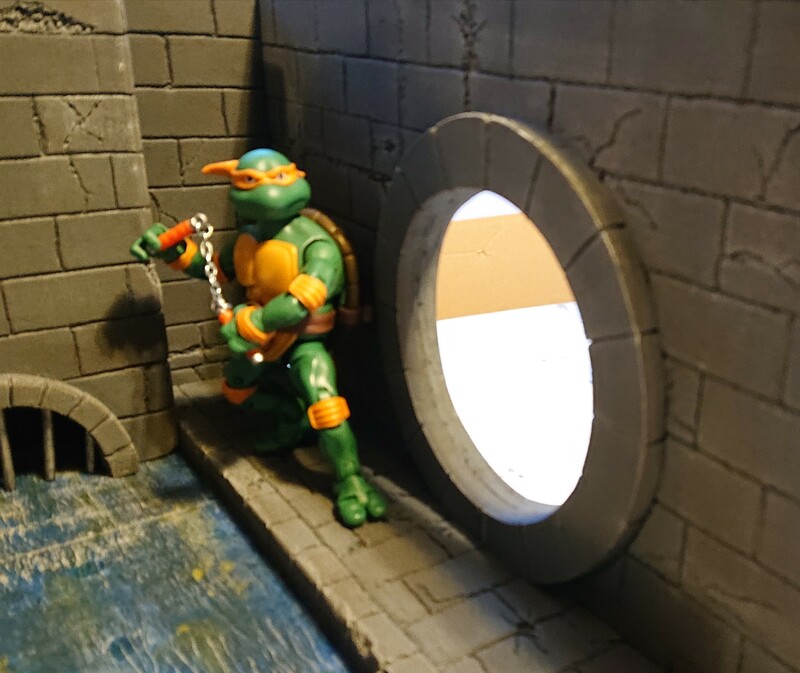 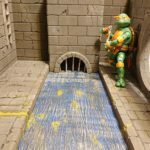 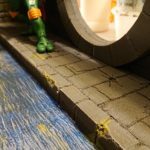 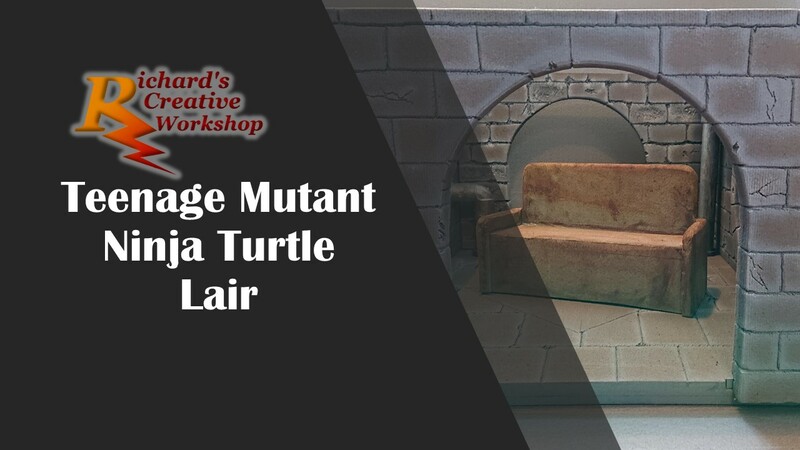 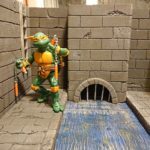 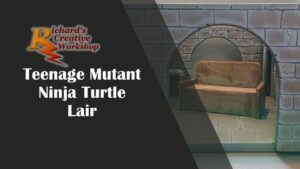 Taking inspiration from my recent Sewer commission I wanted to make a TMNT lair. 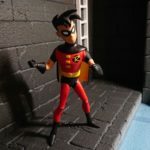 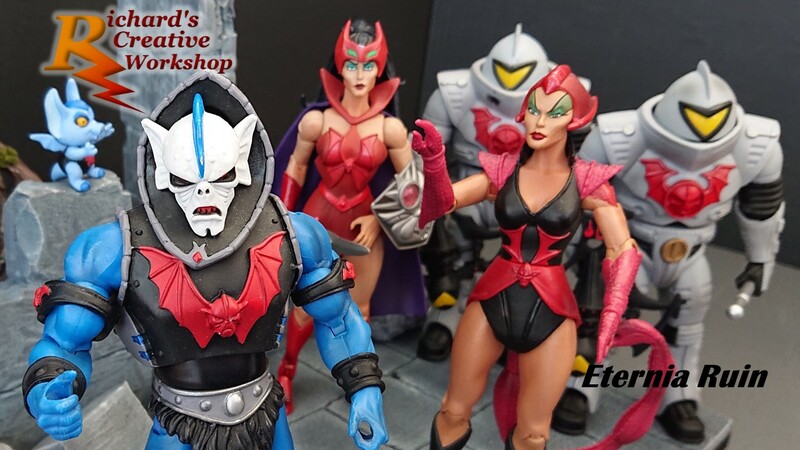 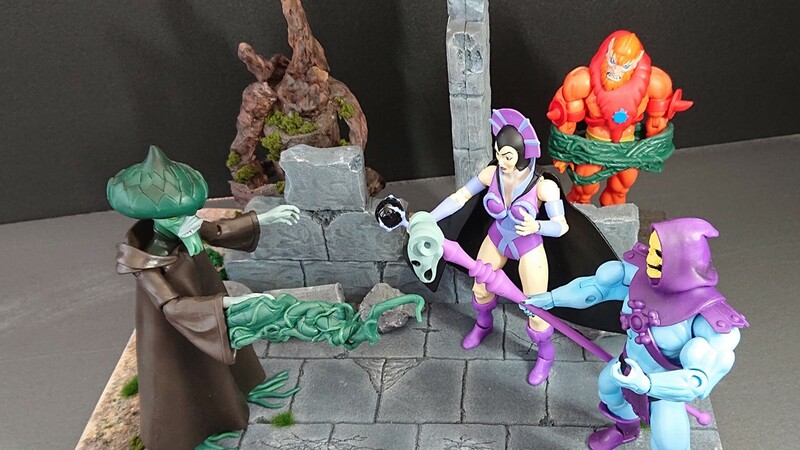 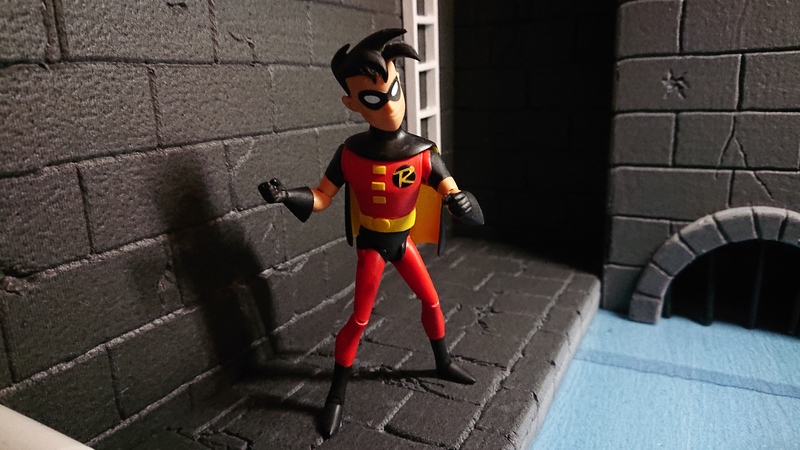 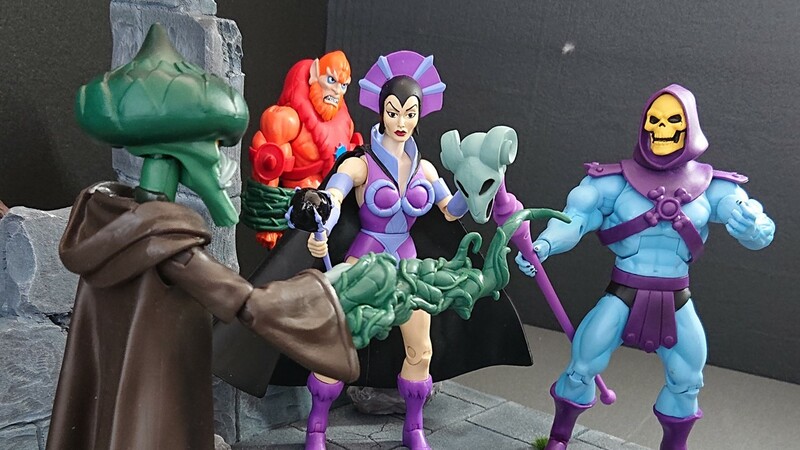 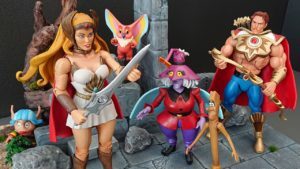 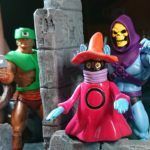 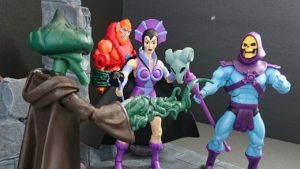 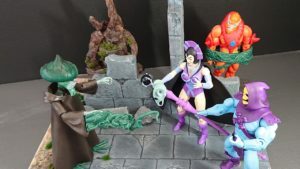 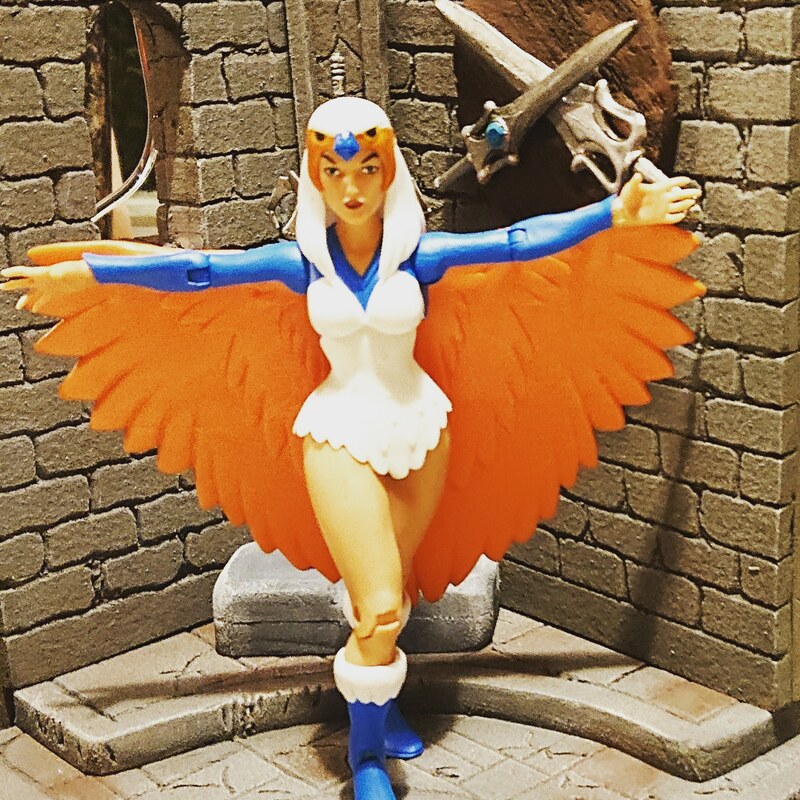 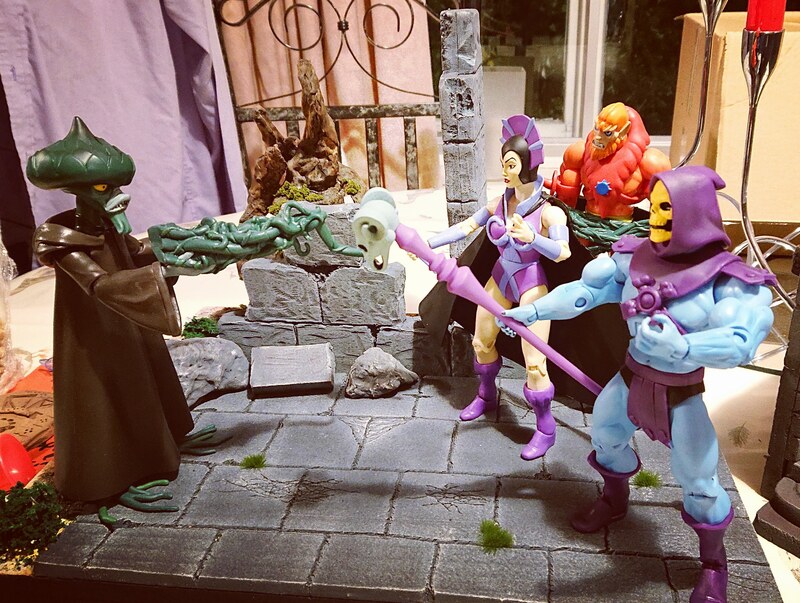 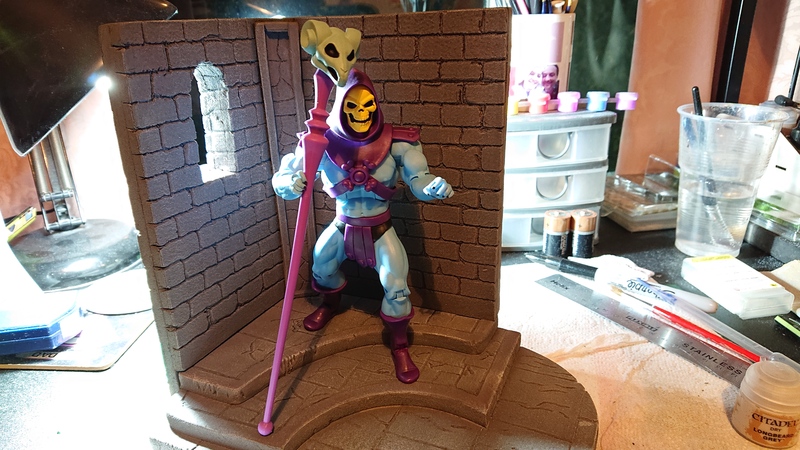 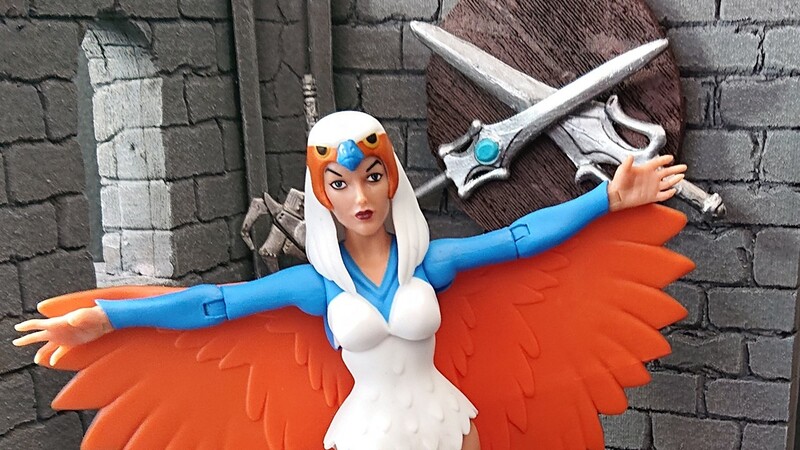 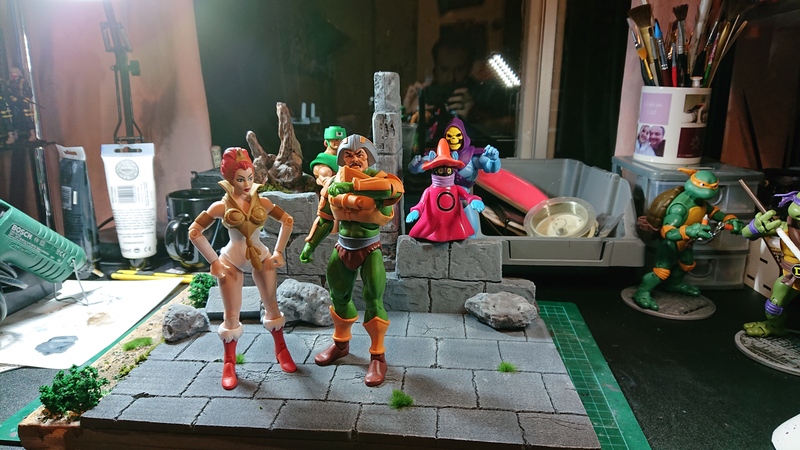 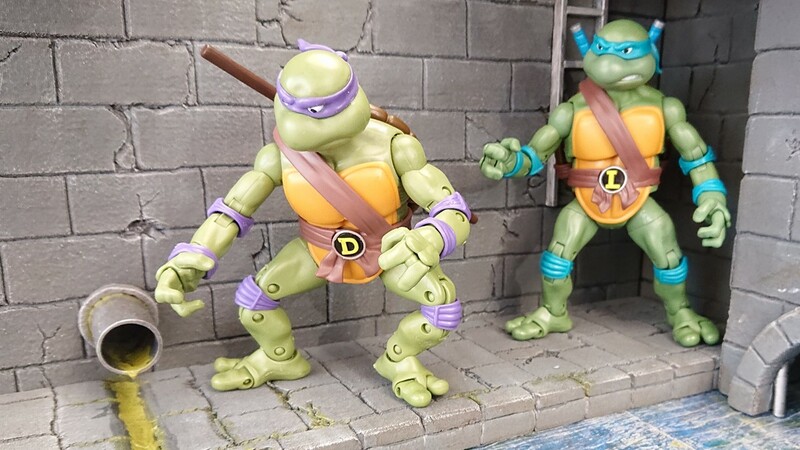 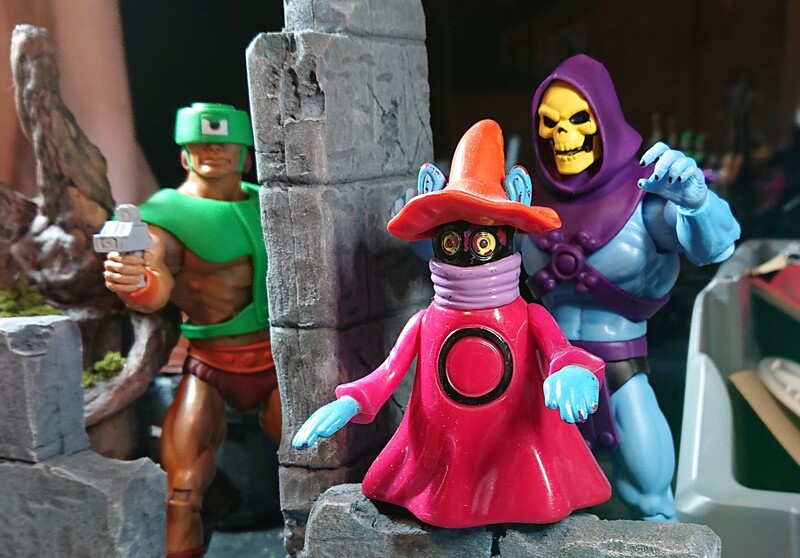 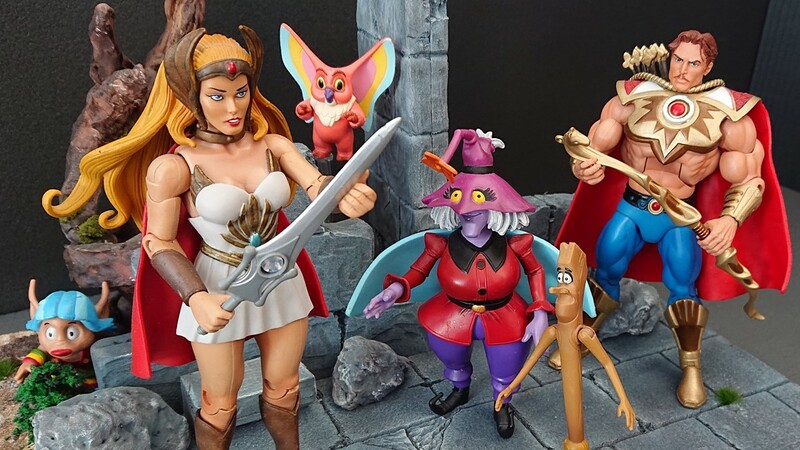 This piece is scaled to the 7″ Classic figures (based on the 1987 cartoon). 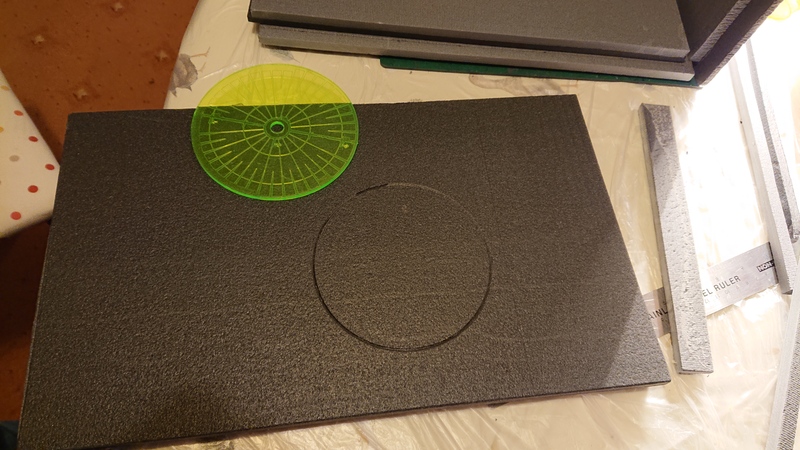 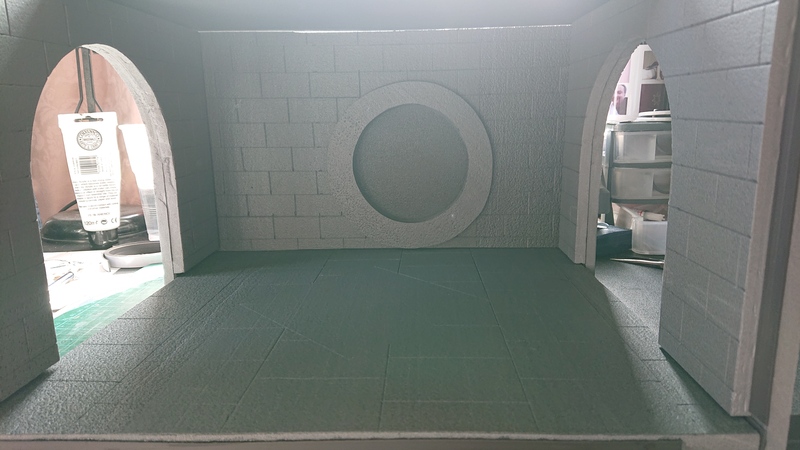 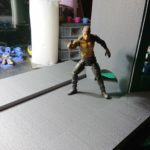 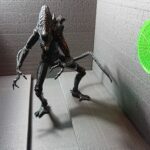 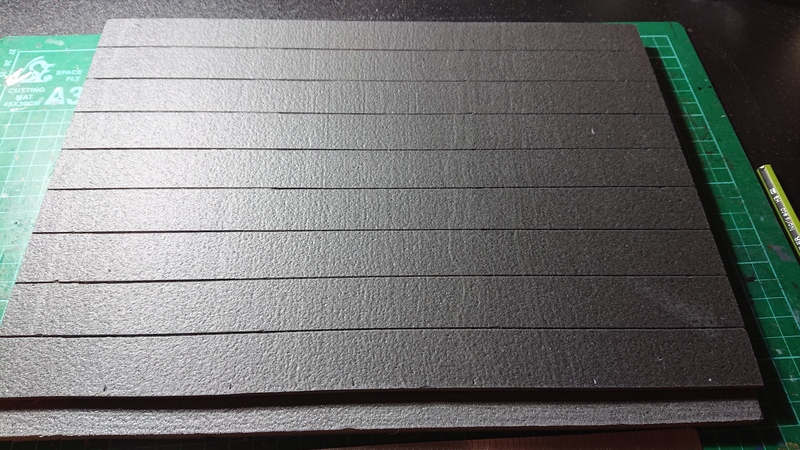 The diorama is made from insulation foam board, held together with magnetic tape. 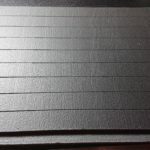 Since I have used magnetic tape, it means its can be expanded upon at a later date. 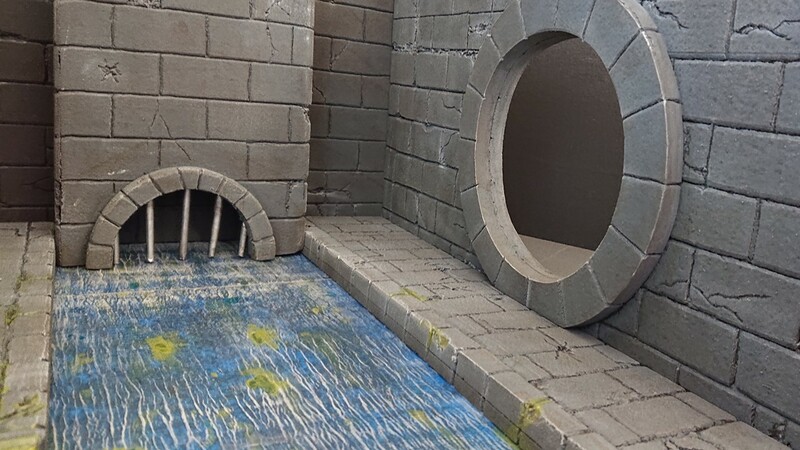 Either adding in extra rooms or sewer tunnels. 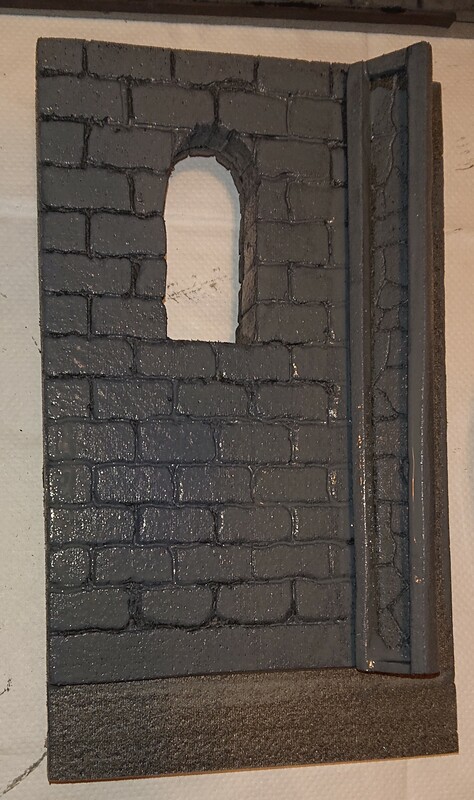 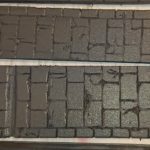 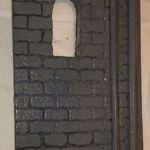 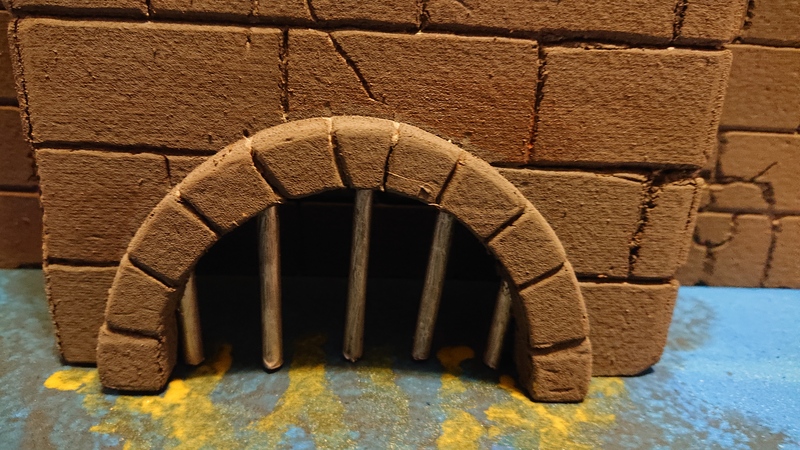 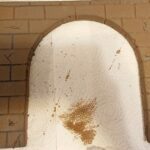 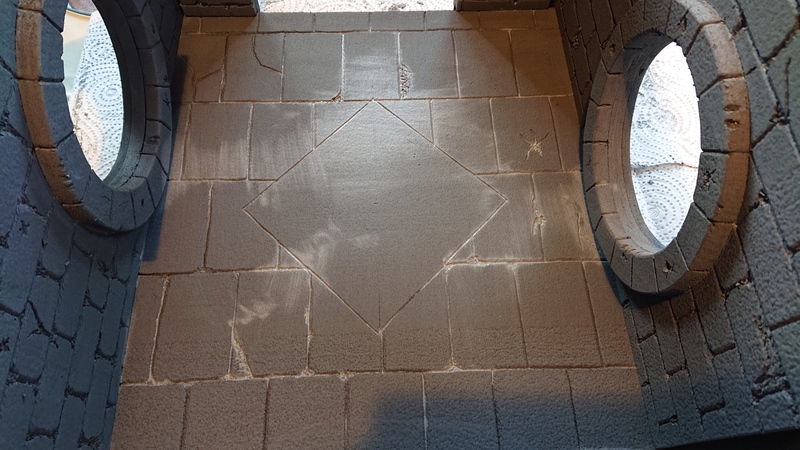 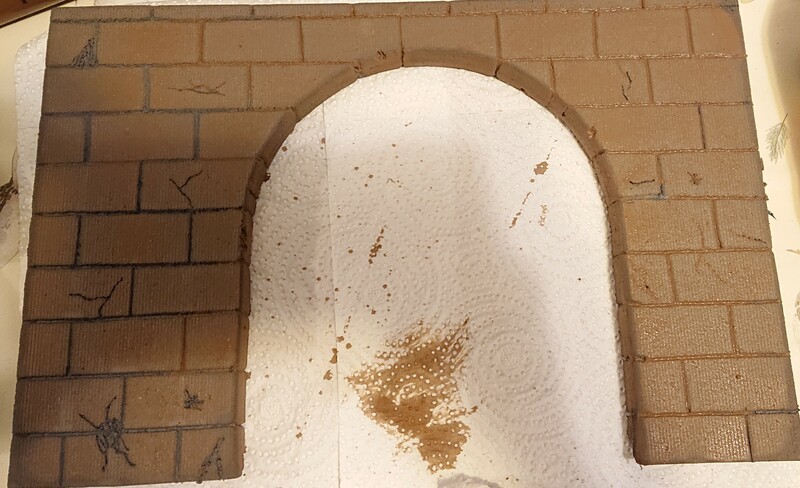 Decided to etch in brick work to outside of one of the doors, followed up with brick work on the sewer tunnels. 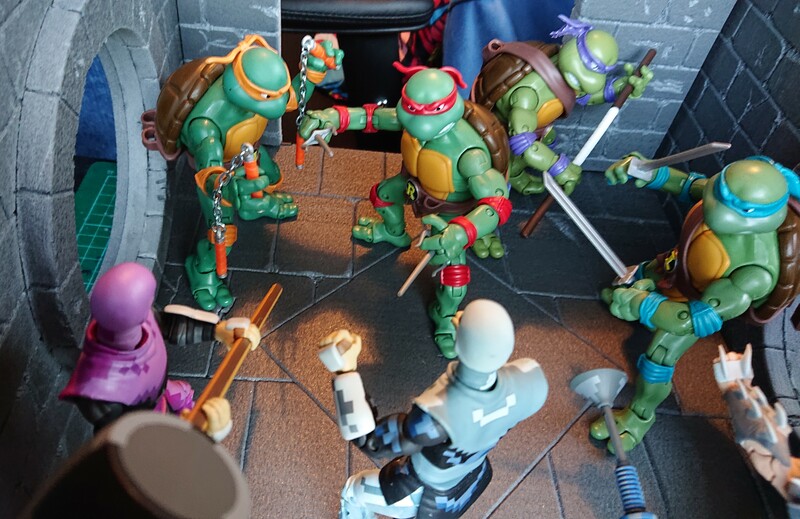 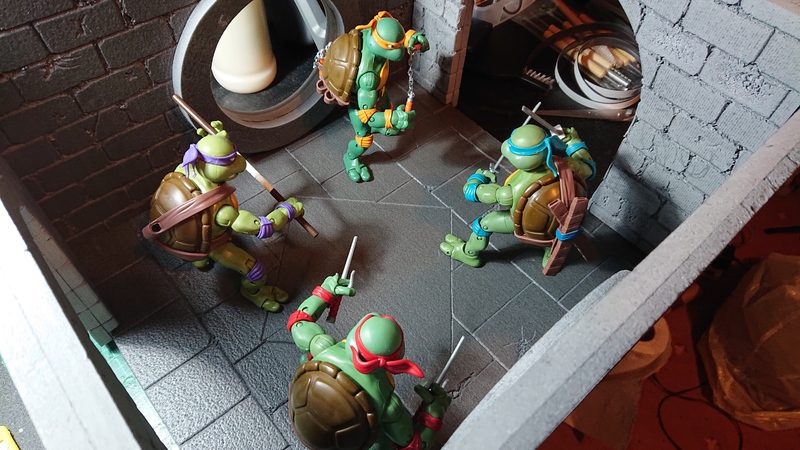 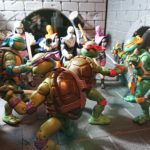 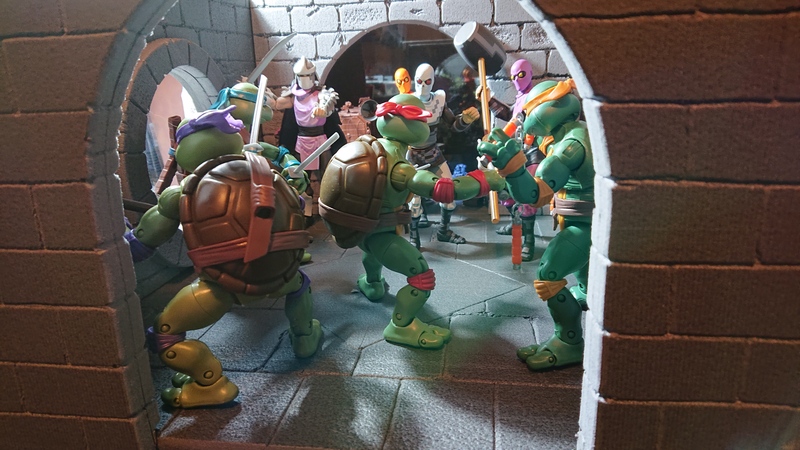 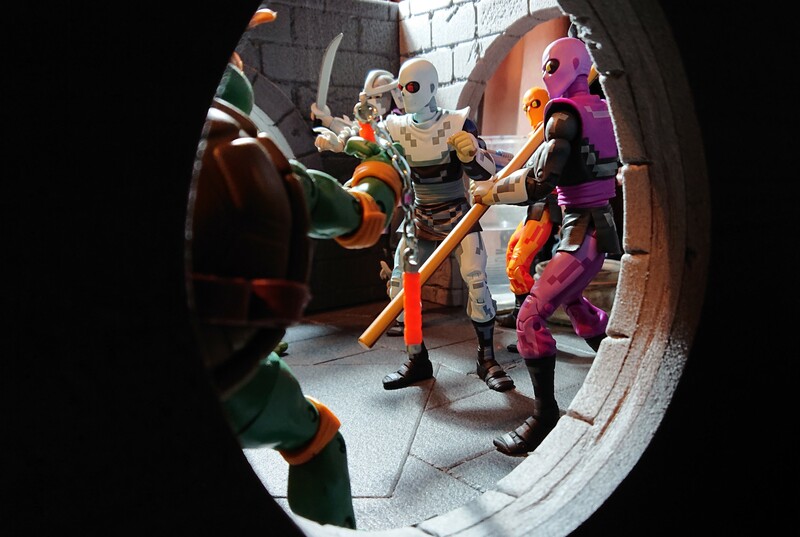 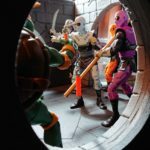 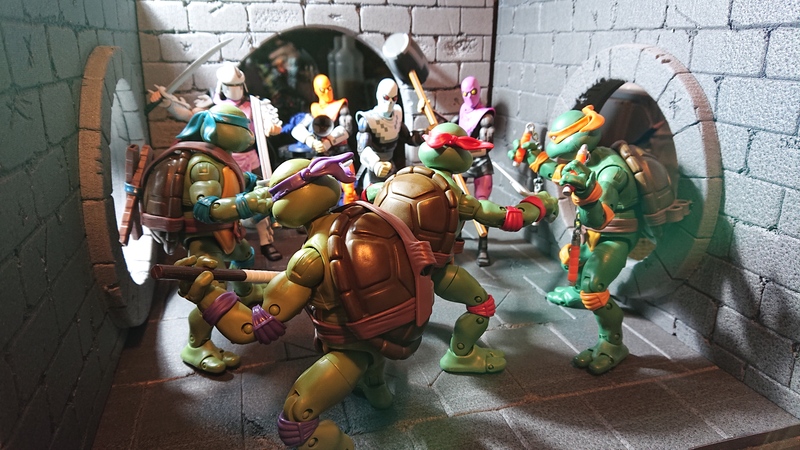 Finished the night of with some test shots of the Turtles facing down Shredder and his Foot soldiers. 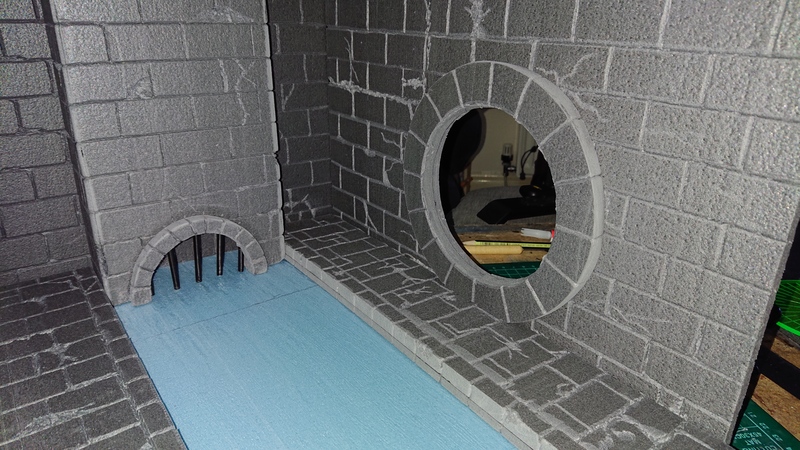 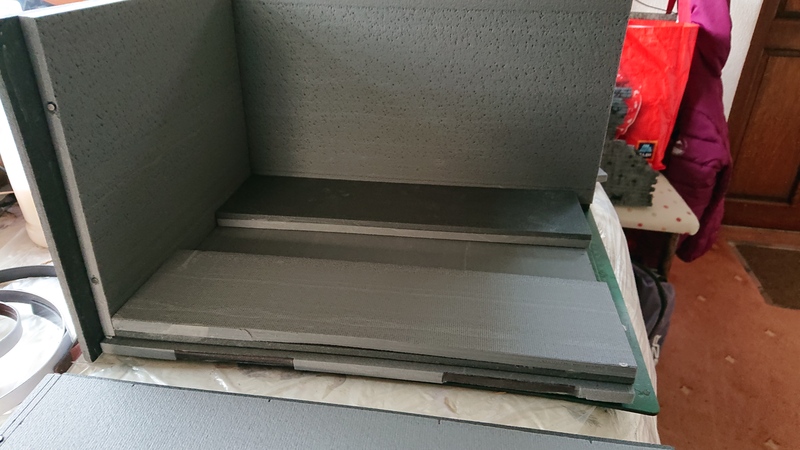 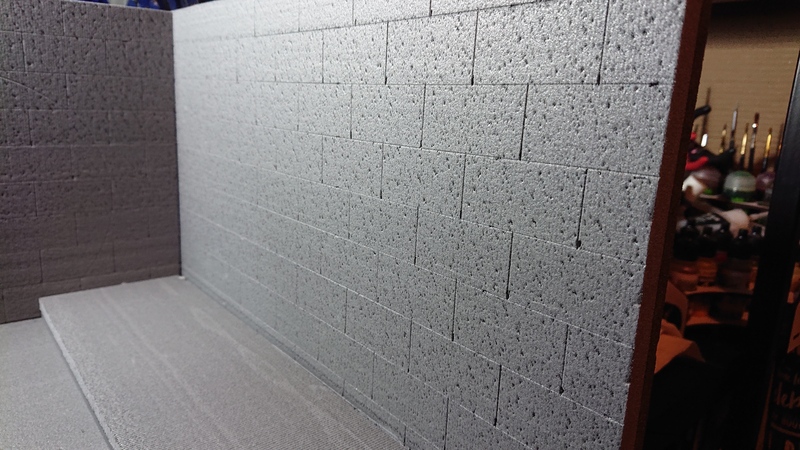 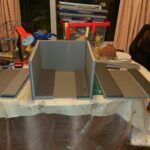 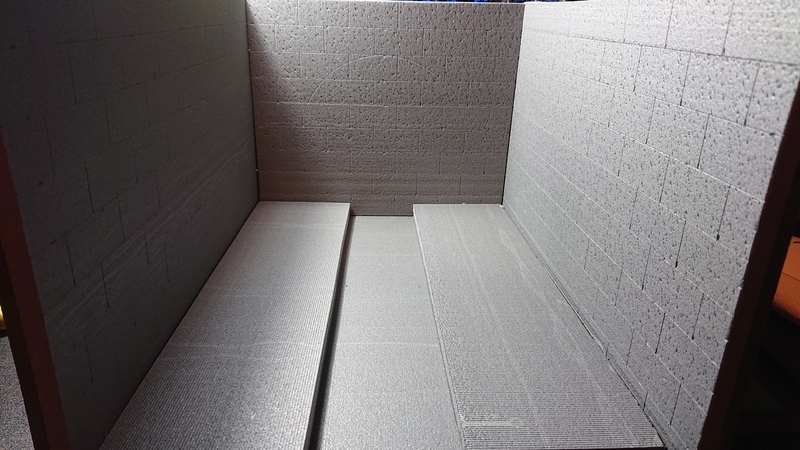 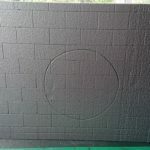 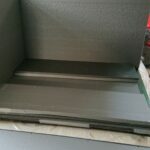 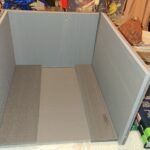 Grey acrylic base coat was applied to all the inside walls, floor and the one outer wall. 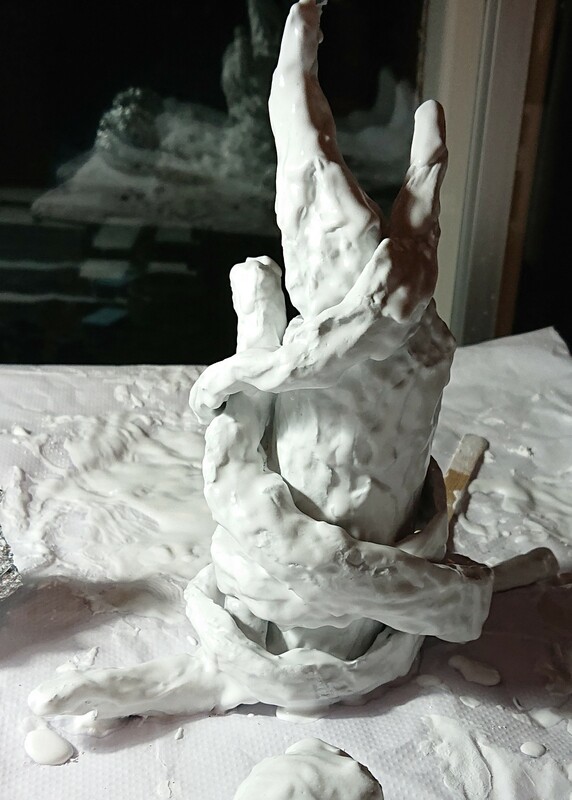 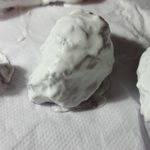 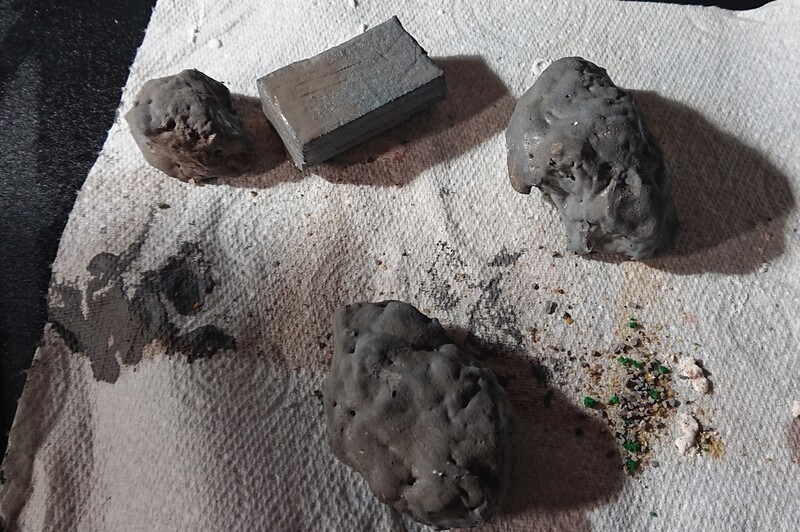 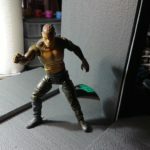 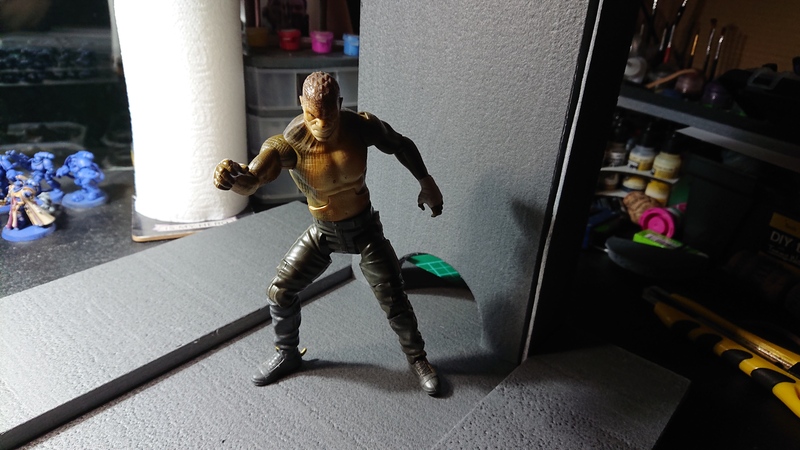 I washed over the entire inside of the model with a light brown which I applied using a sponge. 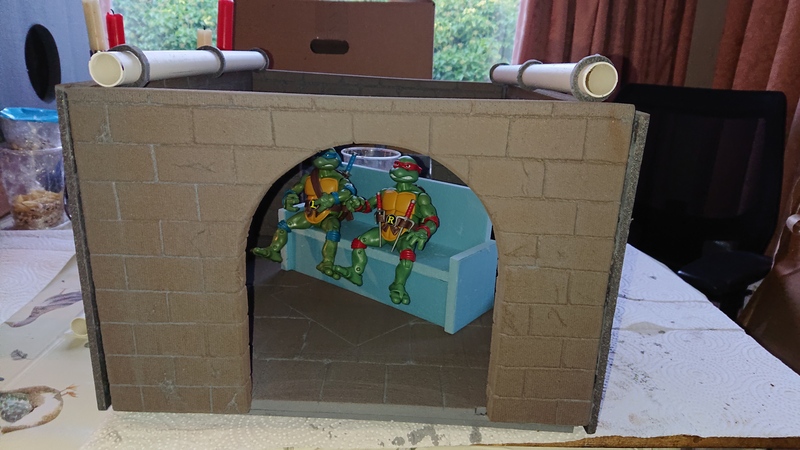 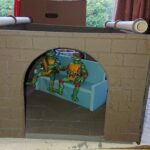 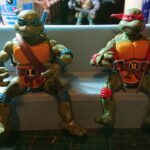 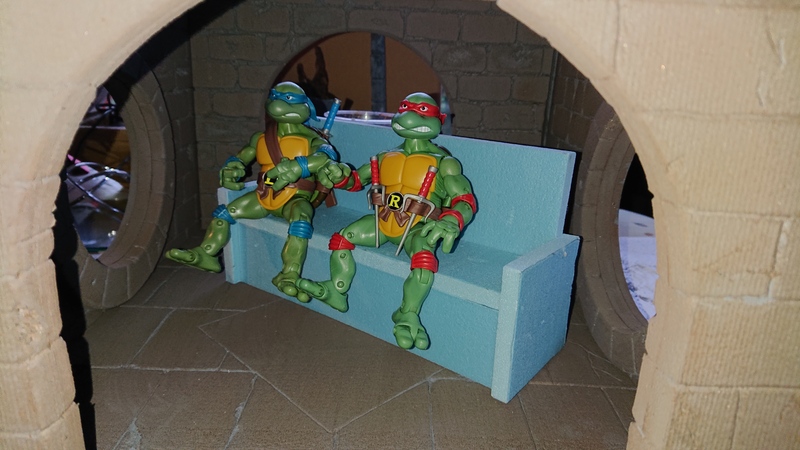 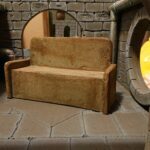 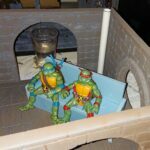 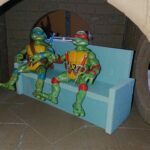 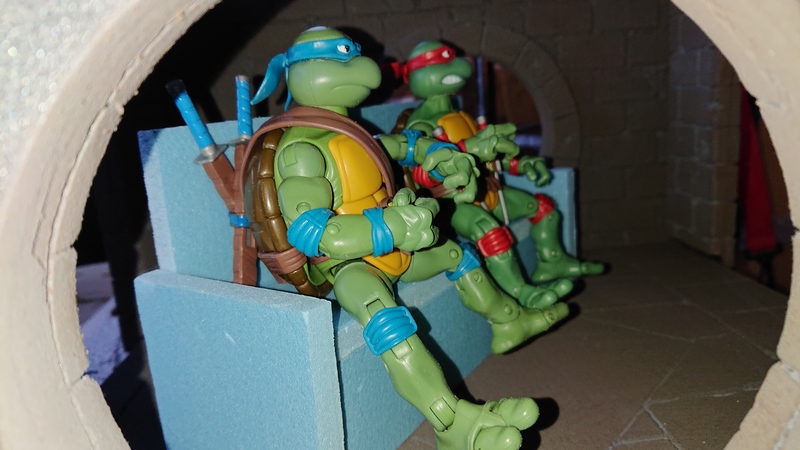 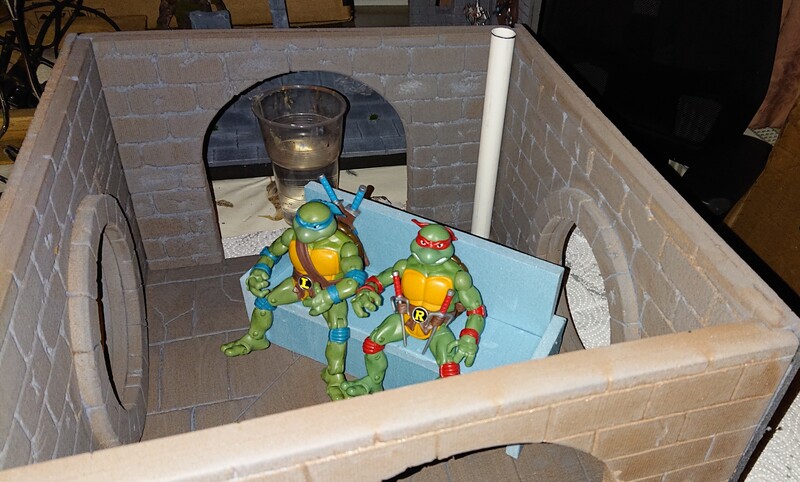 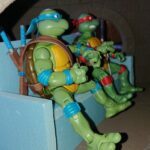 With that trying I turned my attention to creating one of the main pieces of furniture for any Turtle lair, the sofa! 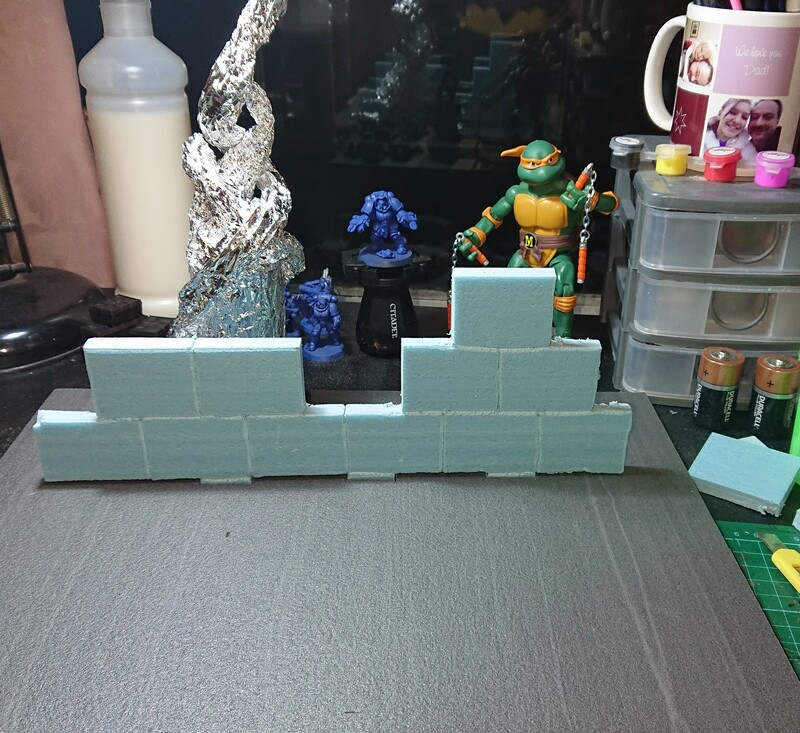 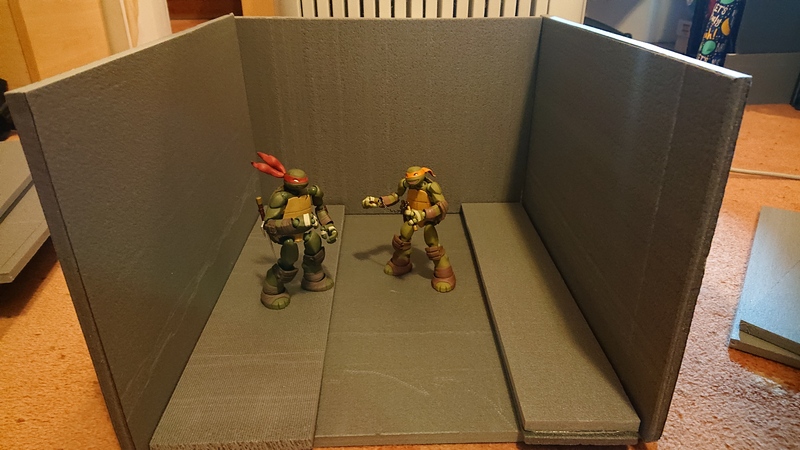 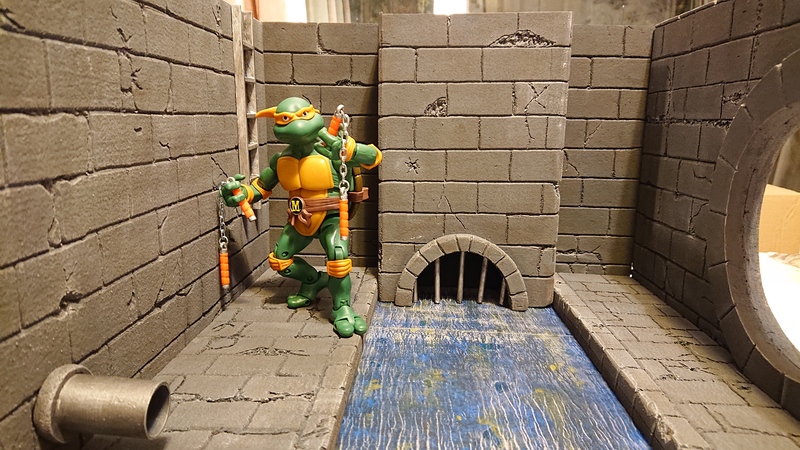 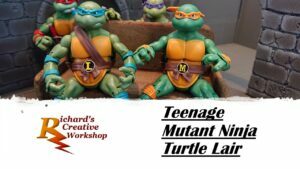 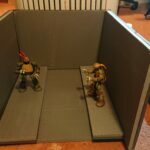 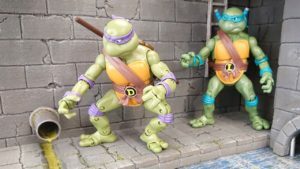 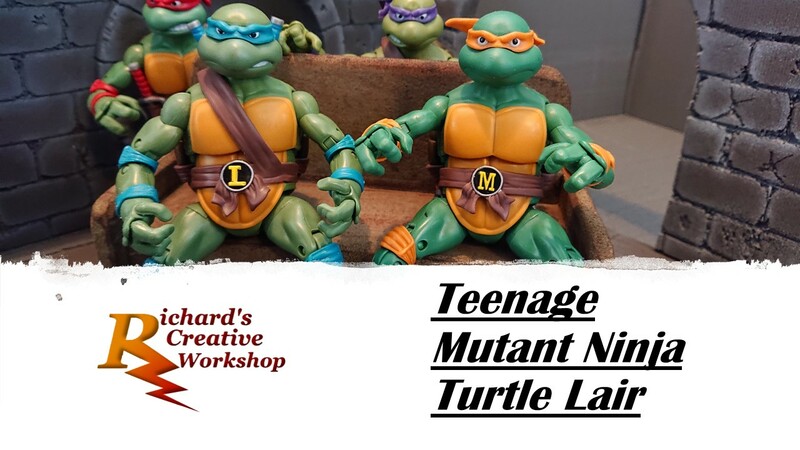 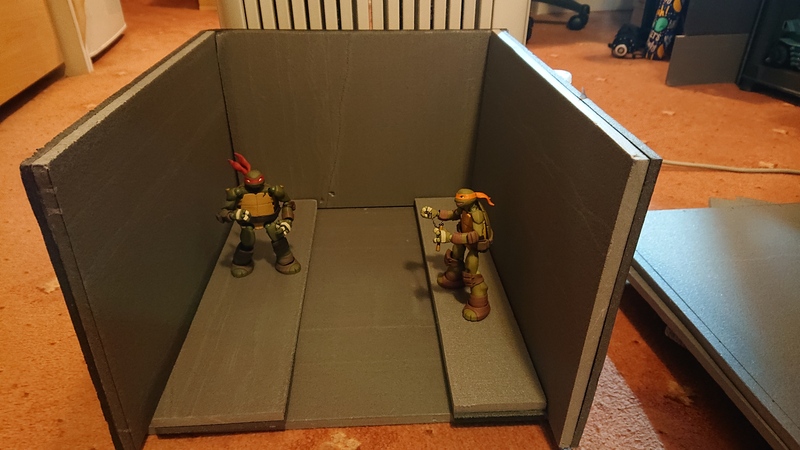 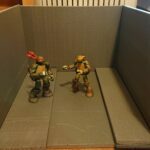 Making this out of 10 mm foam board to fit two turtles. 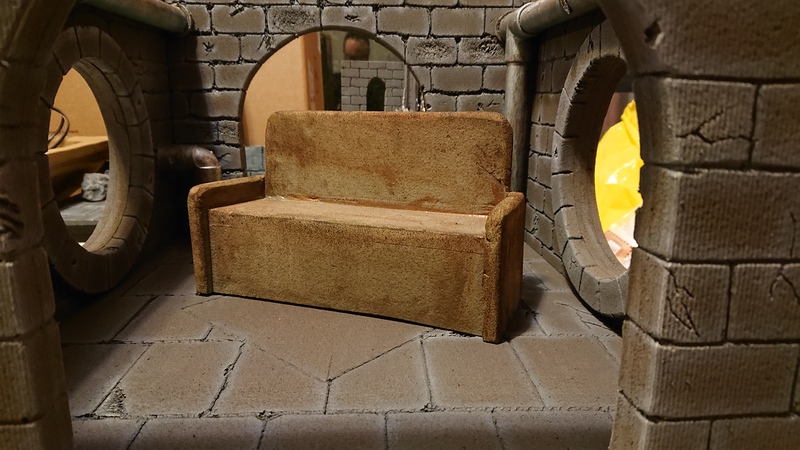 Placing the sofa around the lair, I’ve realized I need to trim an inch off the sofa so it doesn’t look to fill the room as much as it does now. 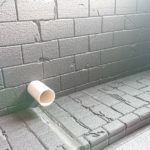 I cut a couple of lengths of pipe which will run the length of each wall, as you can see they are only resting on top while finish off painting the walls before attaching them. 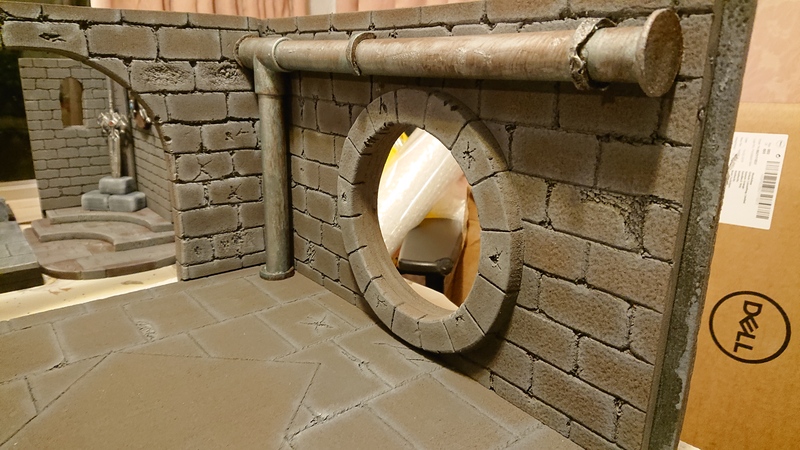 I applied a second wash of grey over all the walls, while they were drying I turned my attention to trimming an inch off the sofa and cutting the pipes down to size. 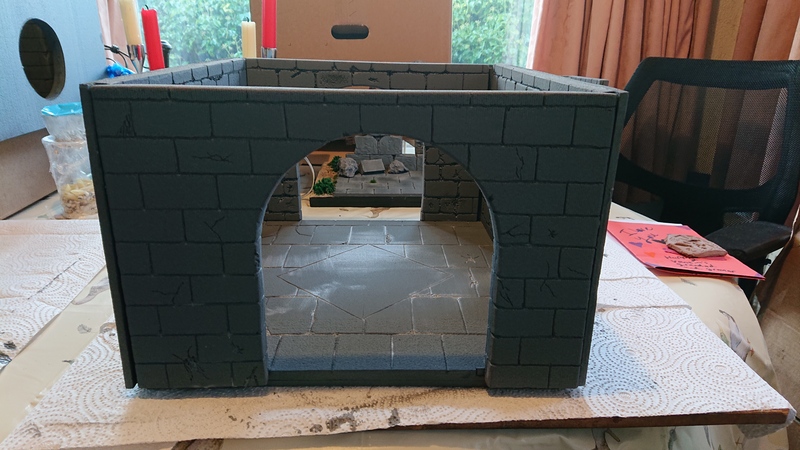 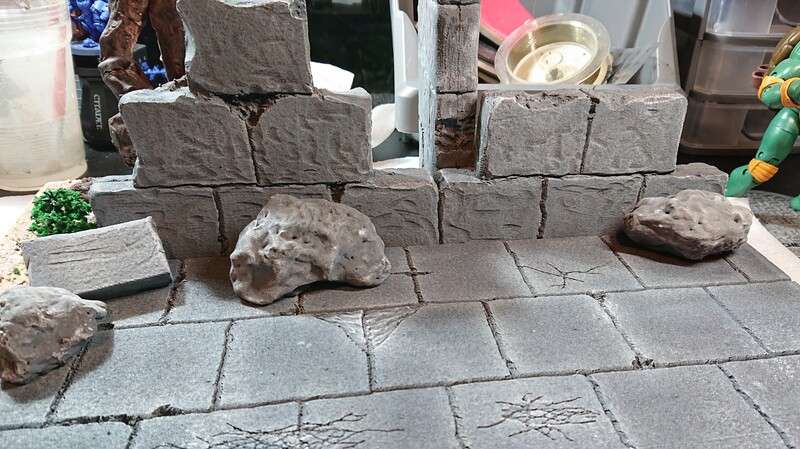 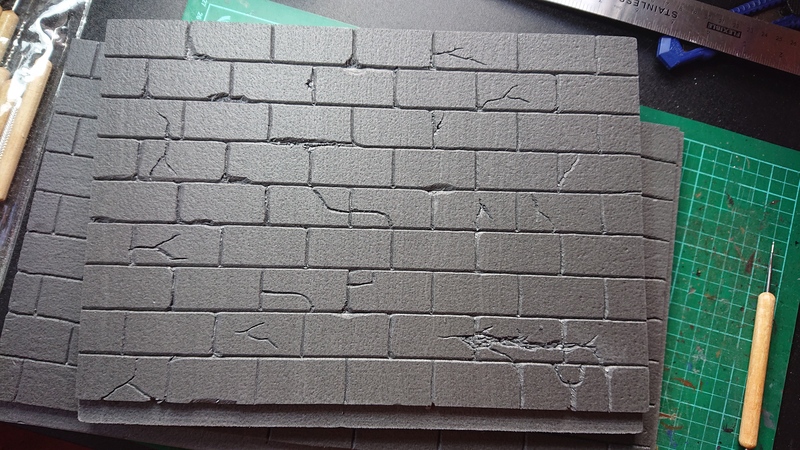 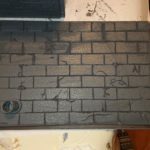 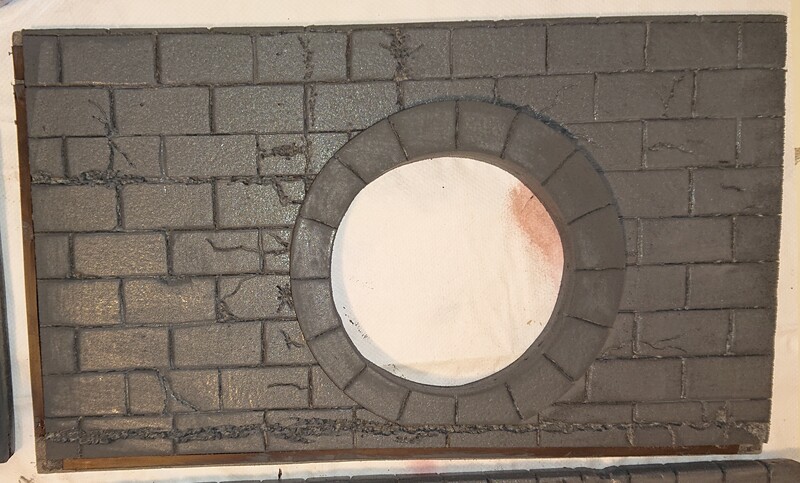 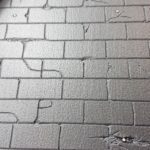 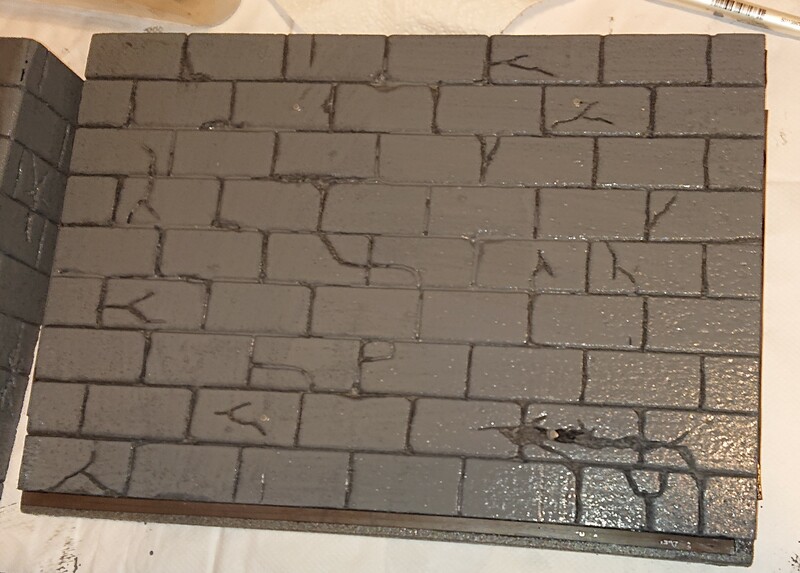 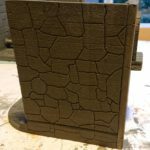 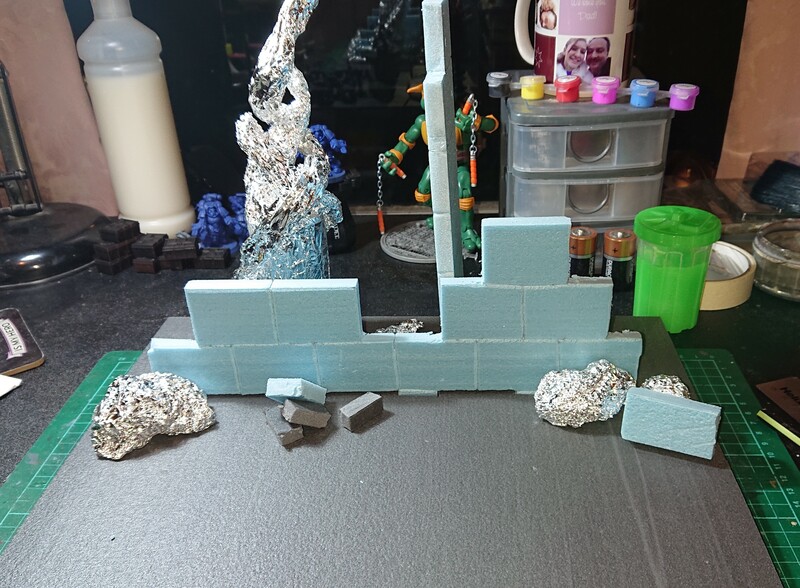 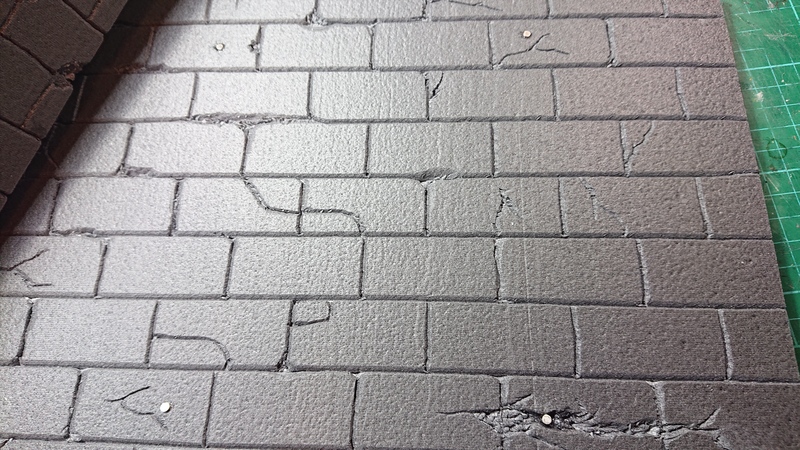 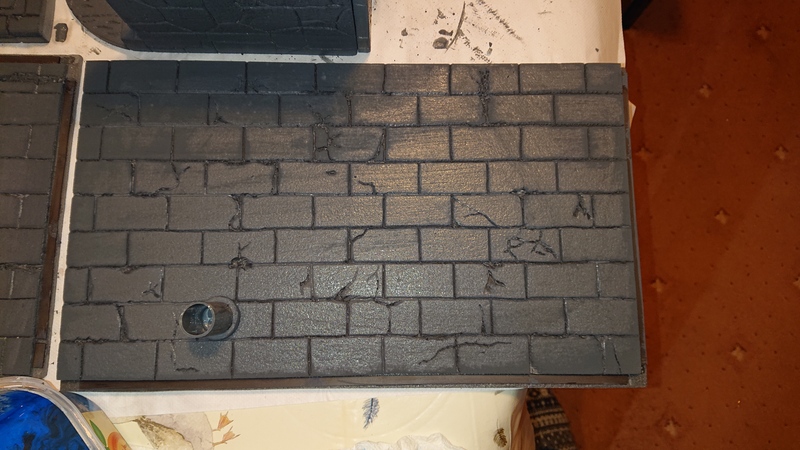 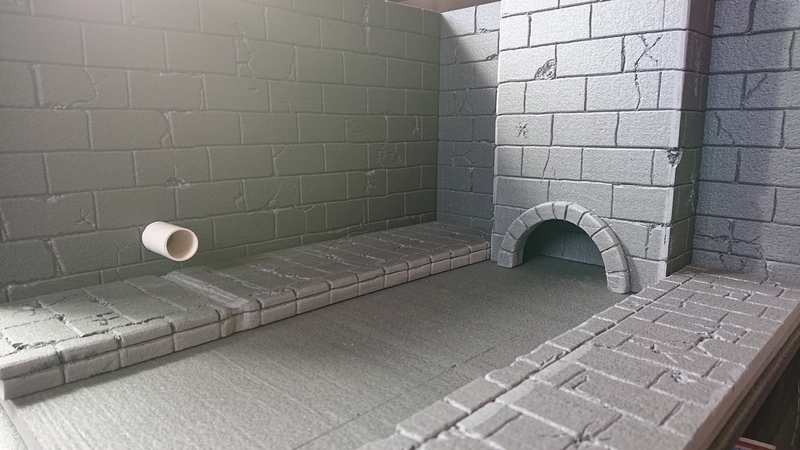 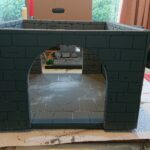 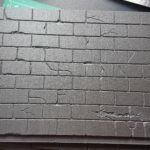 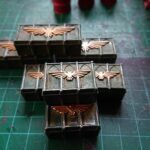 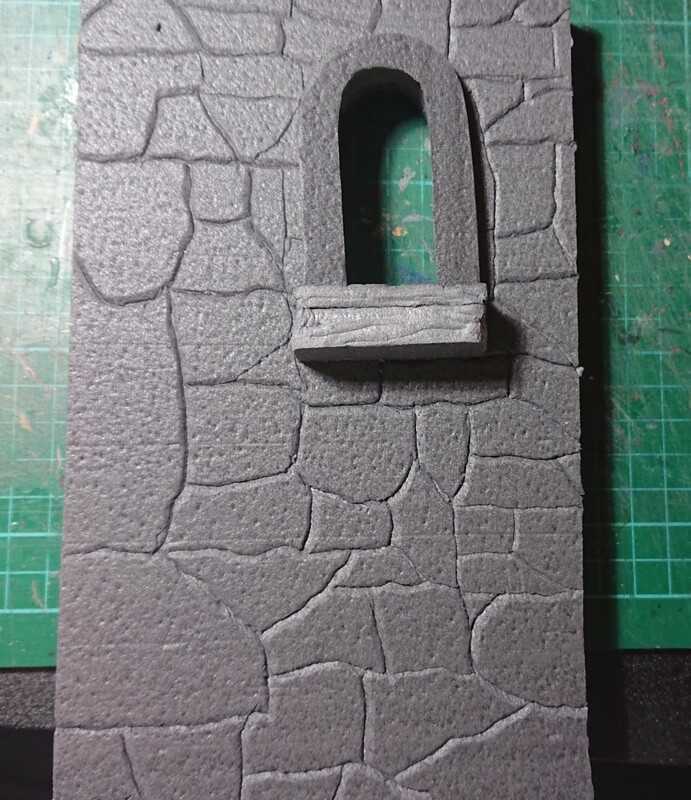 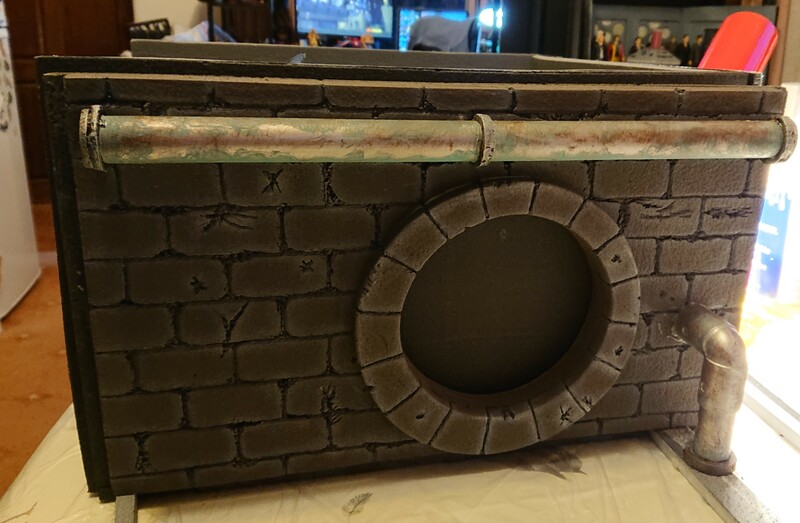 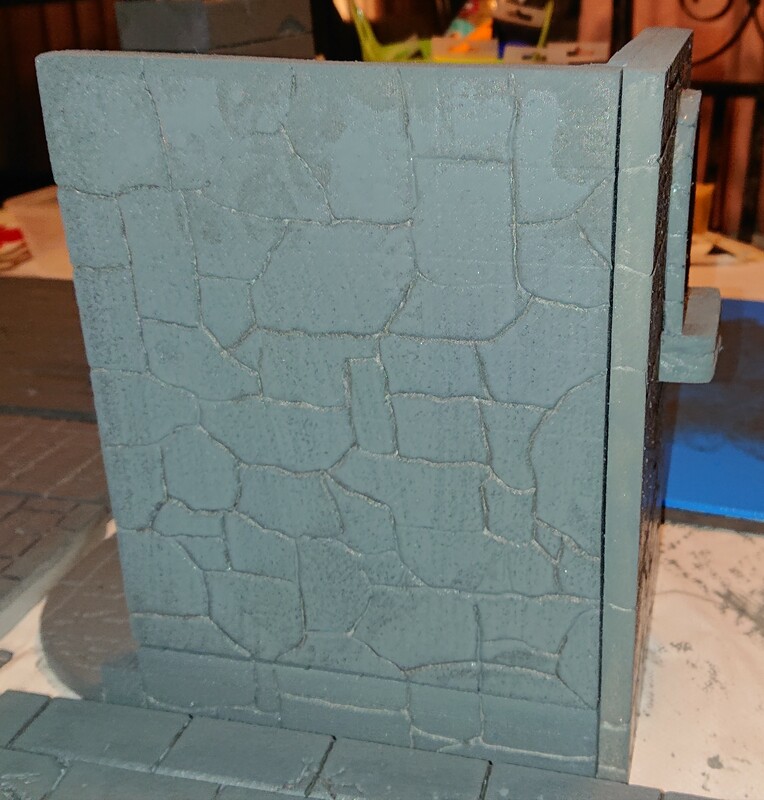 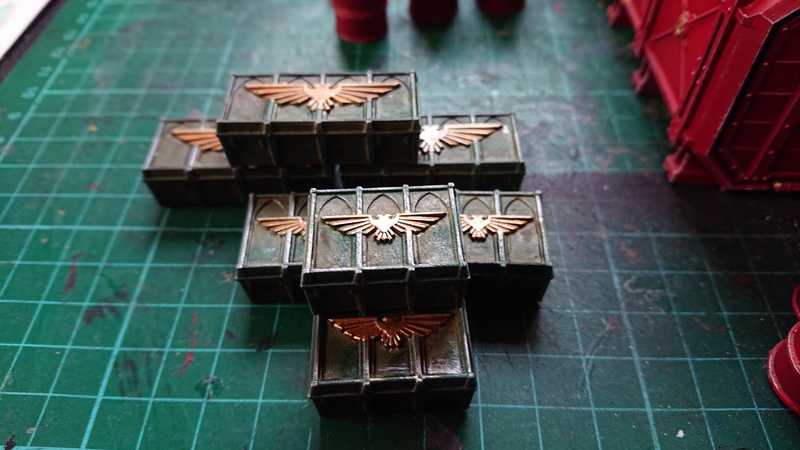 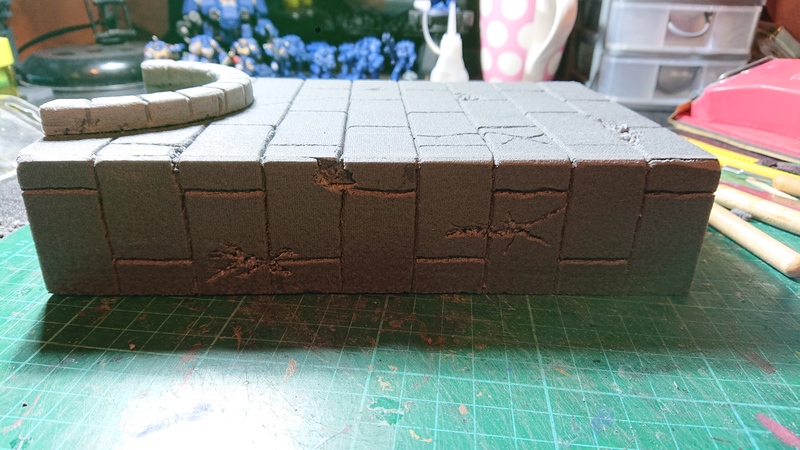 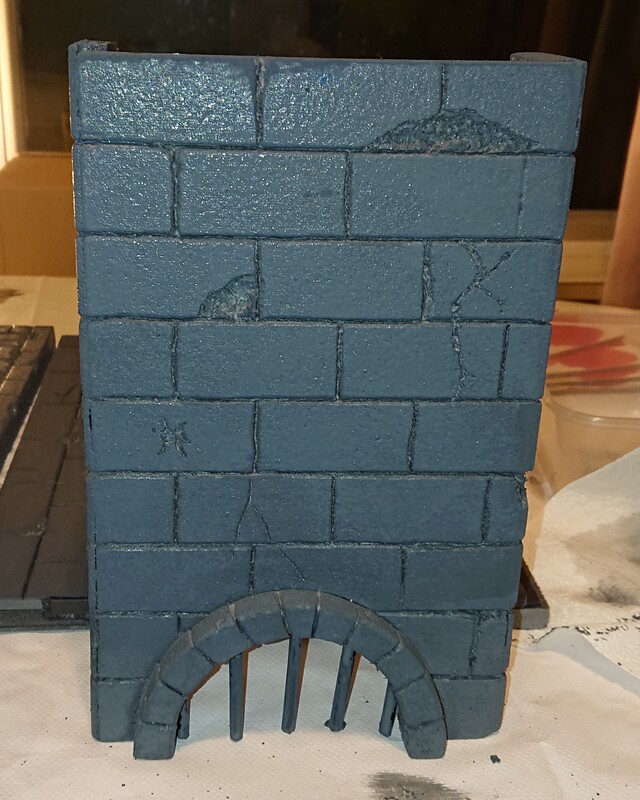 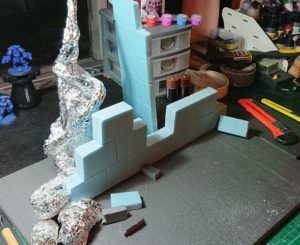 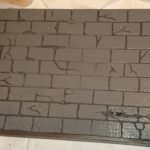 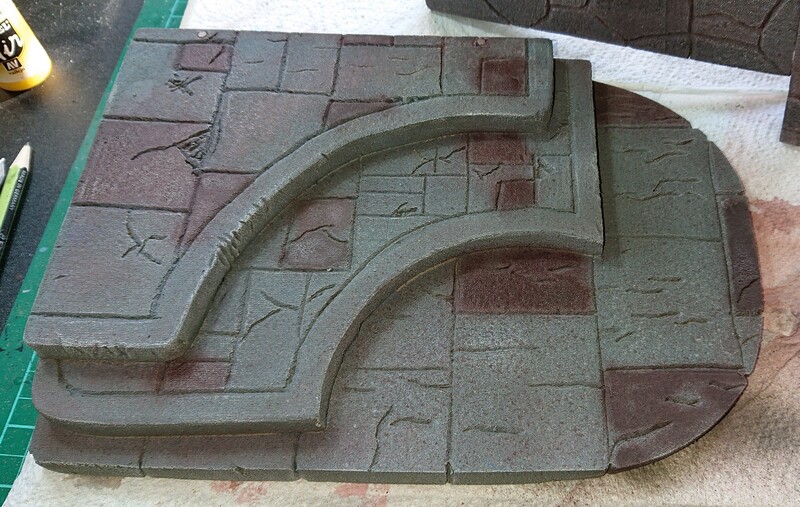 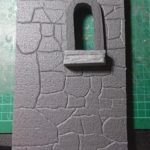 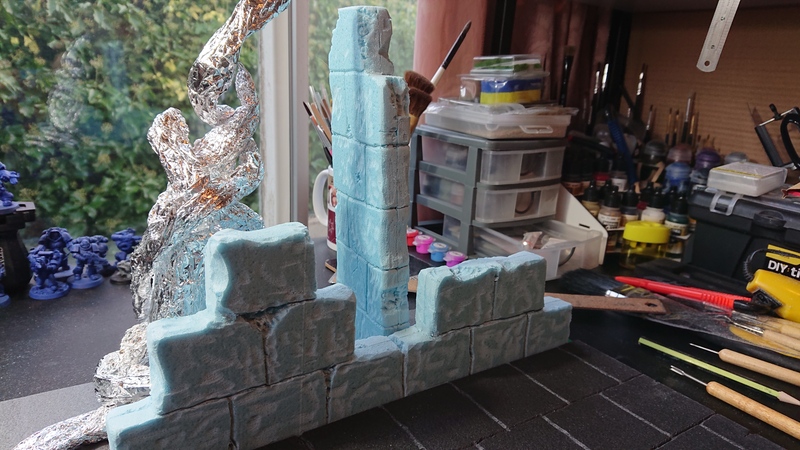 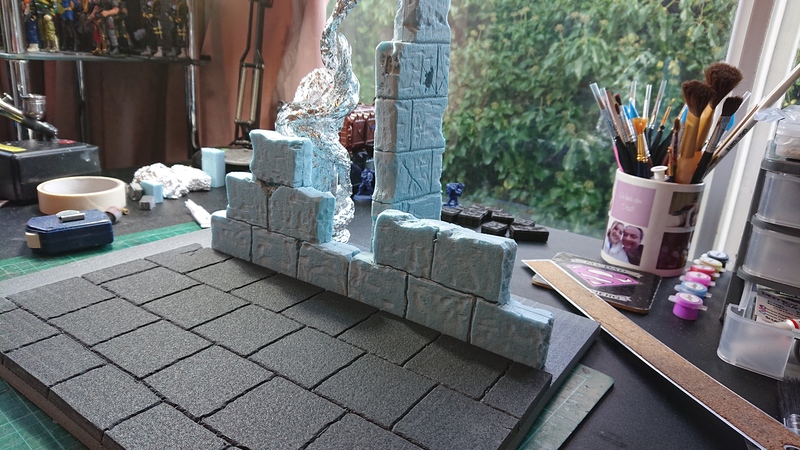 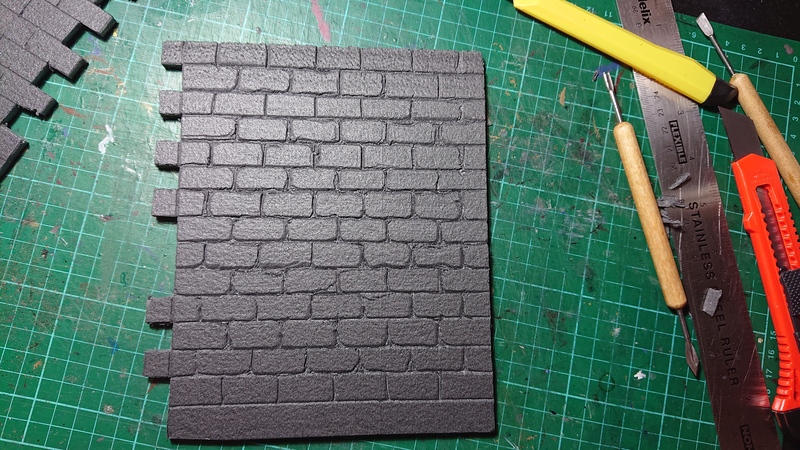 Using the airbrush to go round each brick and every crack using a light grey. 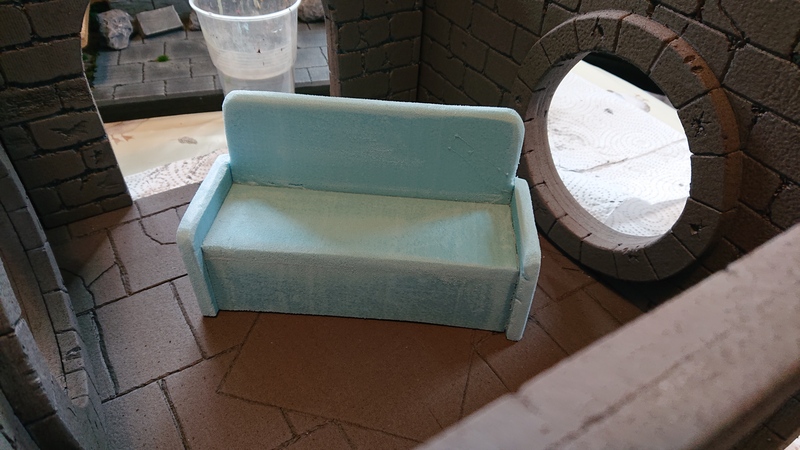 The sofa was given a coat of lime green (I know it looked awful! 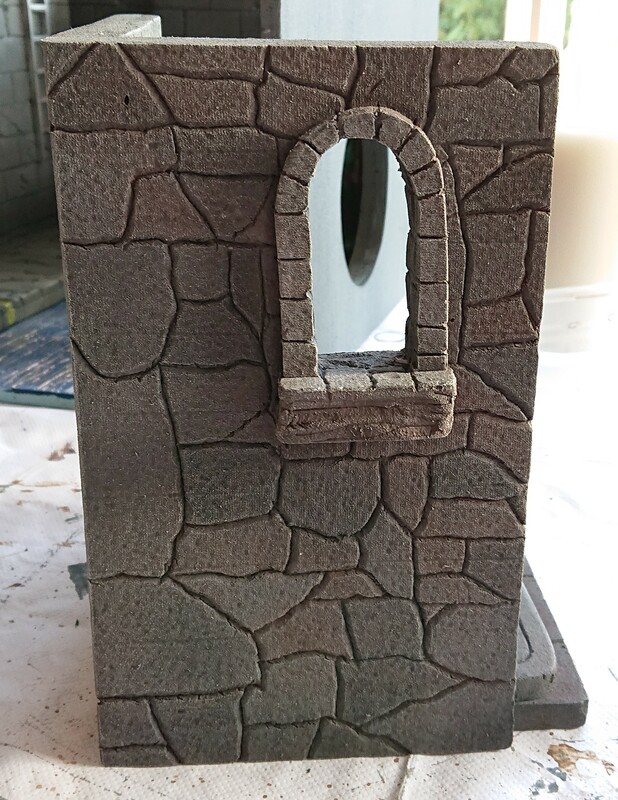 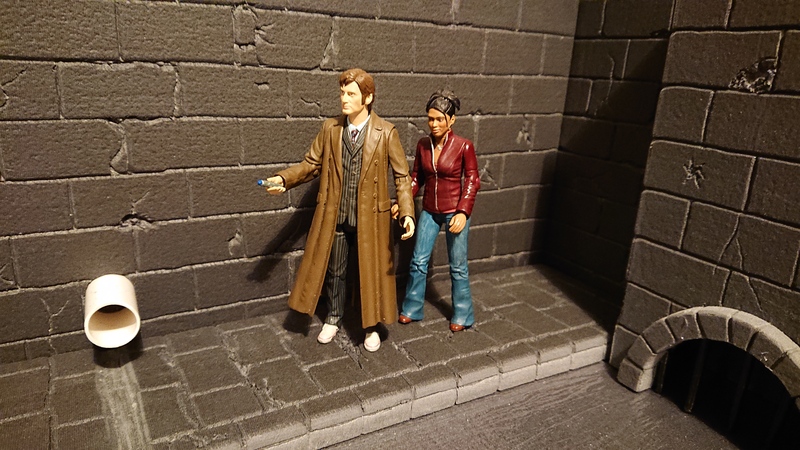 ), this was quickly rectified and repainted over with a light brown. 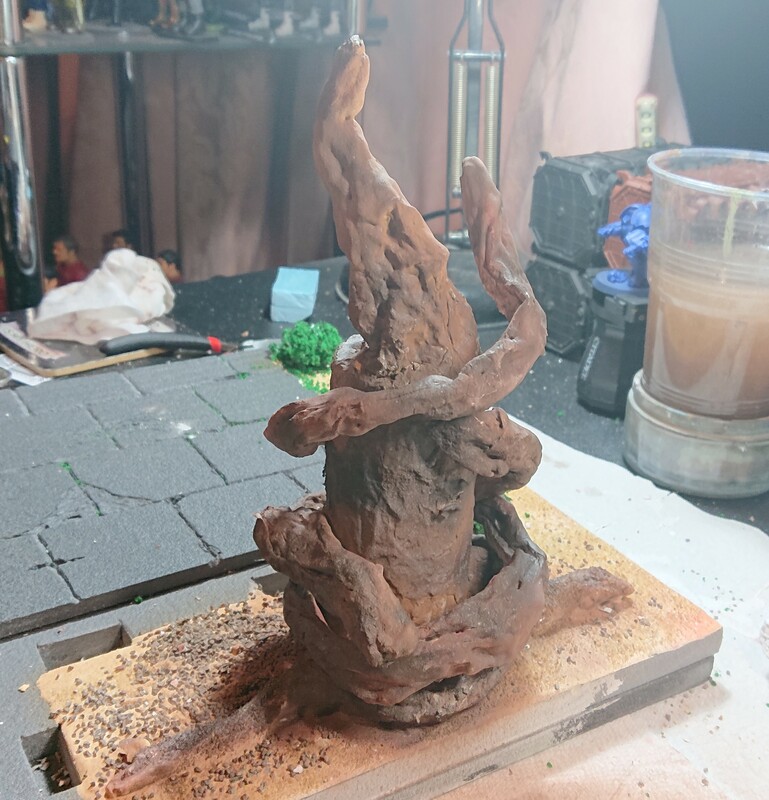 Once it had dried I dry brushed a dark brown over to weather it. 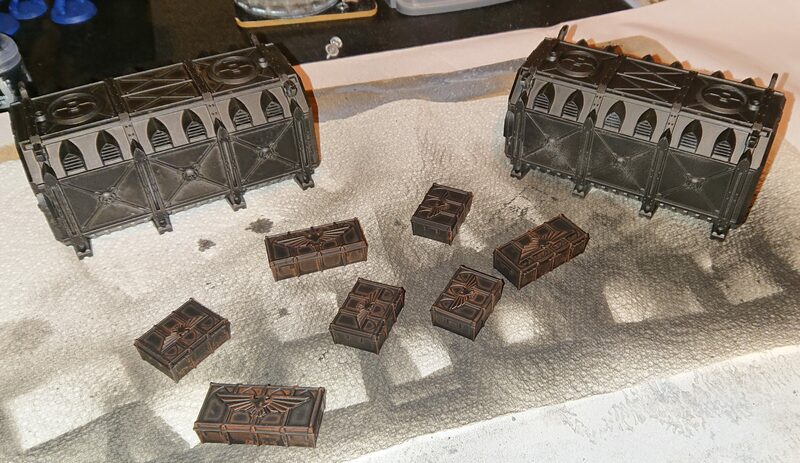 I spray painted the pipes with a black base coat, followed with an aluminium layer. 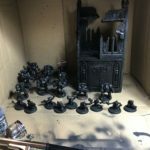 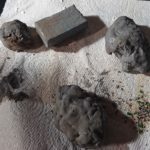 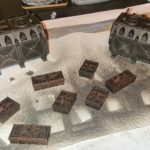 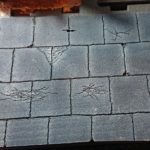 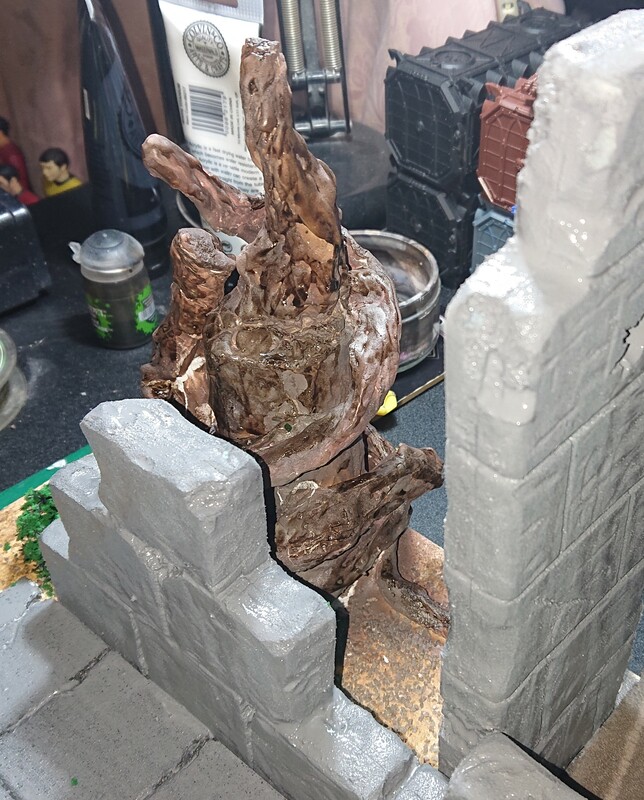 They were dry brushed with Games Workshops Dryad Bark and Necron Compound. 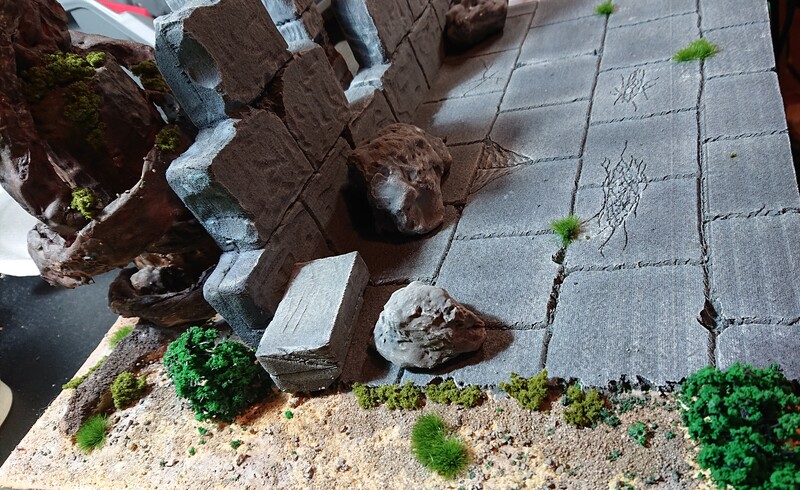 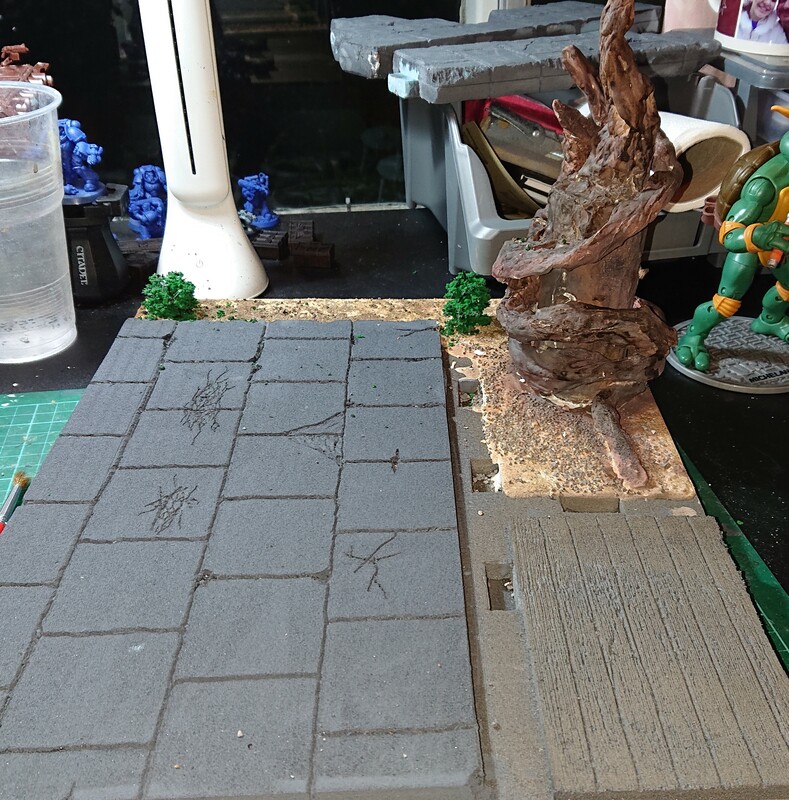 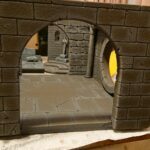 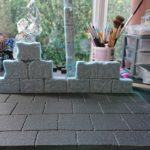 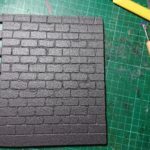 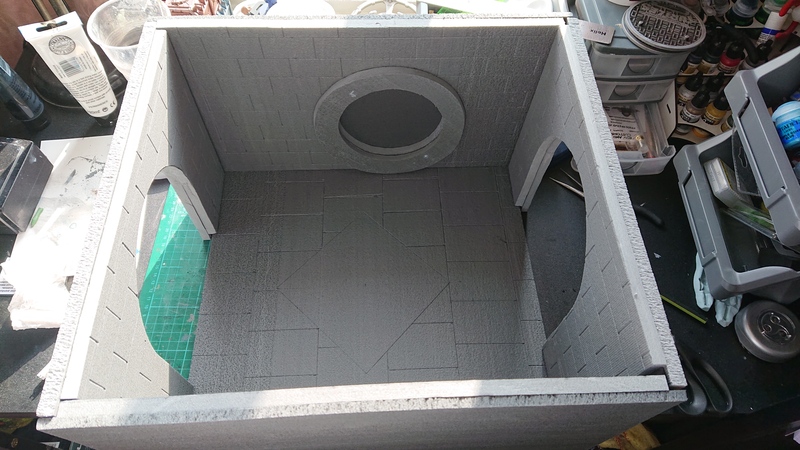 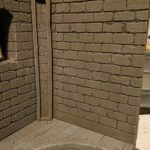 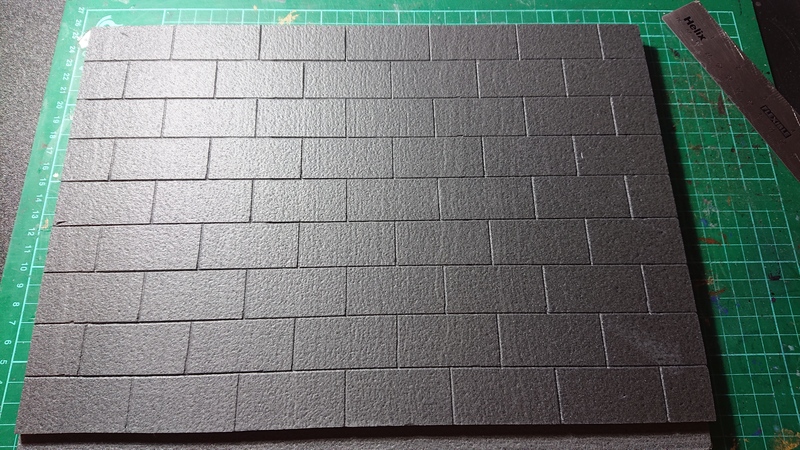 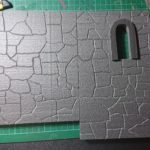 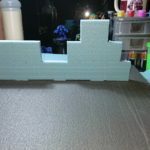 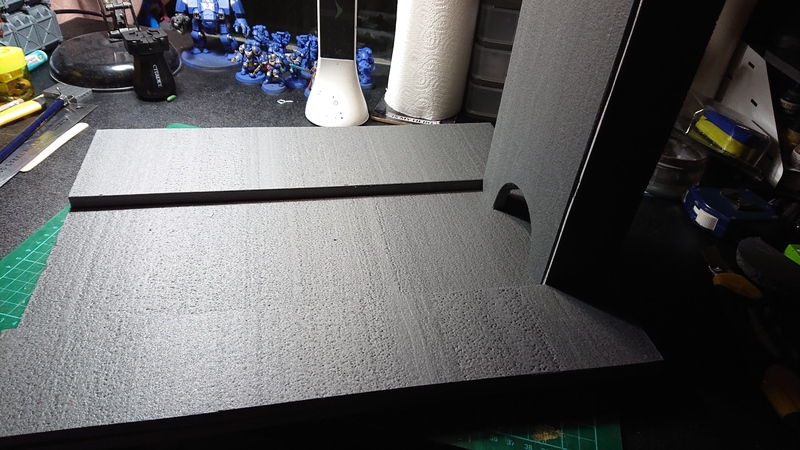 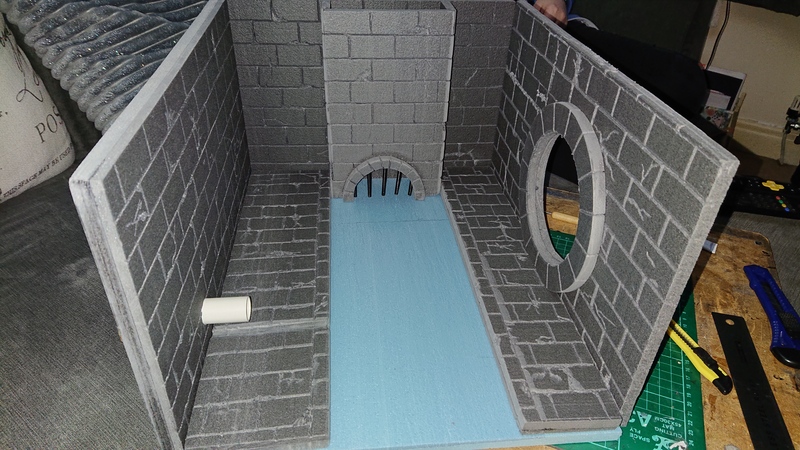 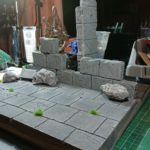 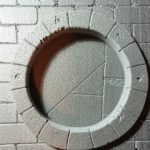 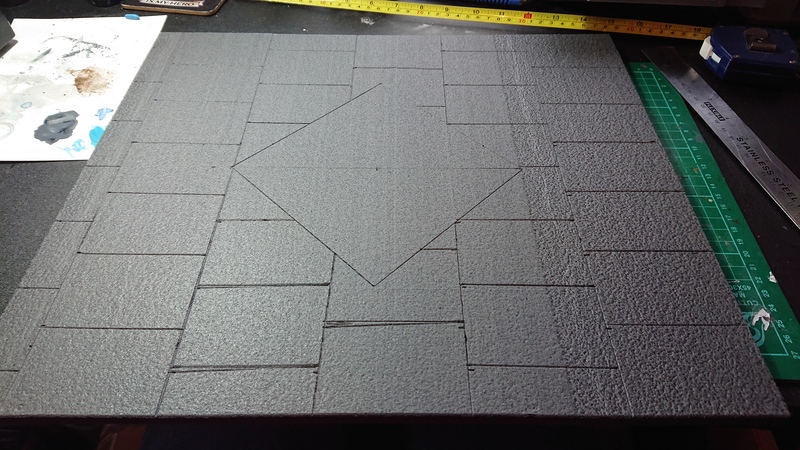 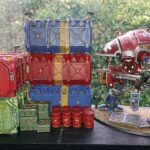 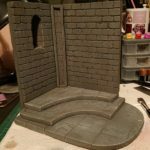 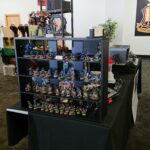 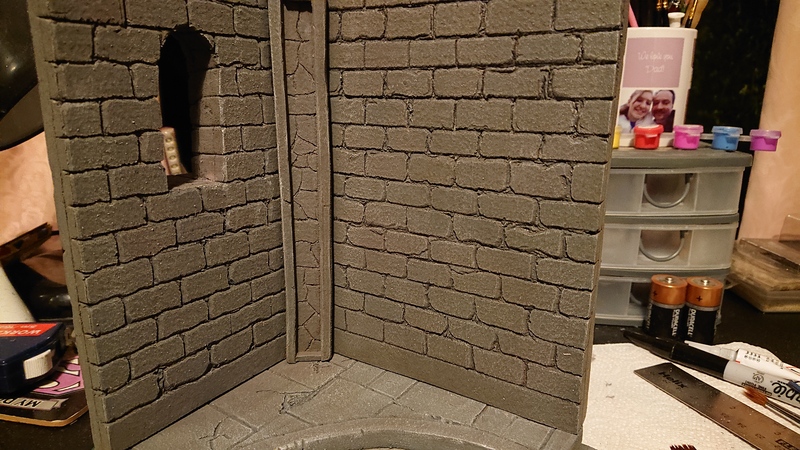 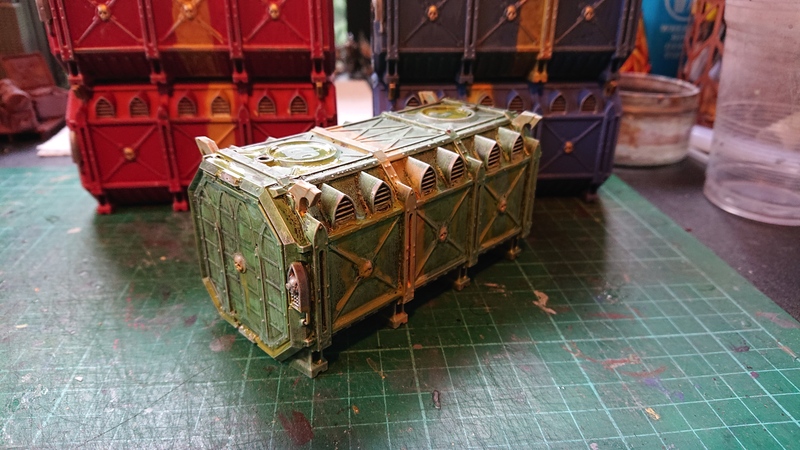 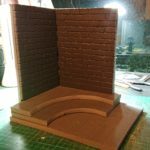 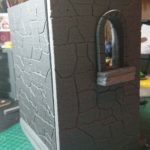 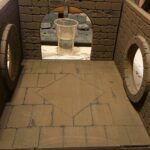 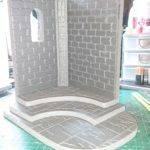 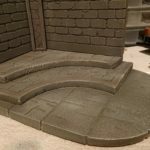 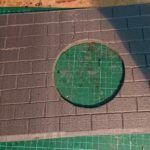 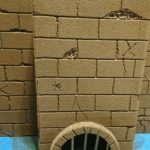 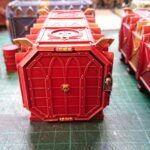 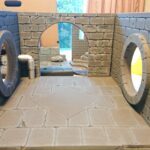 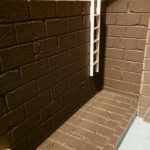 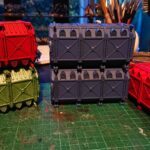 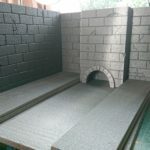 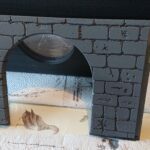 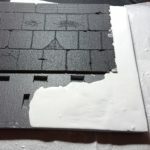 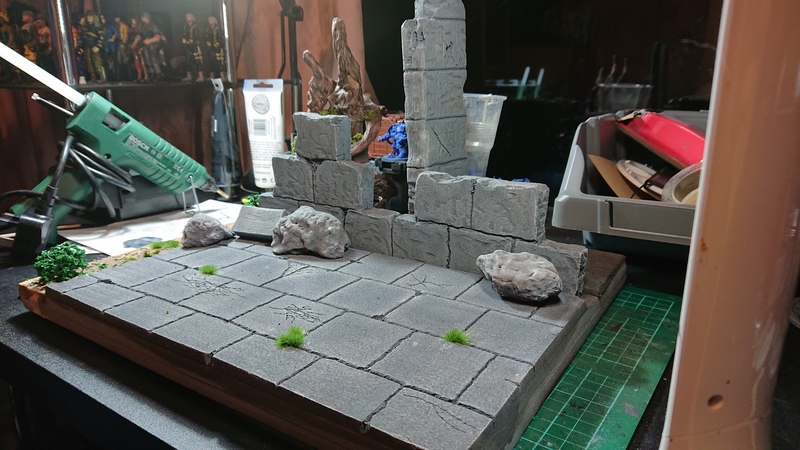 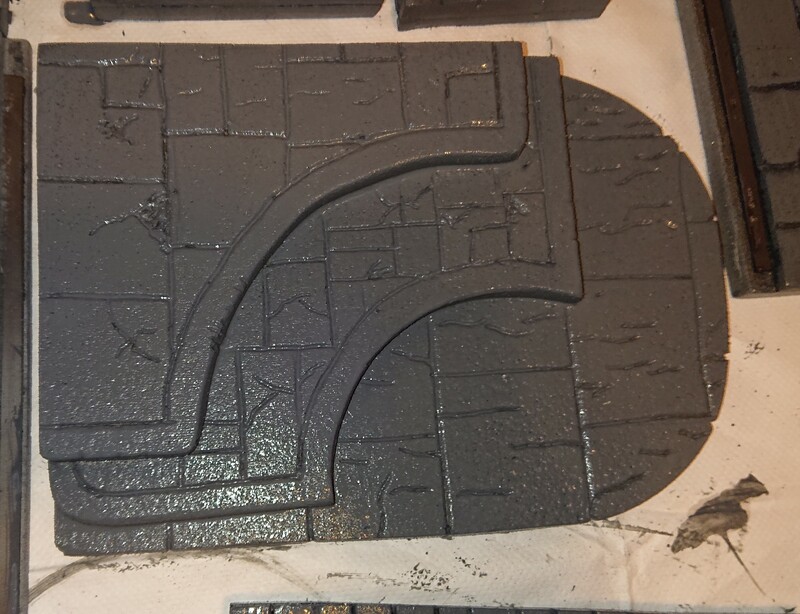 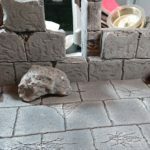 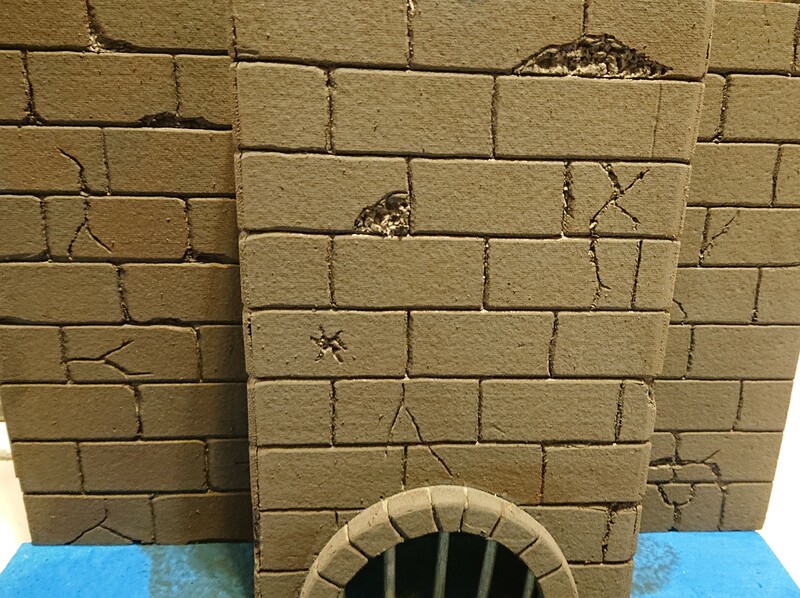 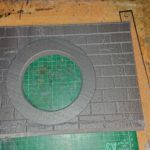 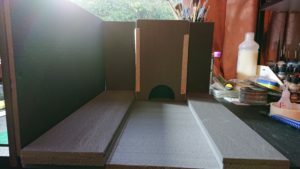 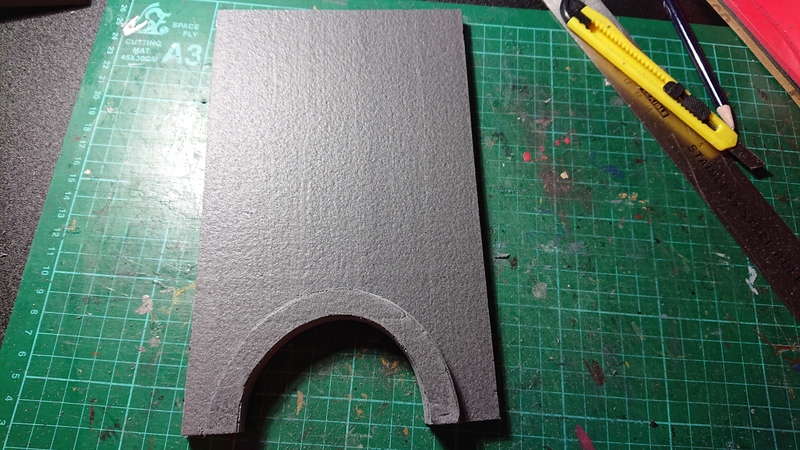 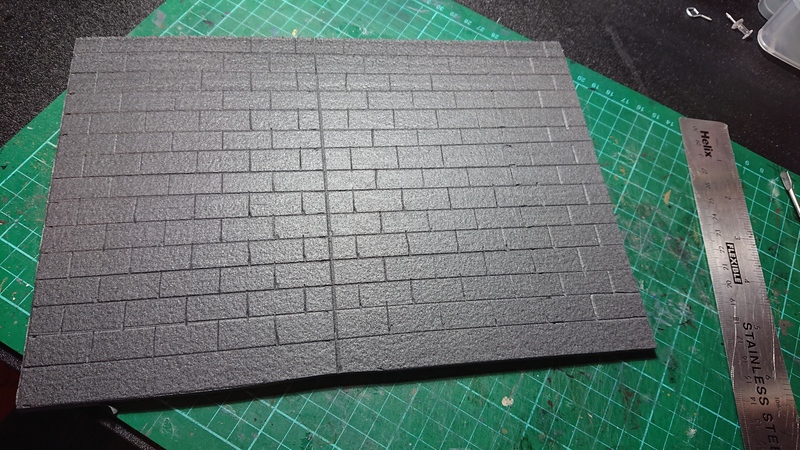 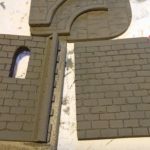 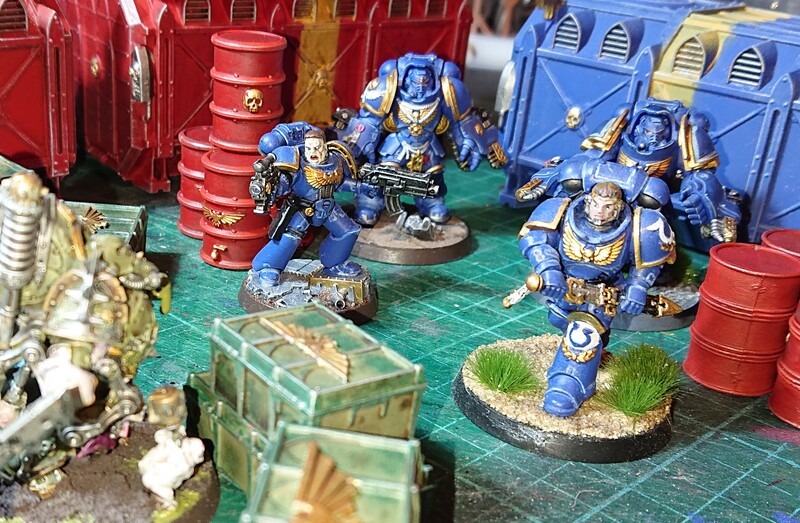 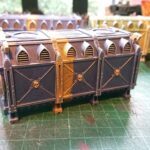 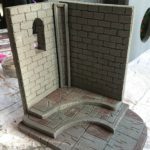 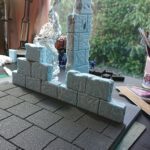 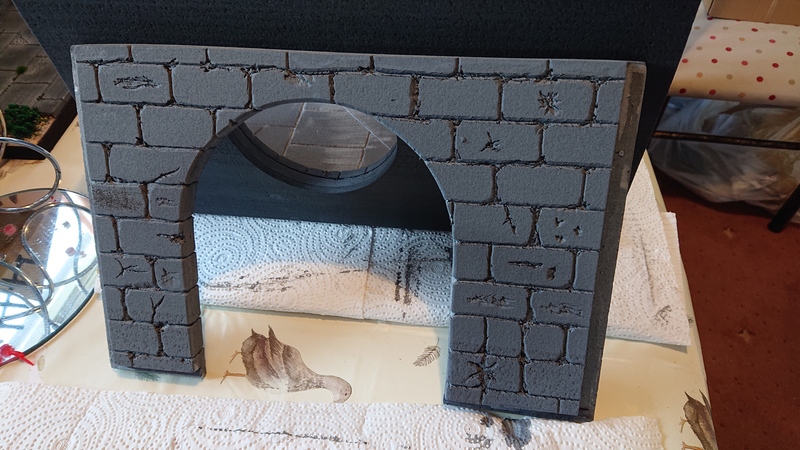 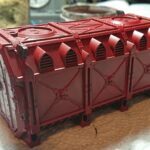 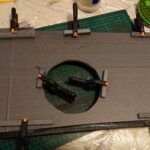 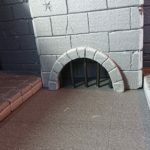 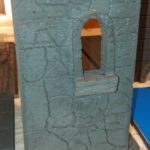 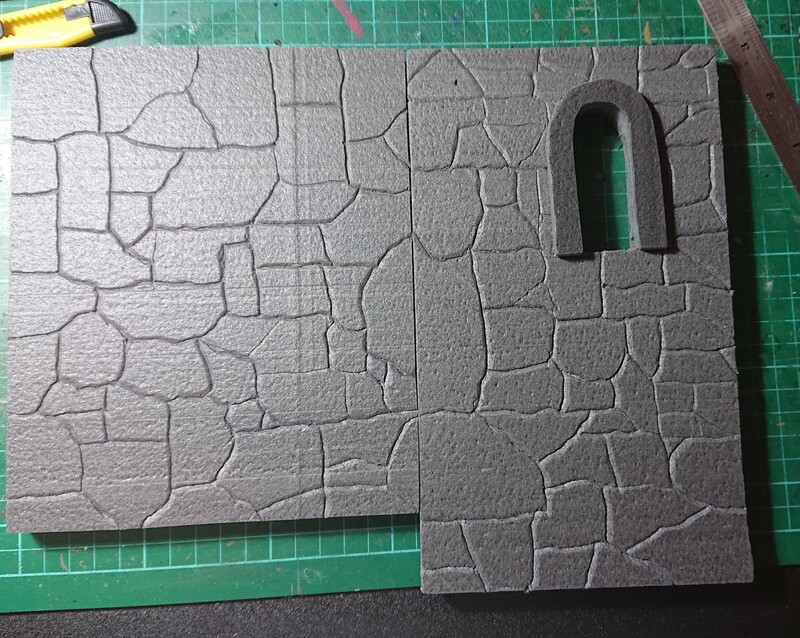 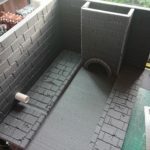 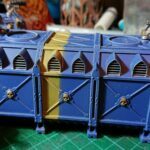 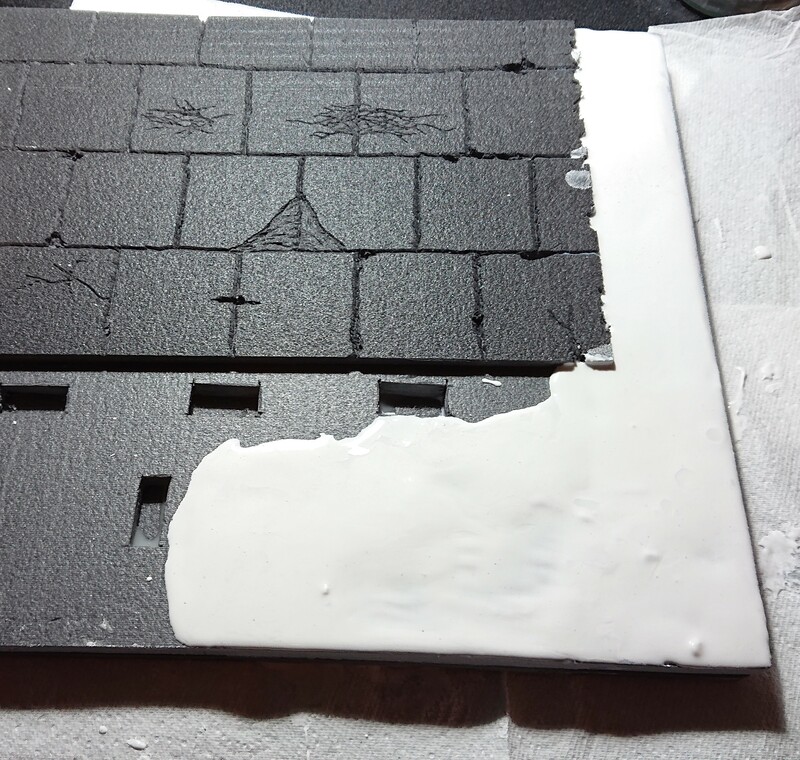 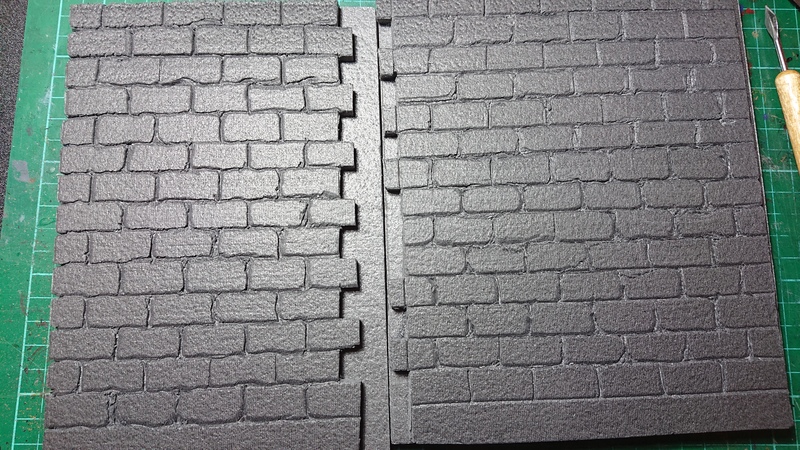 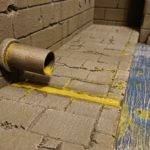 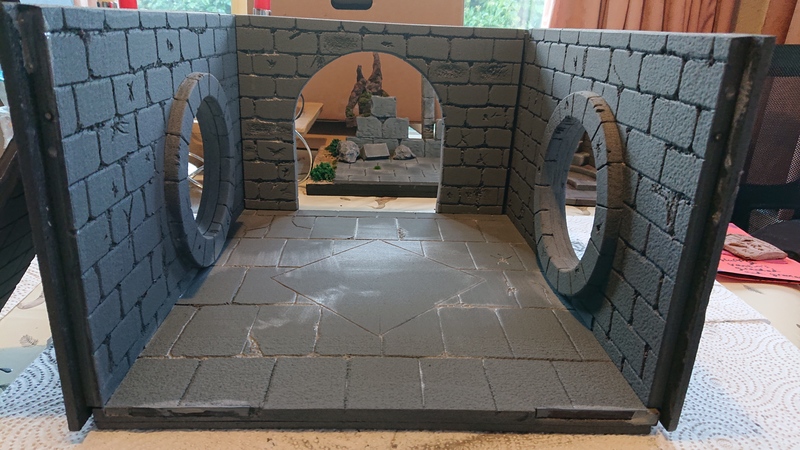 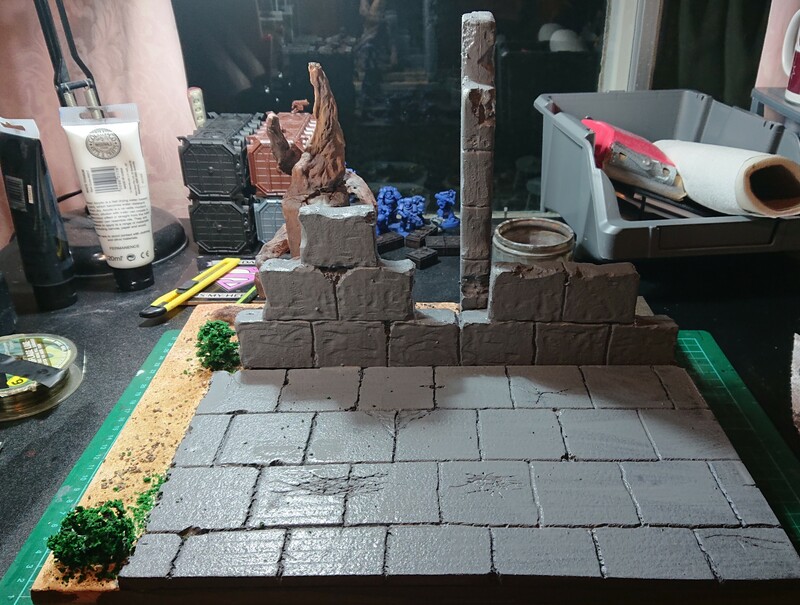 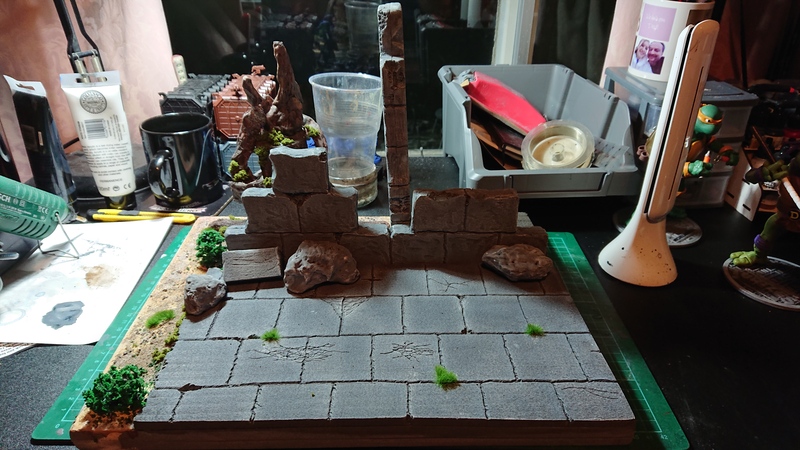 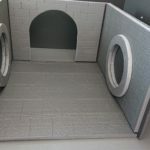 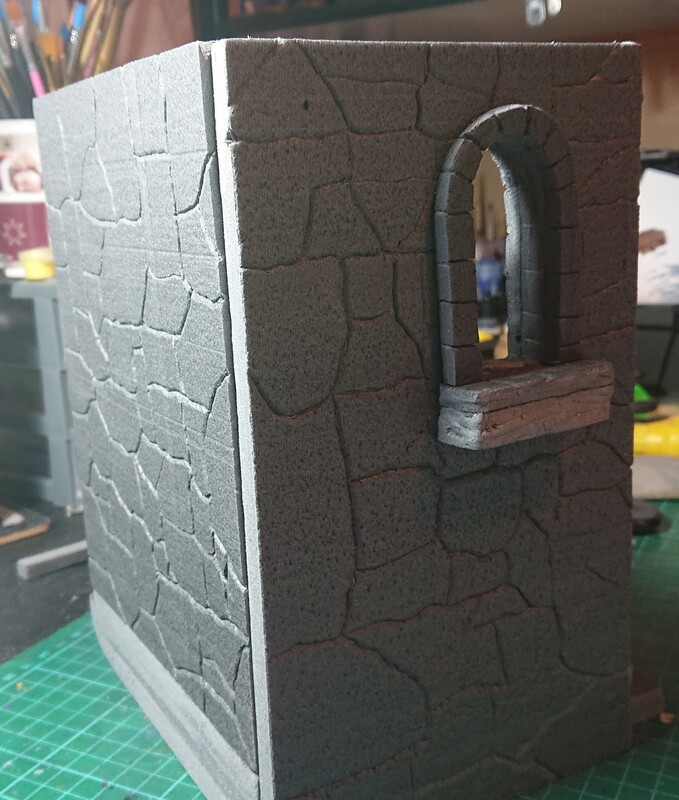 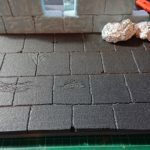 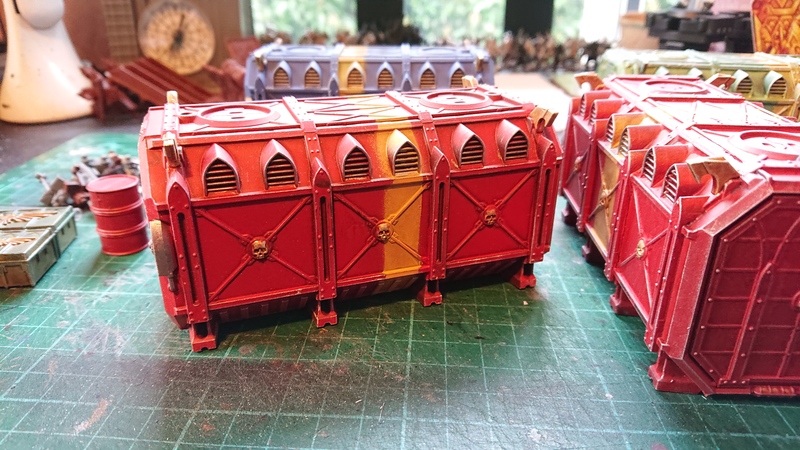 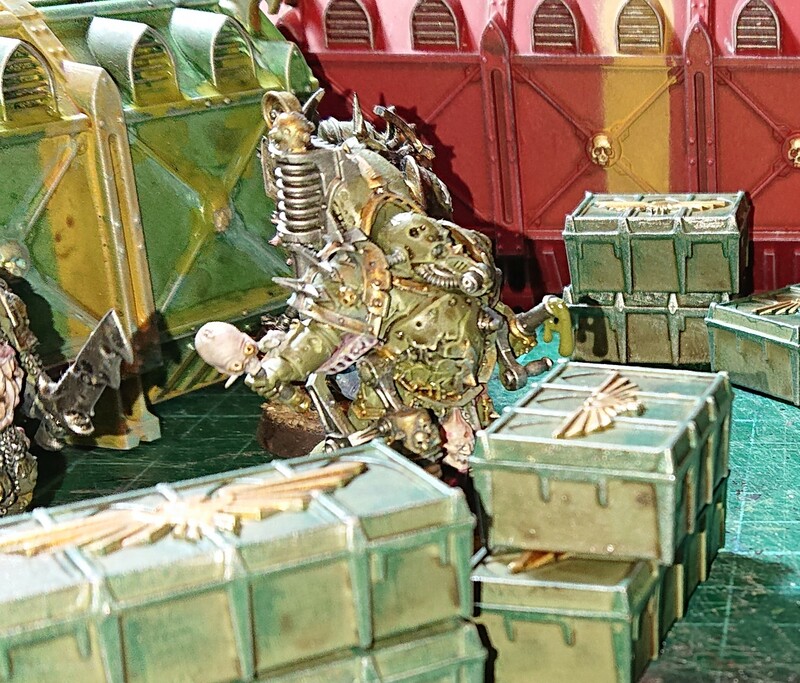 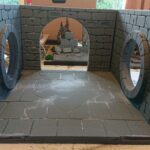 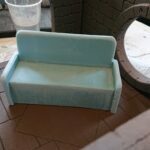 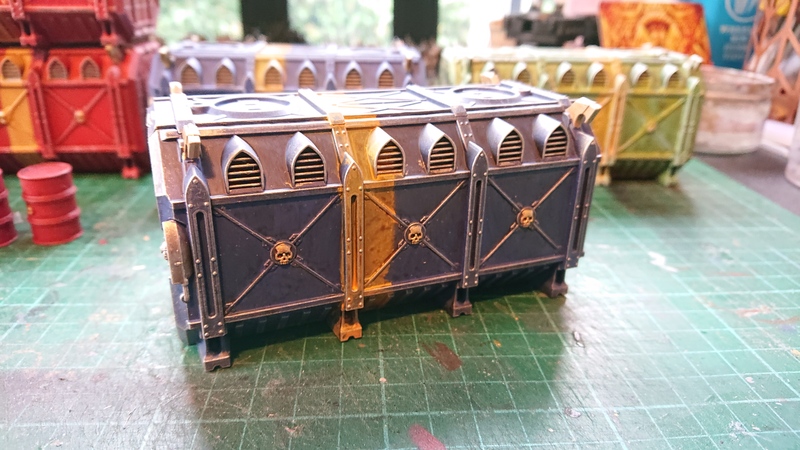 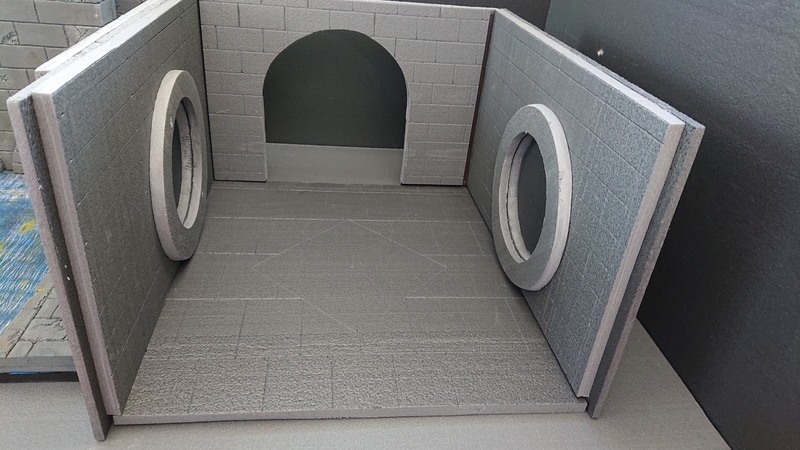 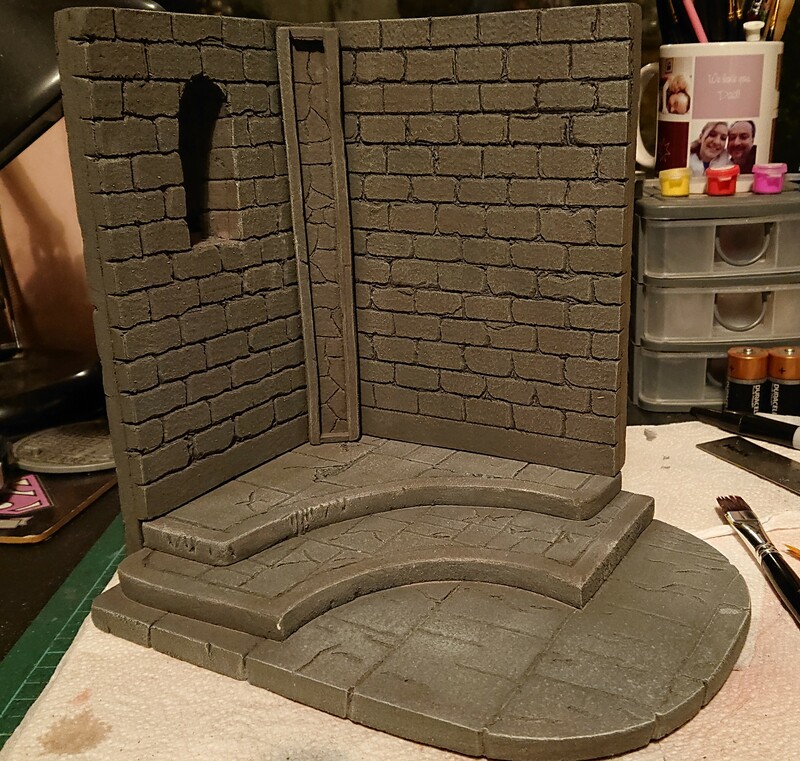 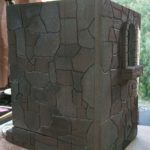 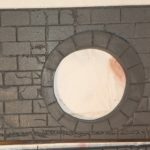 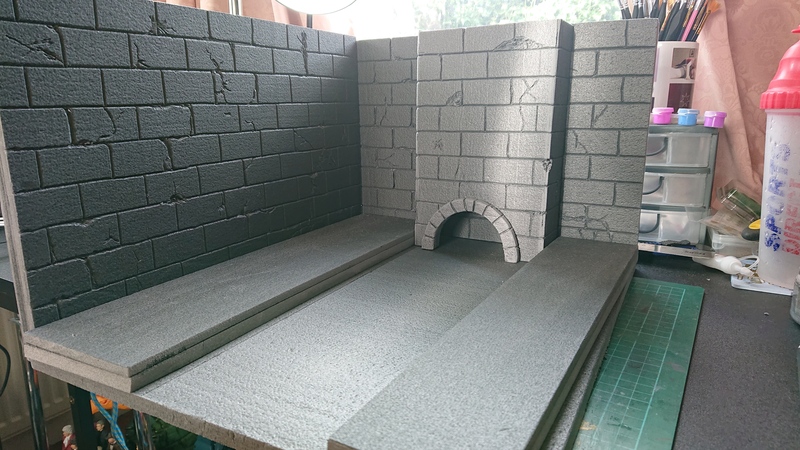 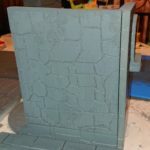 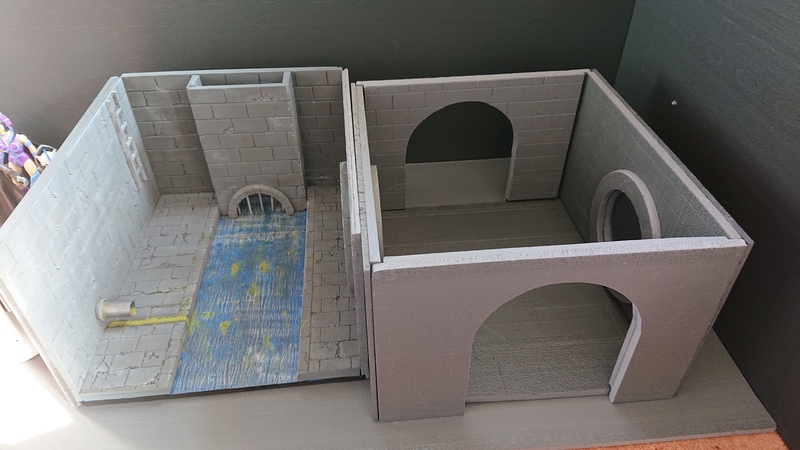 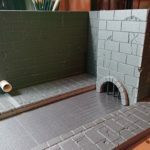 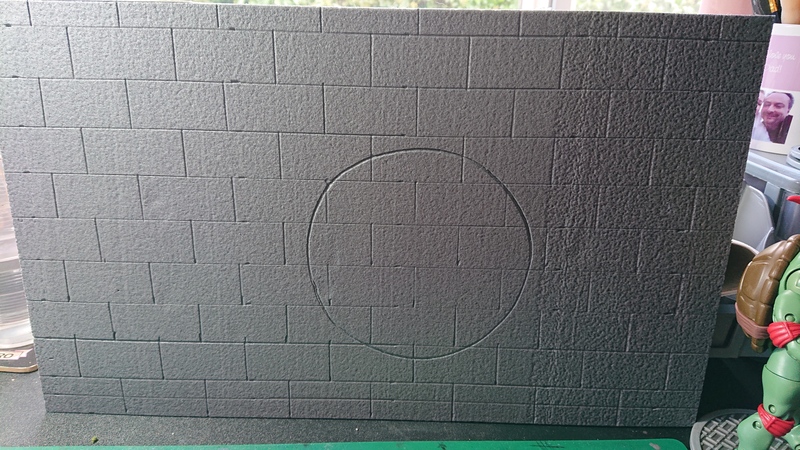 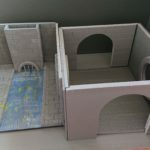 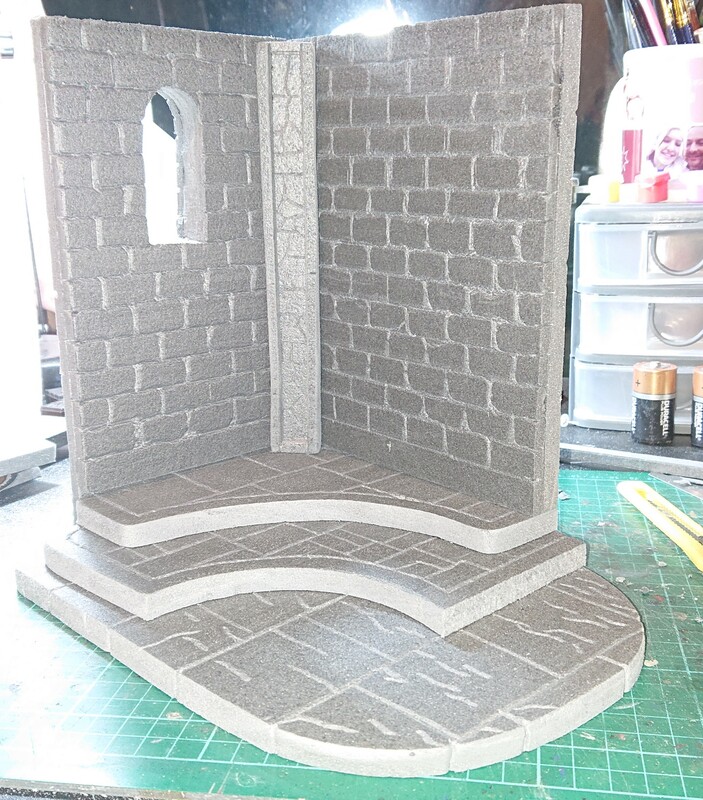 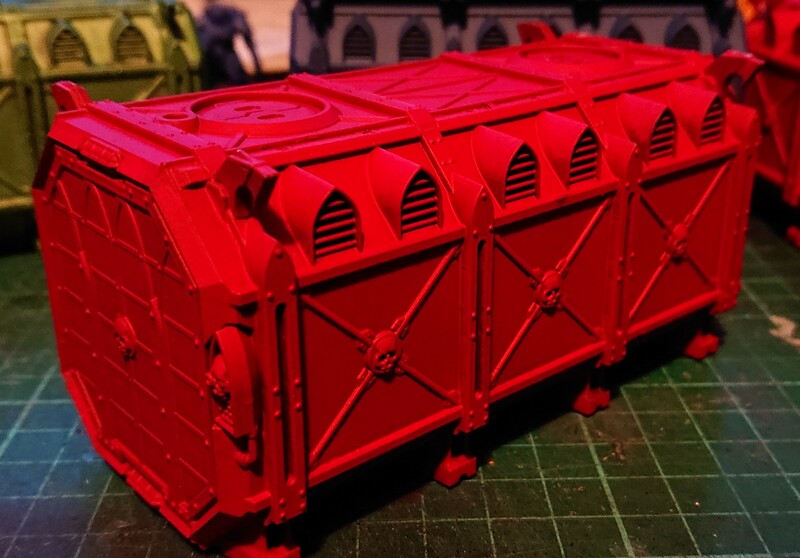 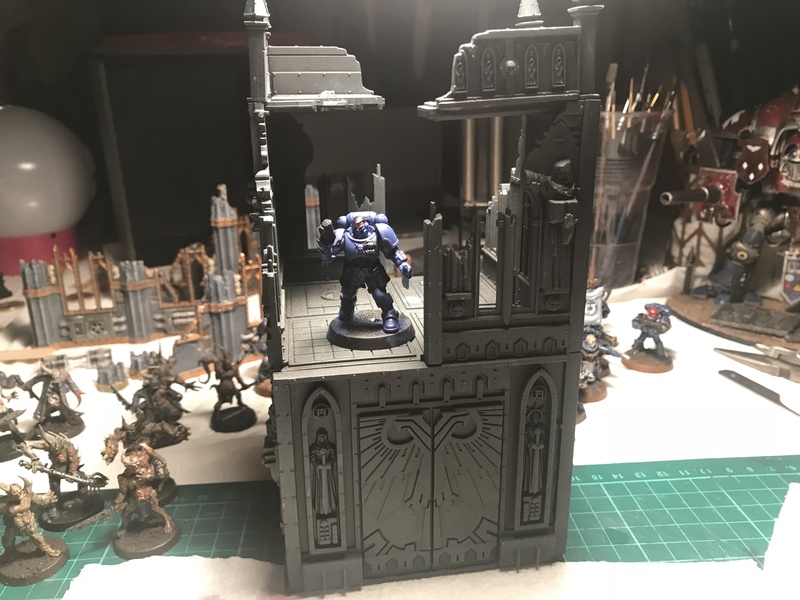 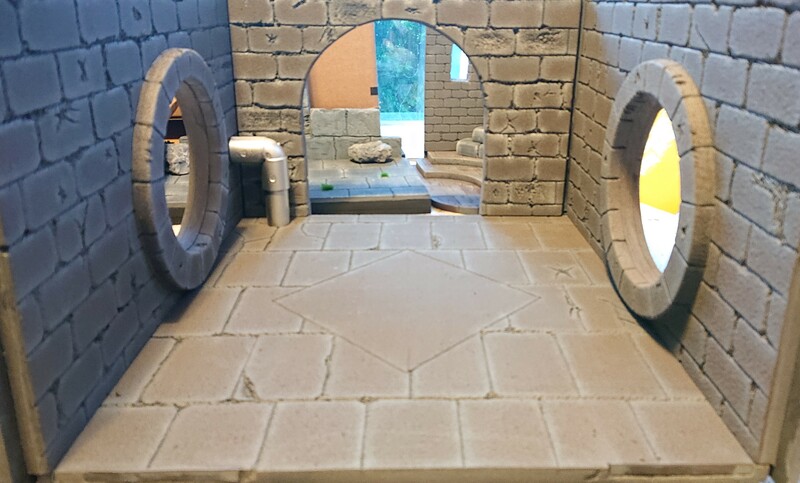 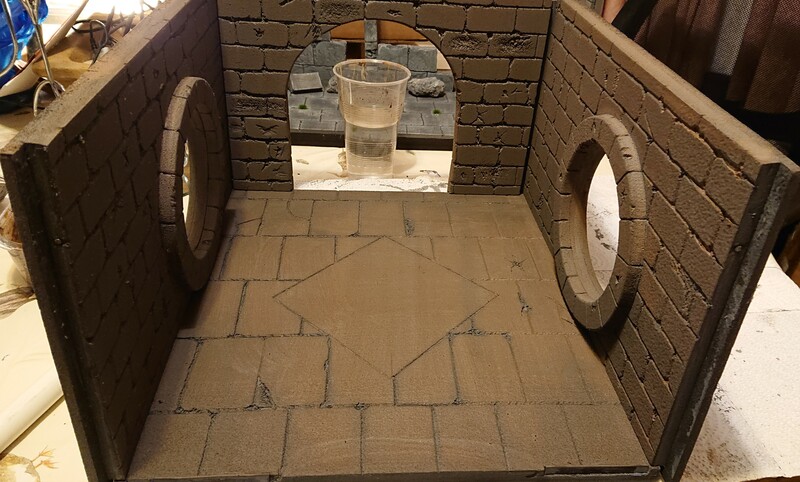 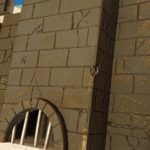 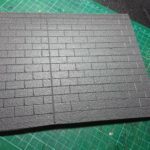 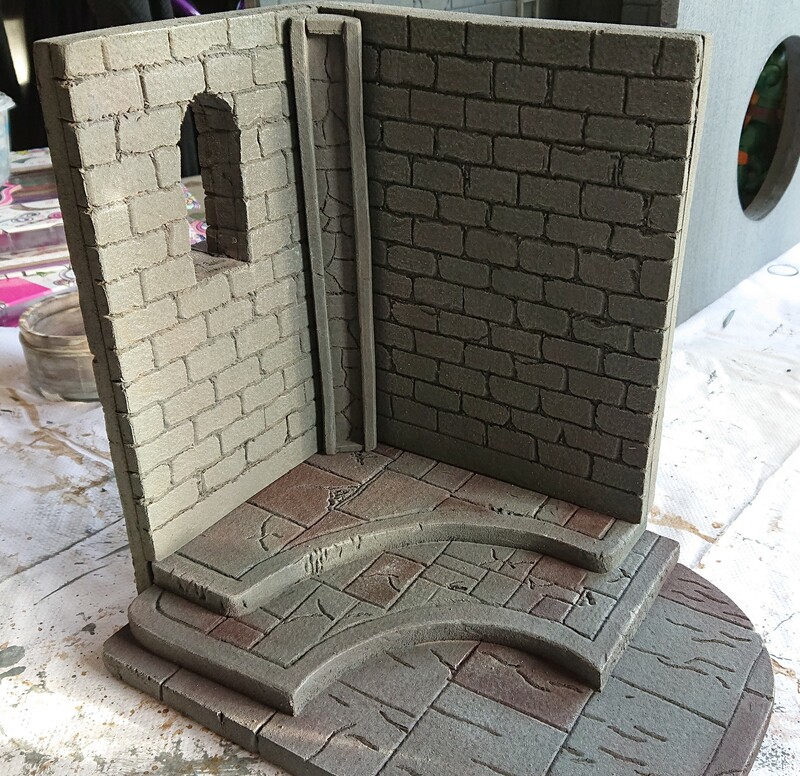 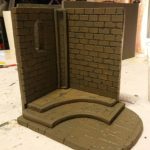 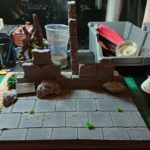 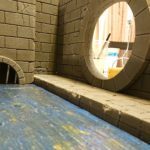 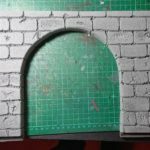 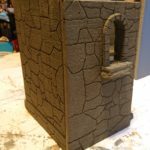 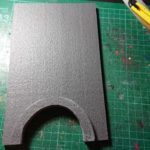 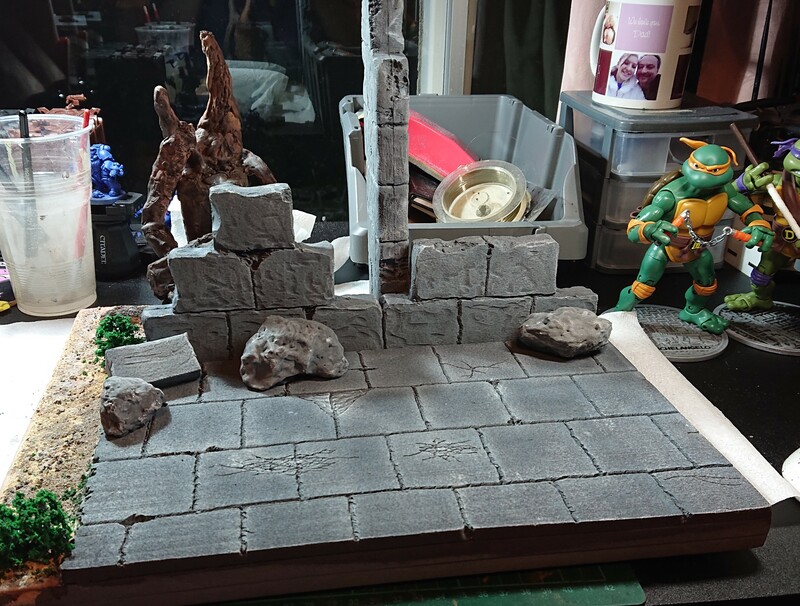 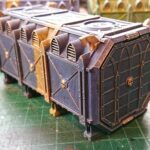 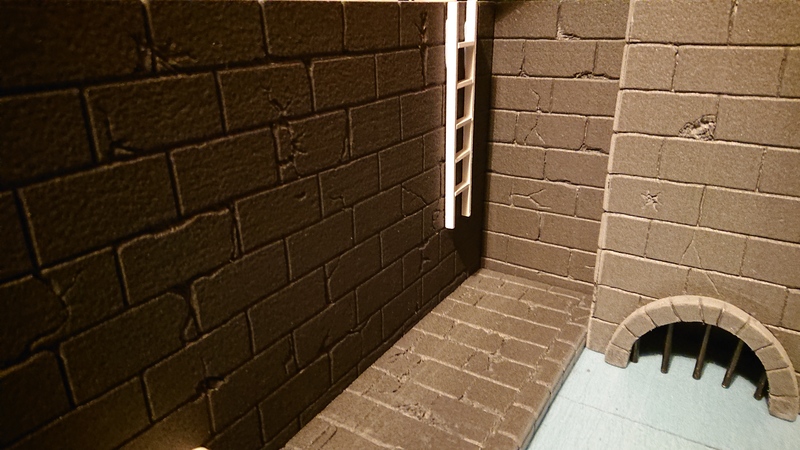 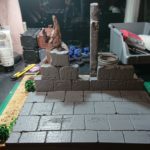 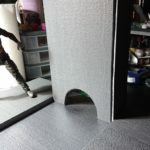 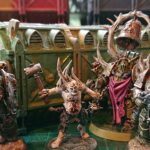 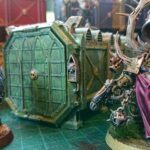 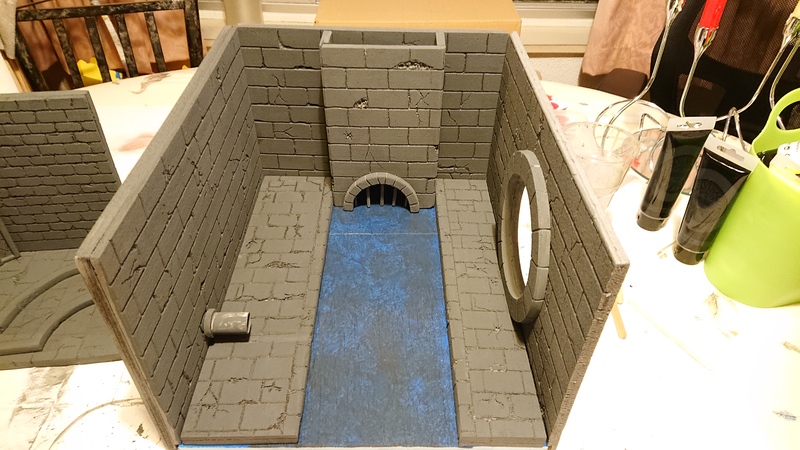 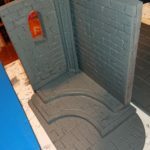 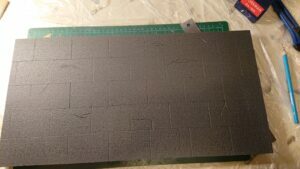 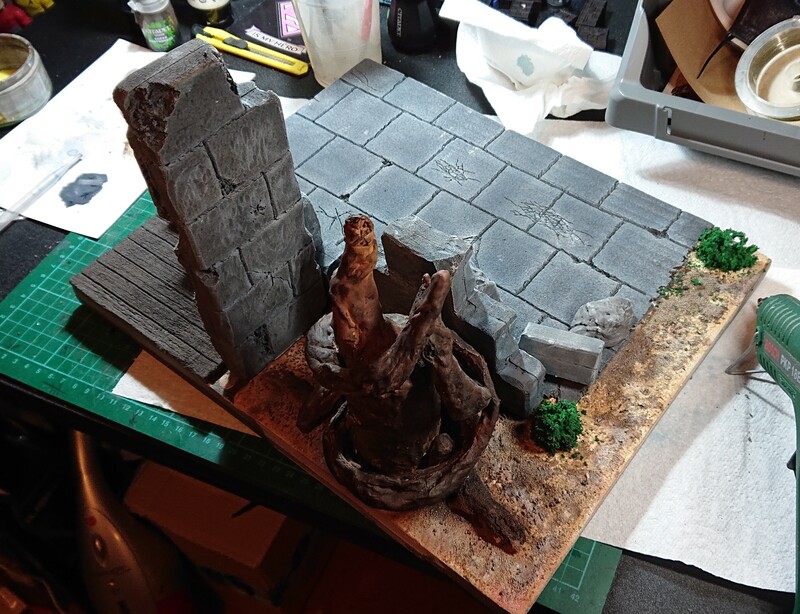 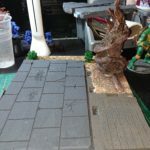 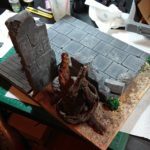 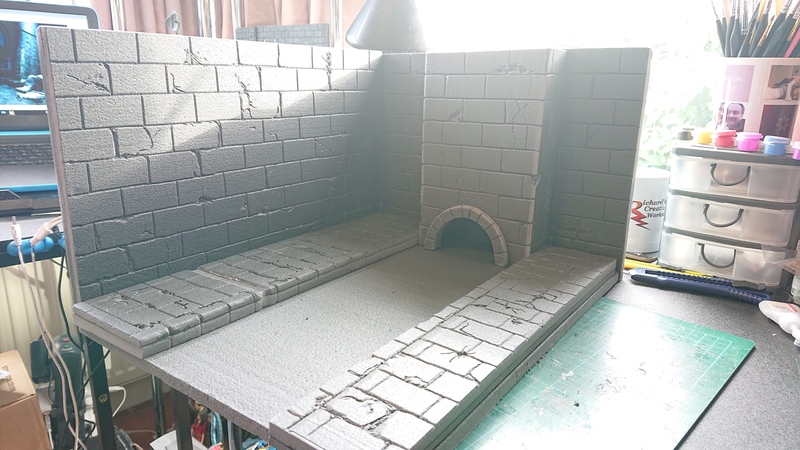 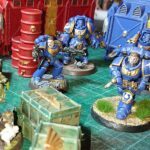 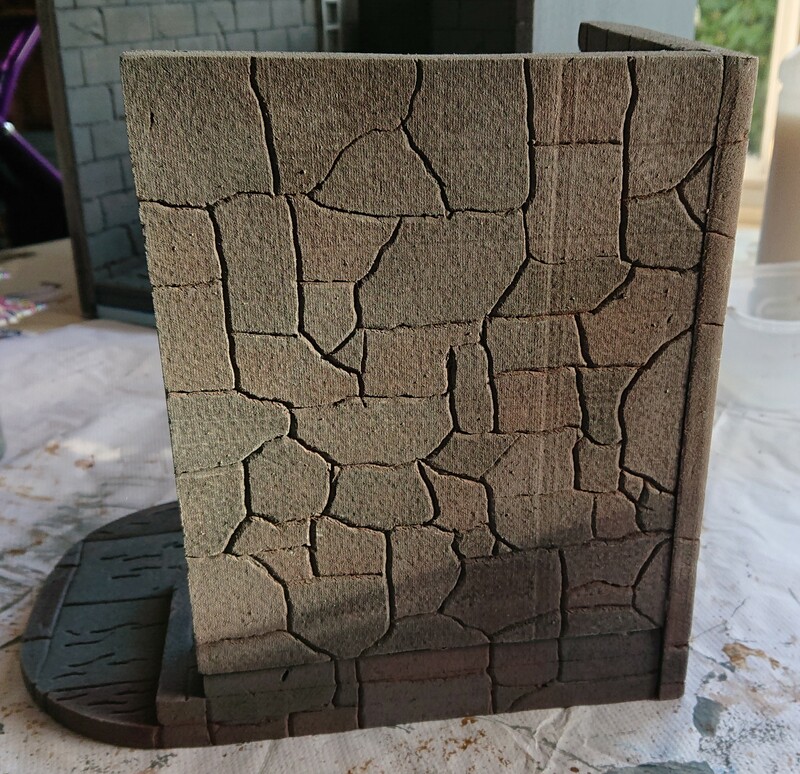 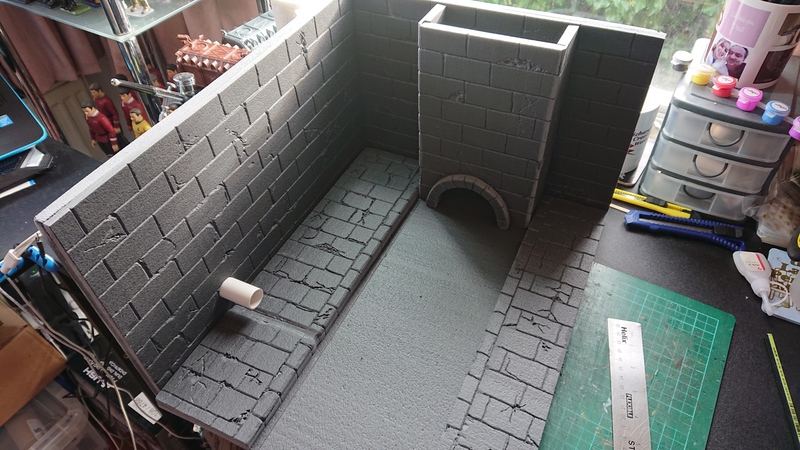 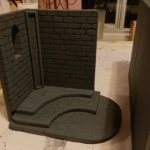 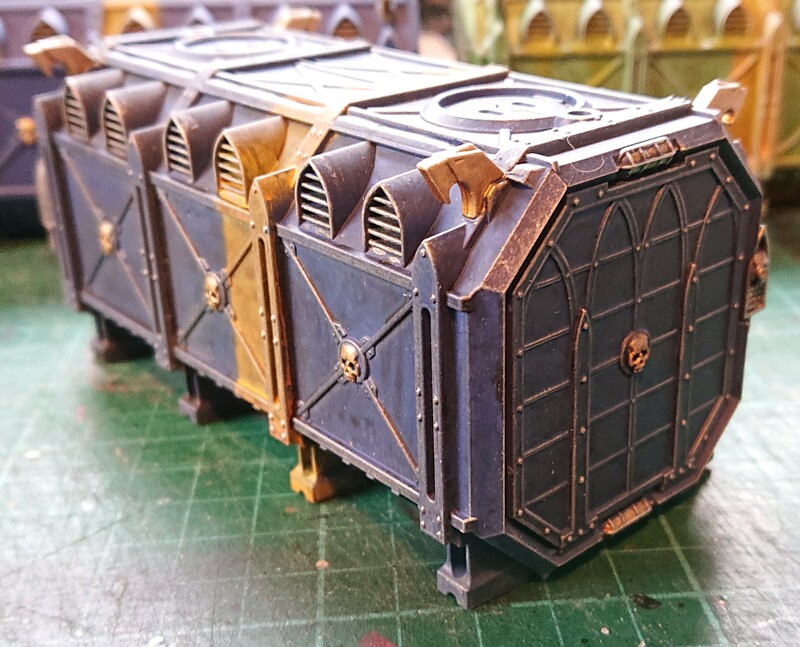 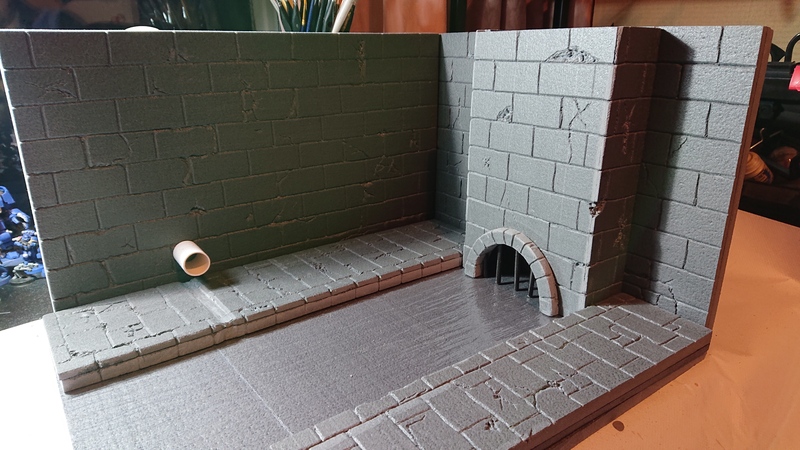 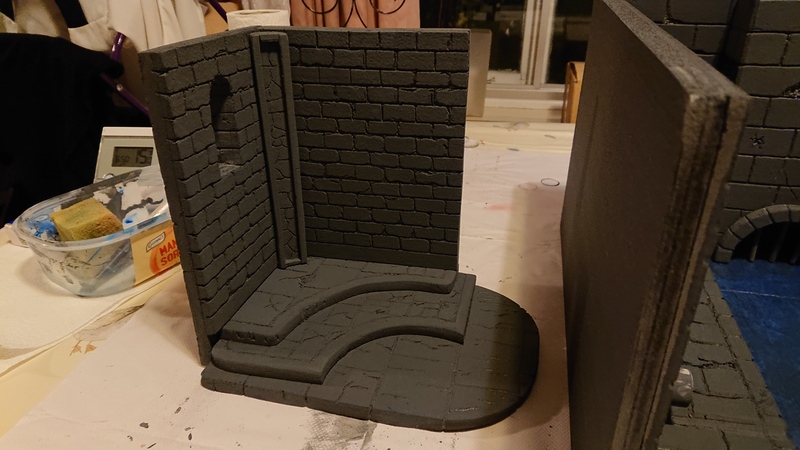 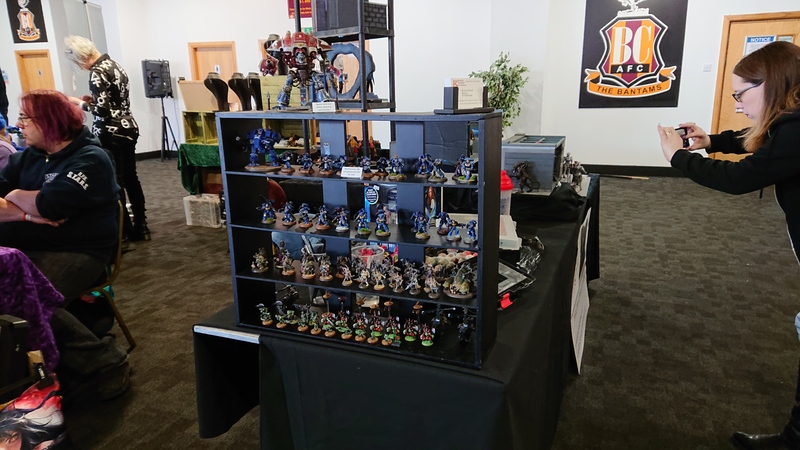 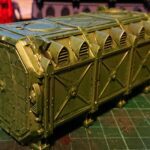 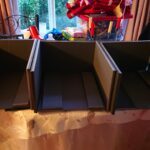 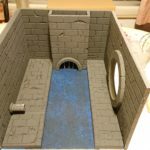 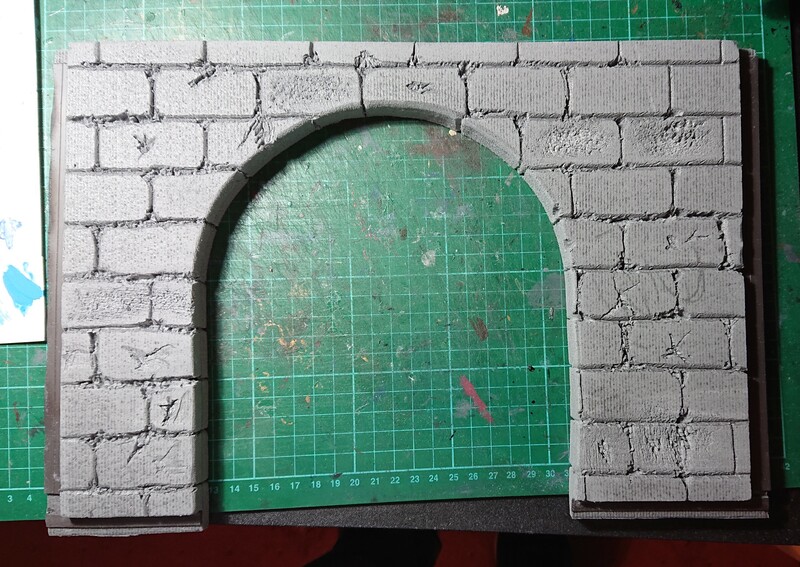 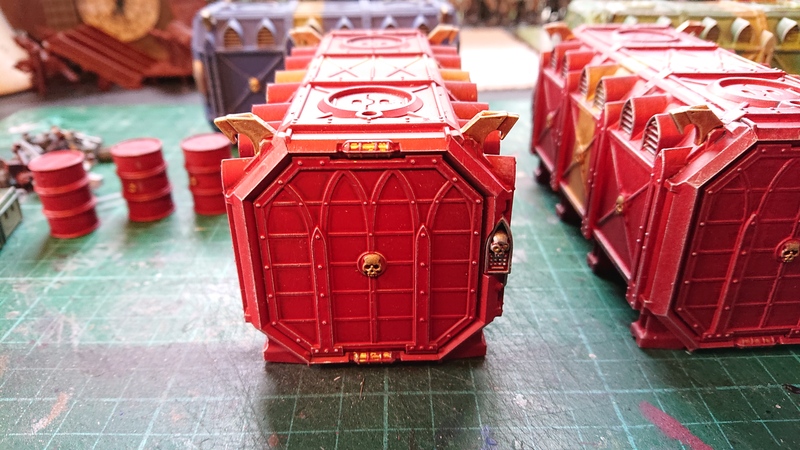 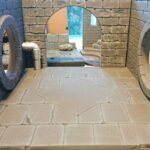 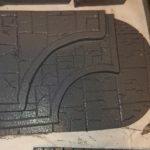 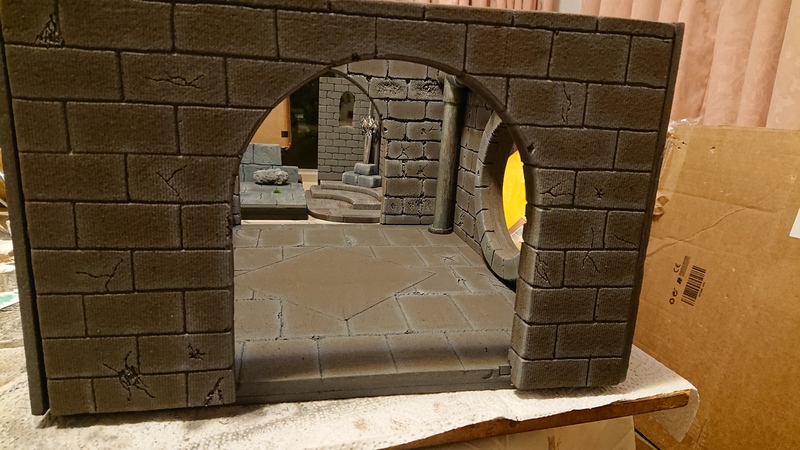 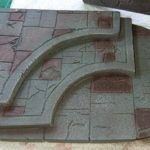 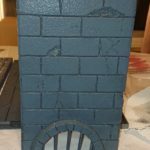 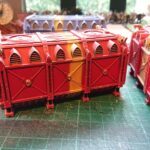 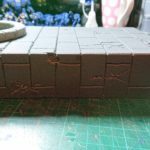 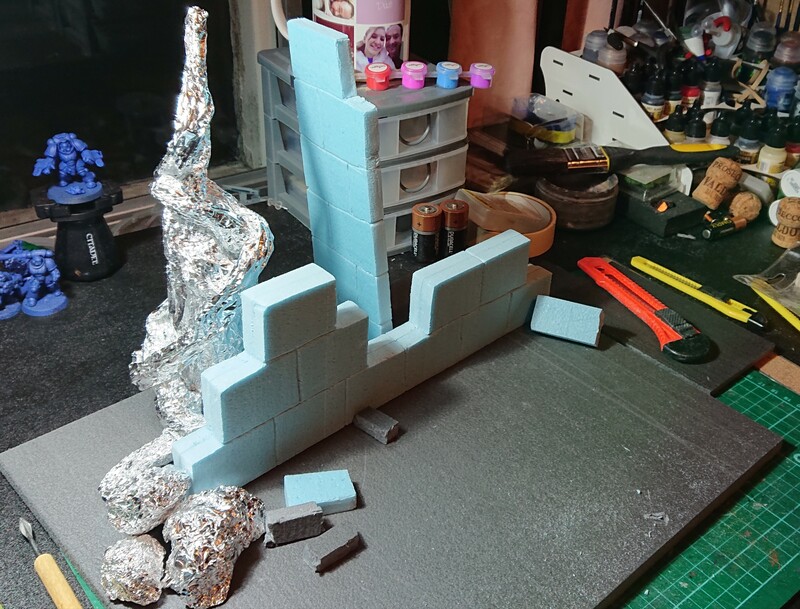 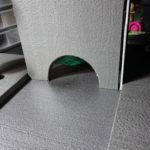 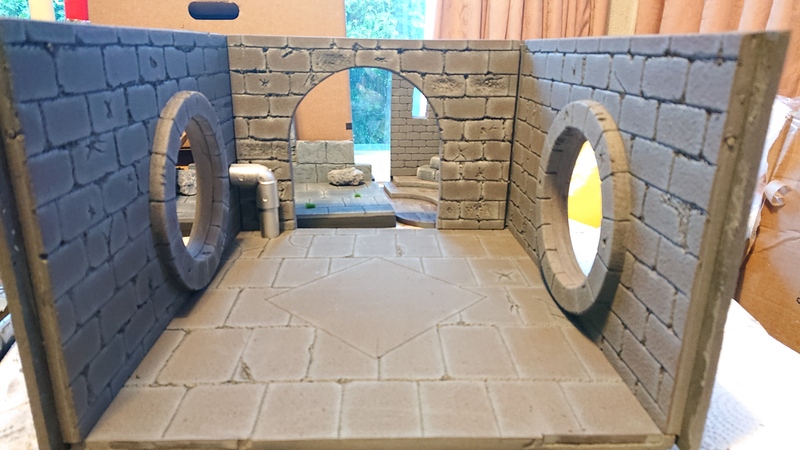 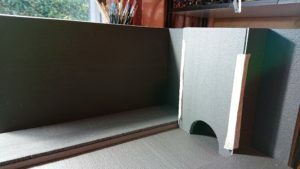 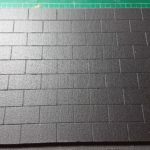 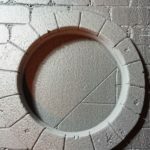 The walls of the model were dry brushed with Games Workshops Longbeard grey. 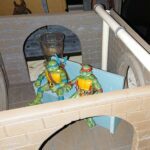 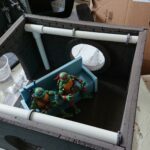 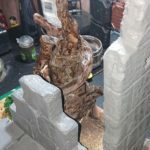 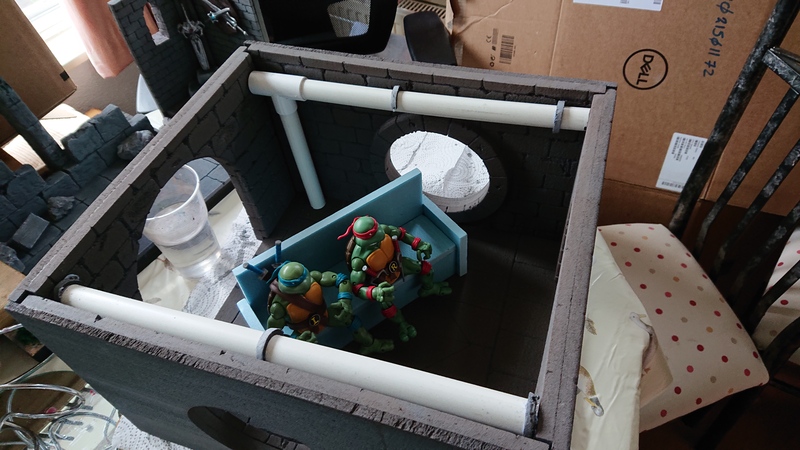 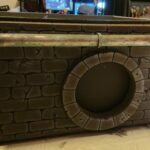 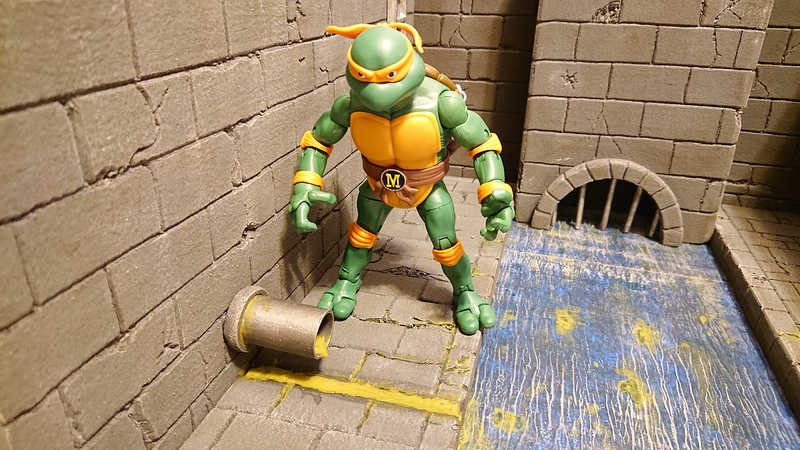 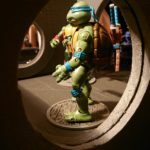 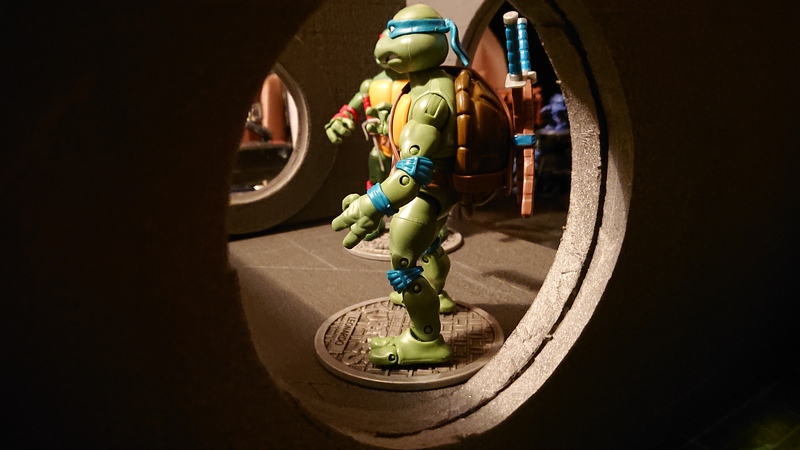 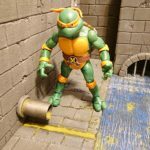 All the pipes where fixed into place, I combined the Turtle lair with the sewer commissioned piece I had also recently finished together to build an awesome Turtle play-set which you will see in the final pictures. 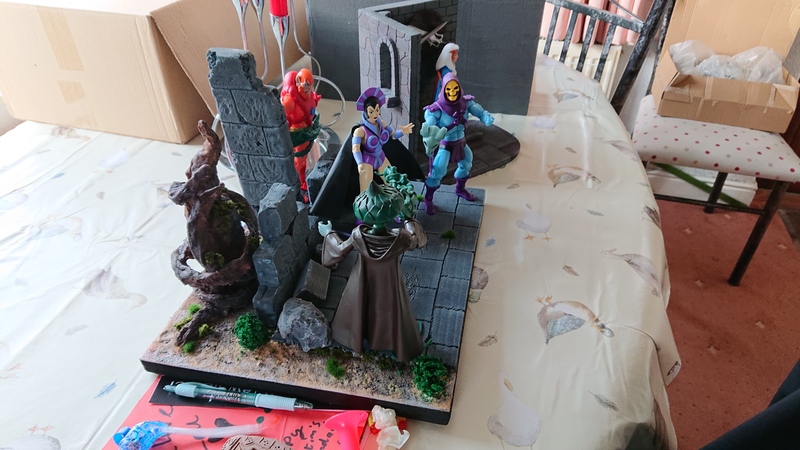 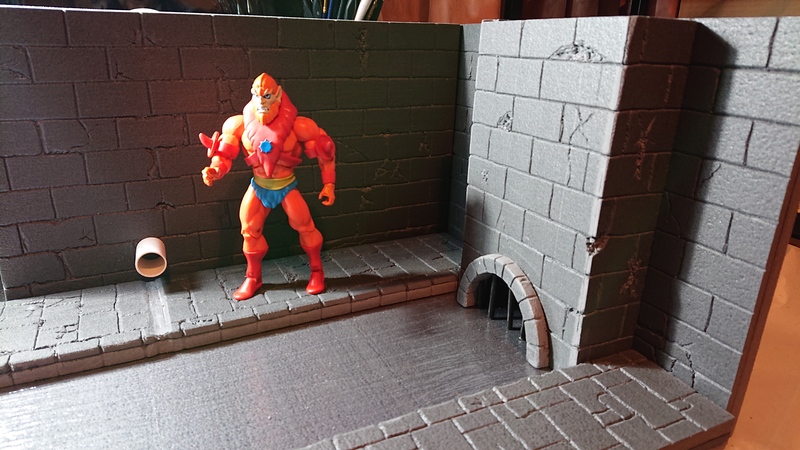 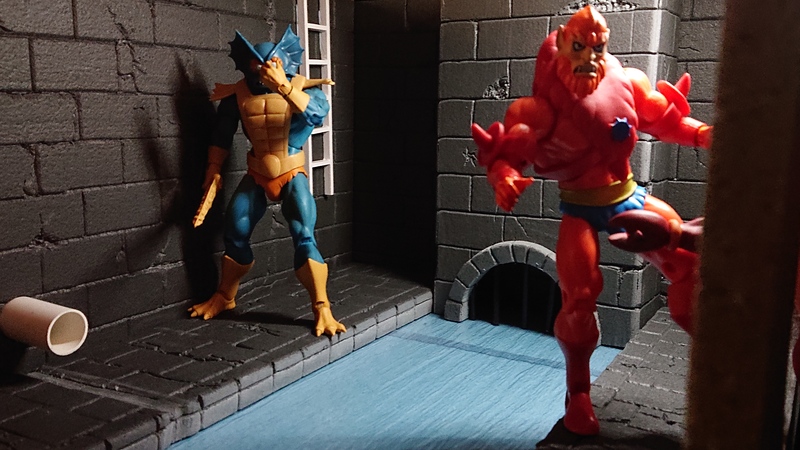 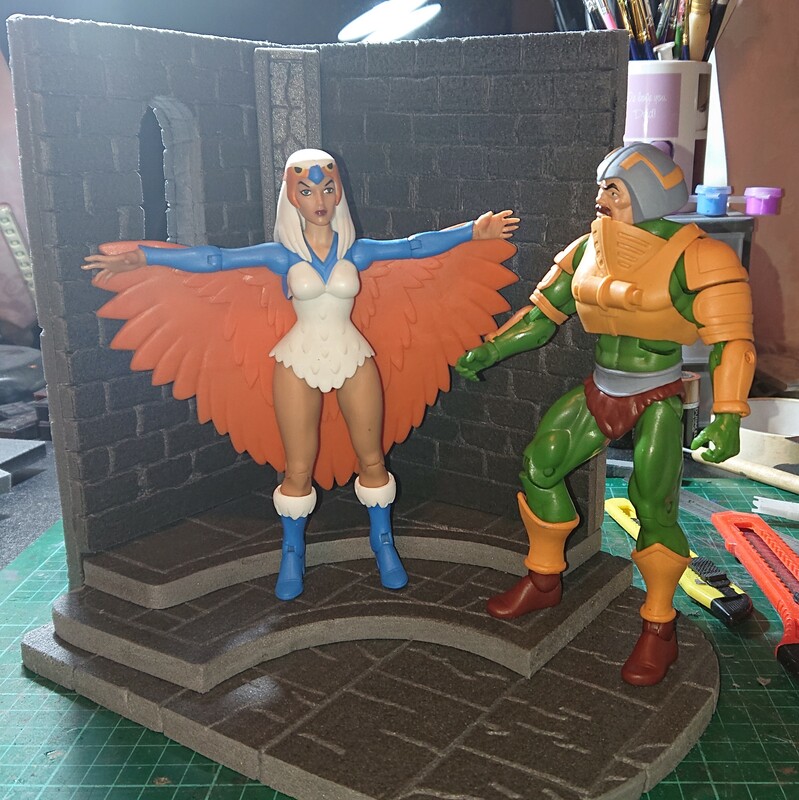 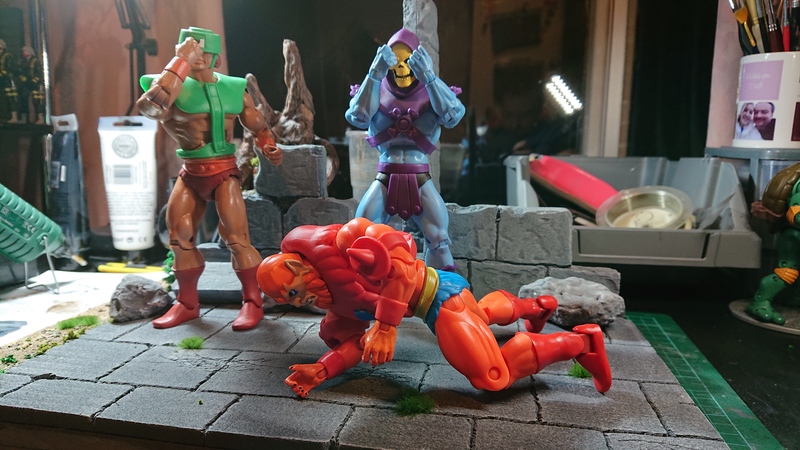 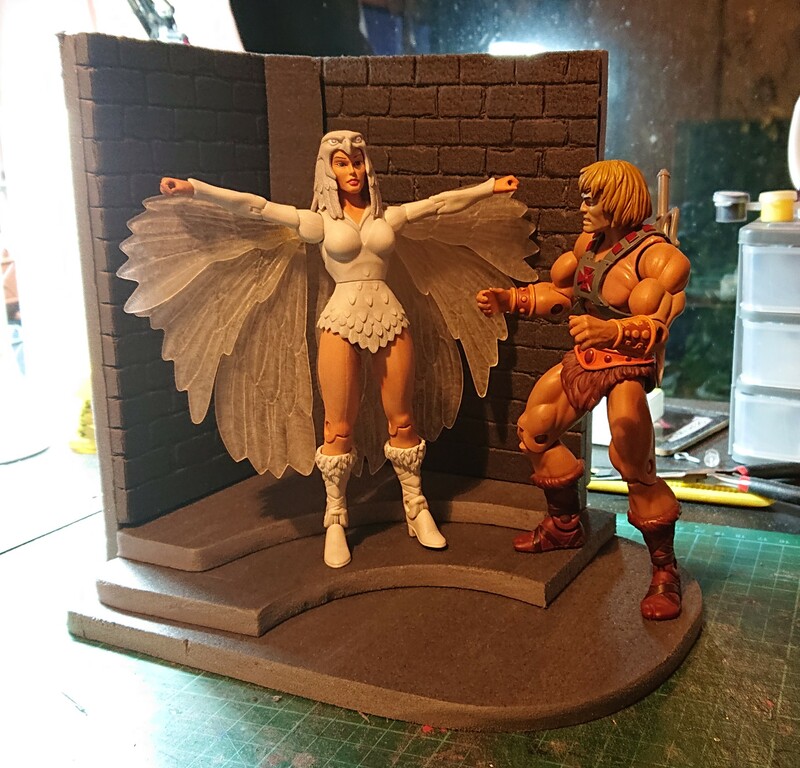 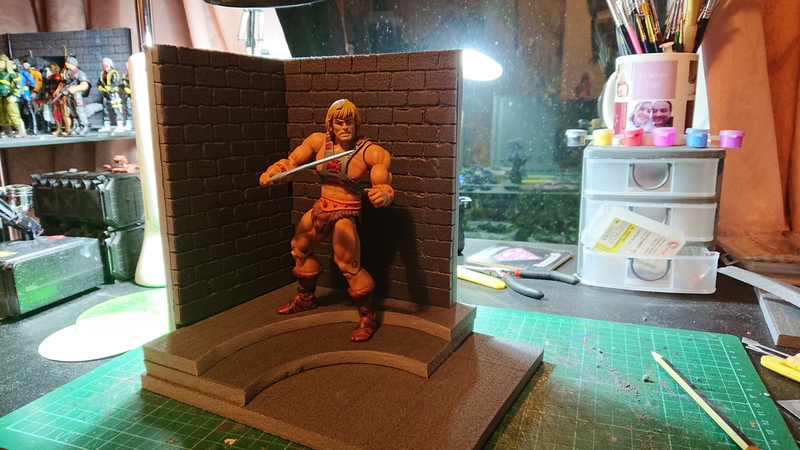 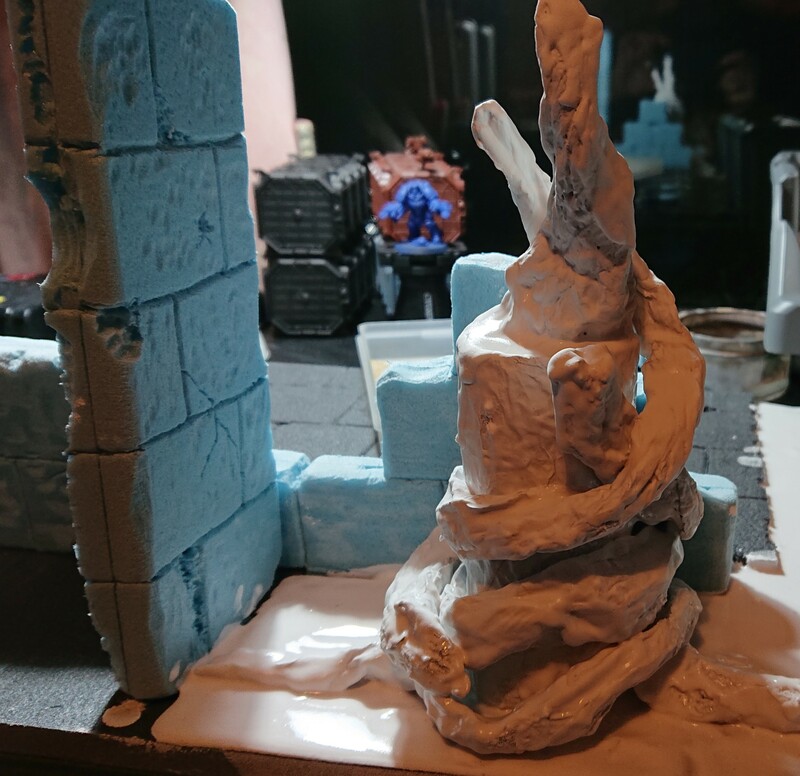 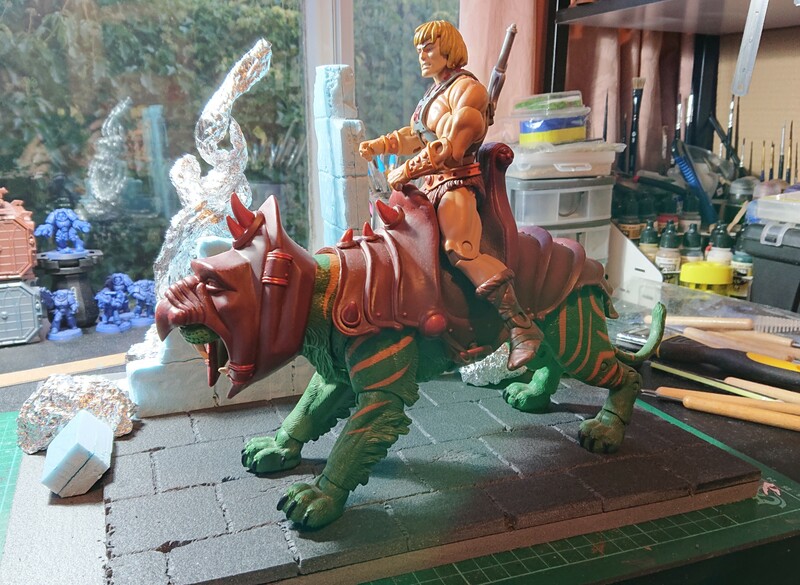 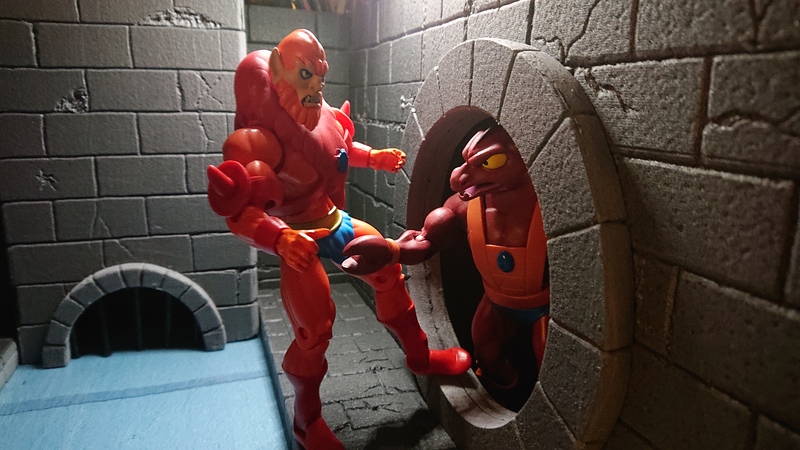 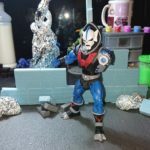 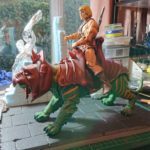 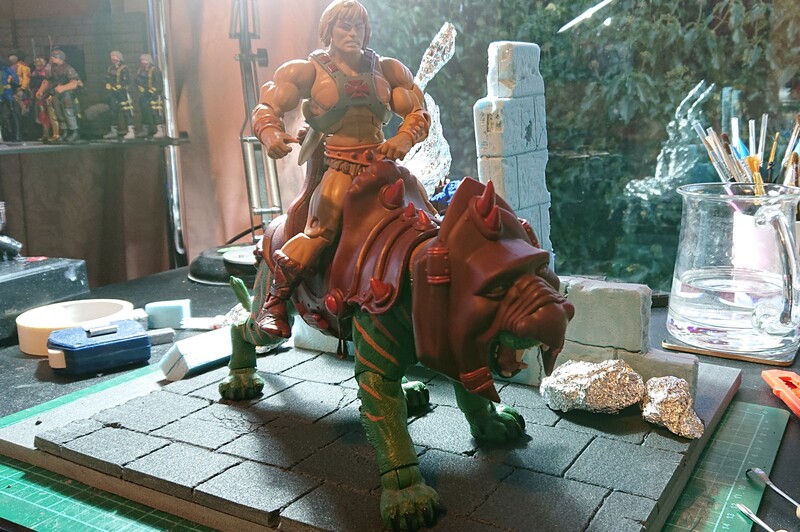 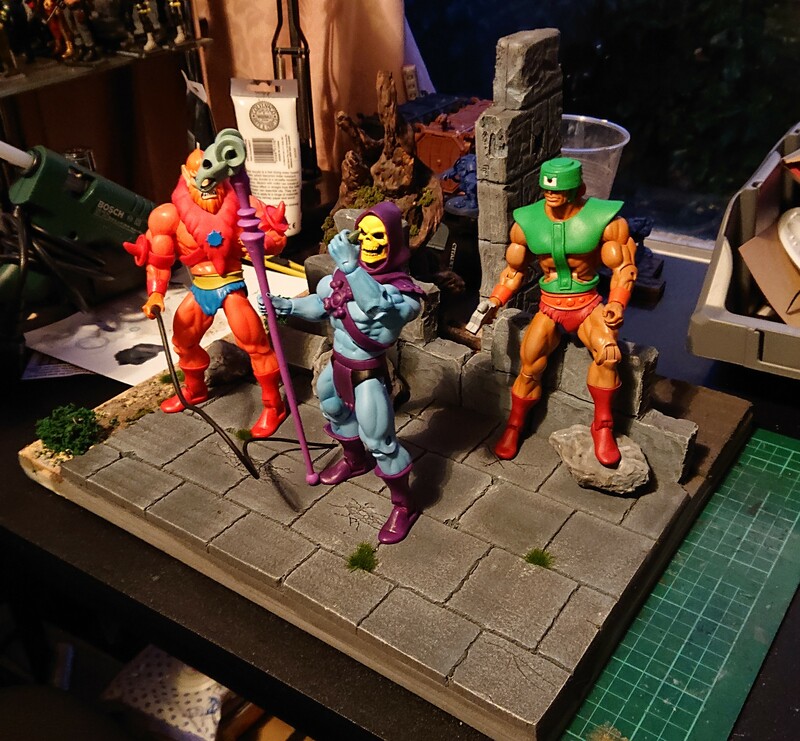 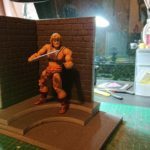 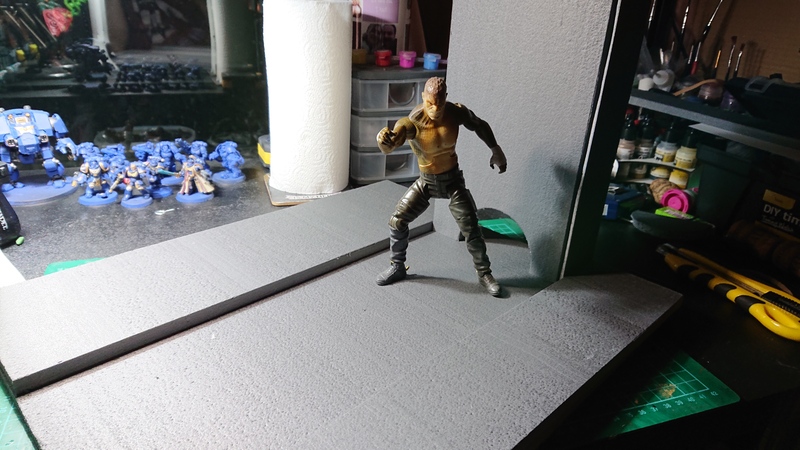 Started on a small diorama piece for Bradford Unleashed, drawing inspiration from He-man and the Masters of the Universe. 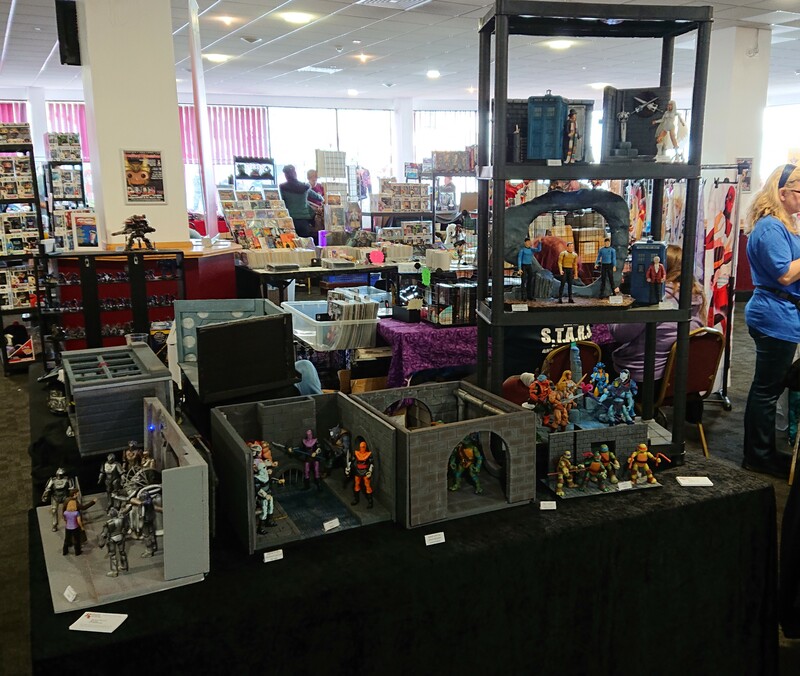 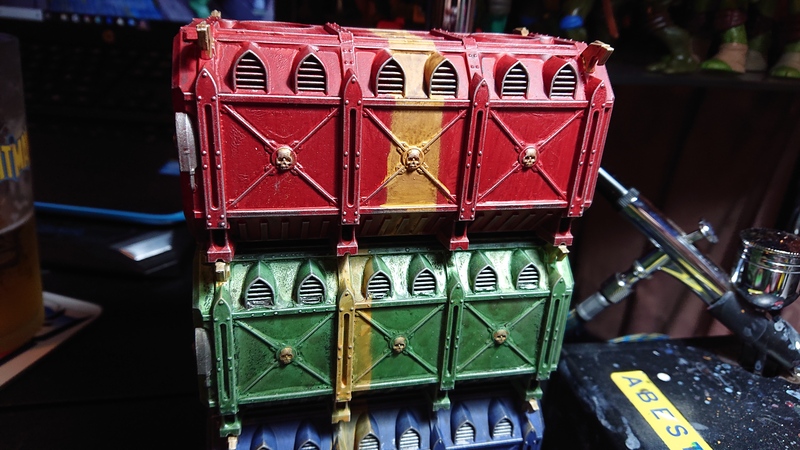 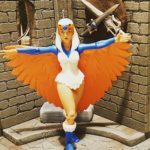 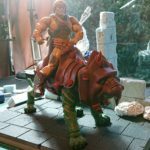 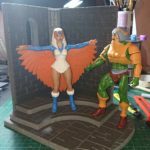 Made from foam insulation board, it’s scaled to fit Masters Of The Universe 5.5′ to the 7′ figures. 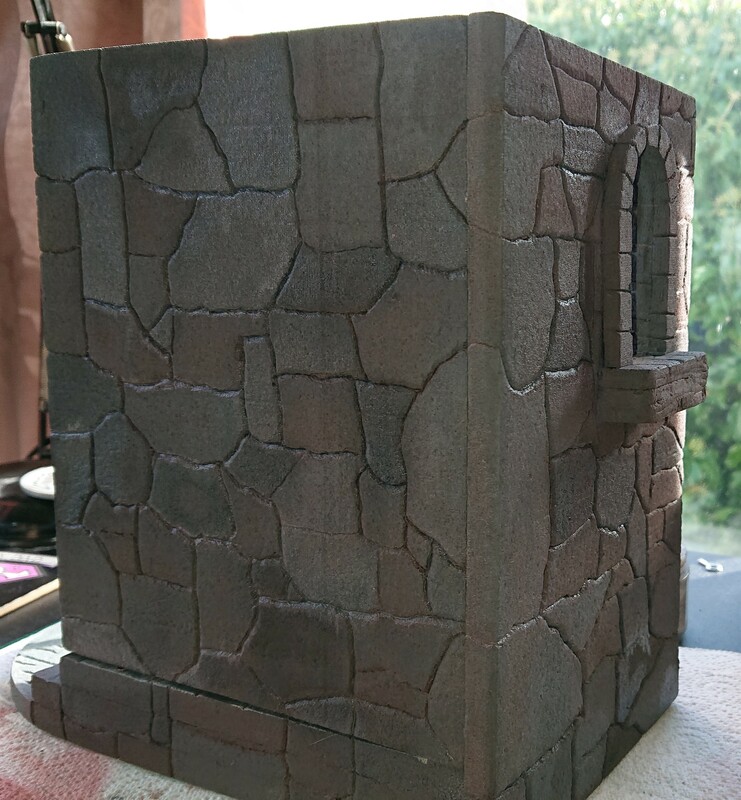 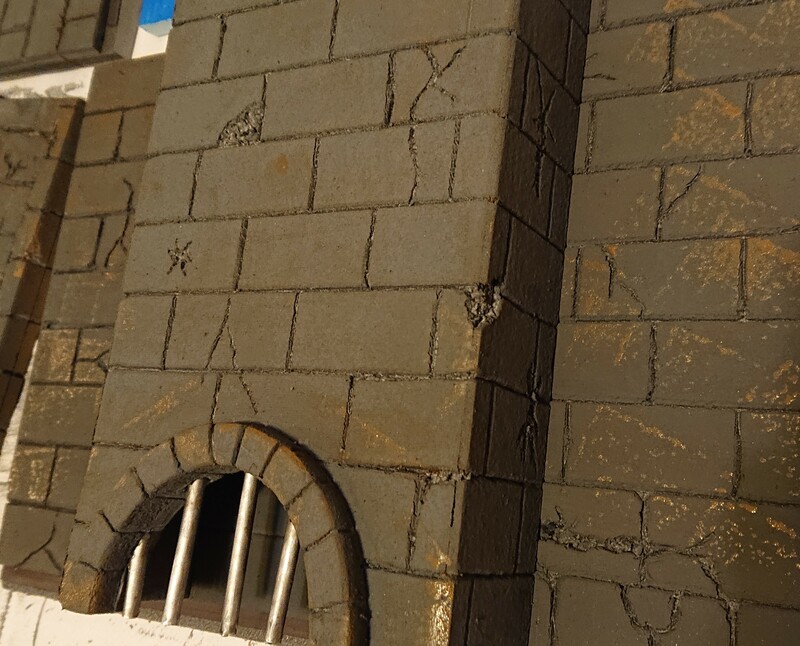 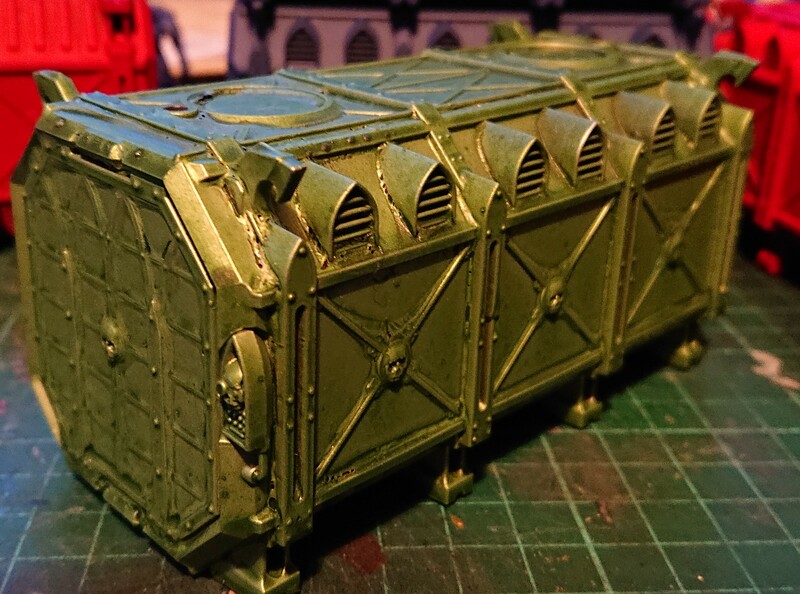 The external I’ve etched brick work similar to that of the 80’s Castle Grayskull play set. 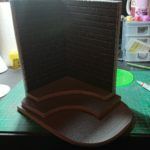 Internal I’ve etched my standard brickwork. 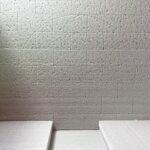 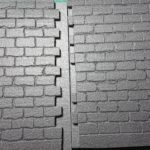 The walls are made from one piece of board, cutting between the bricks to make two interlocking walls. 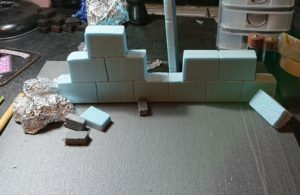 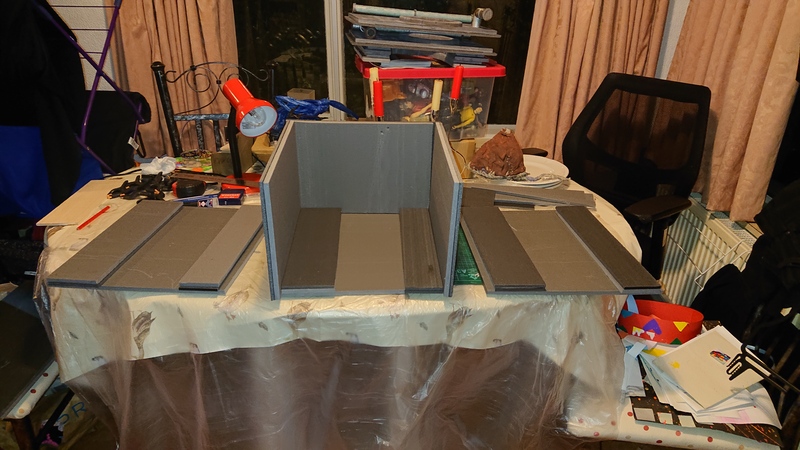 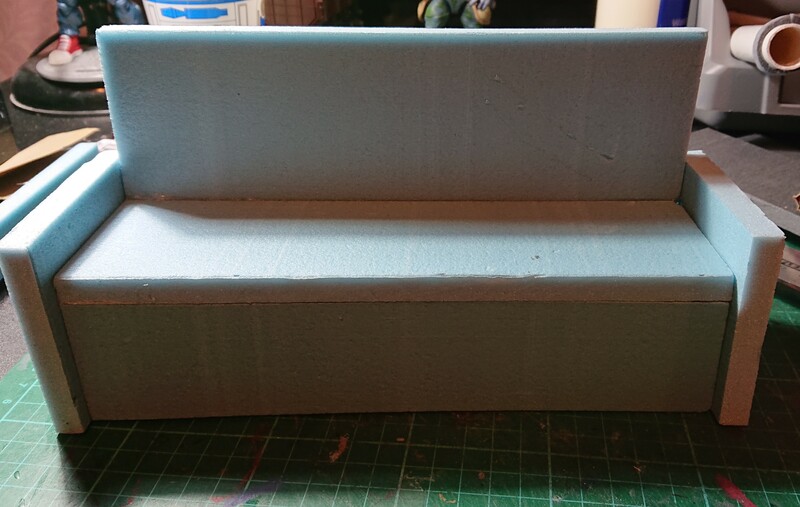 For the base I made three curved steps leading towards the wall, then curved the corners. 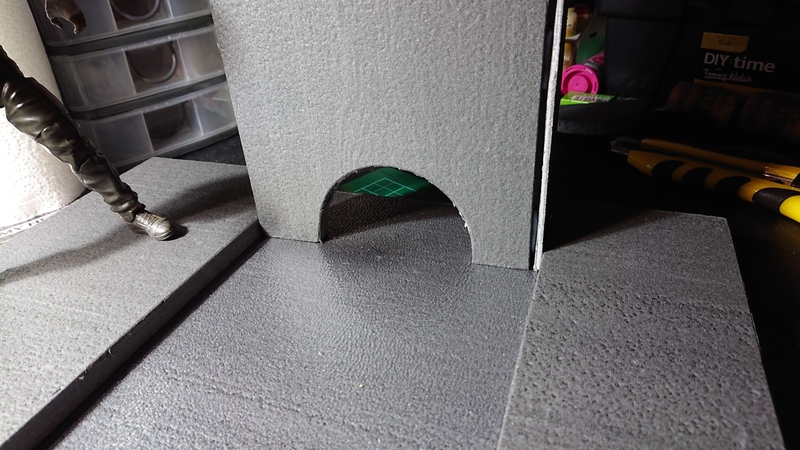 A single pillar created and fitted into the corner. 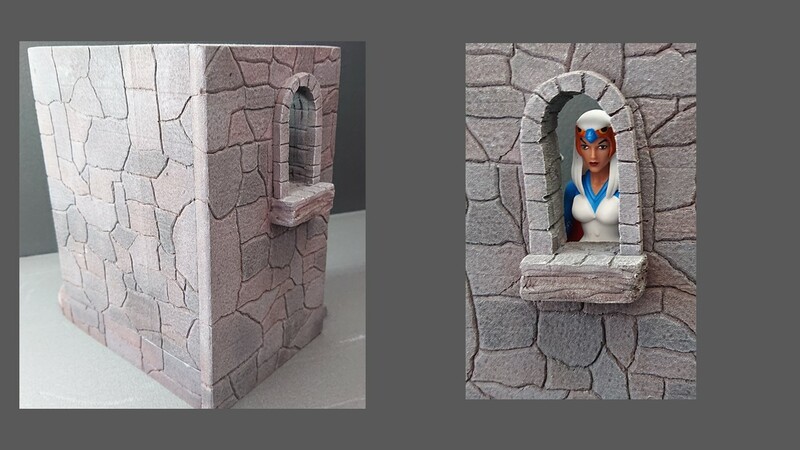 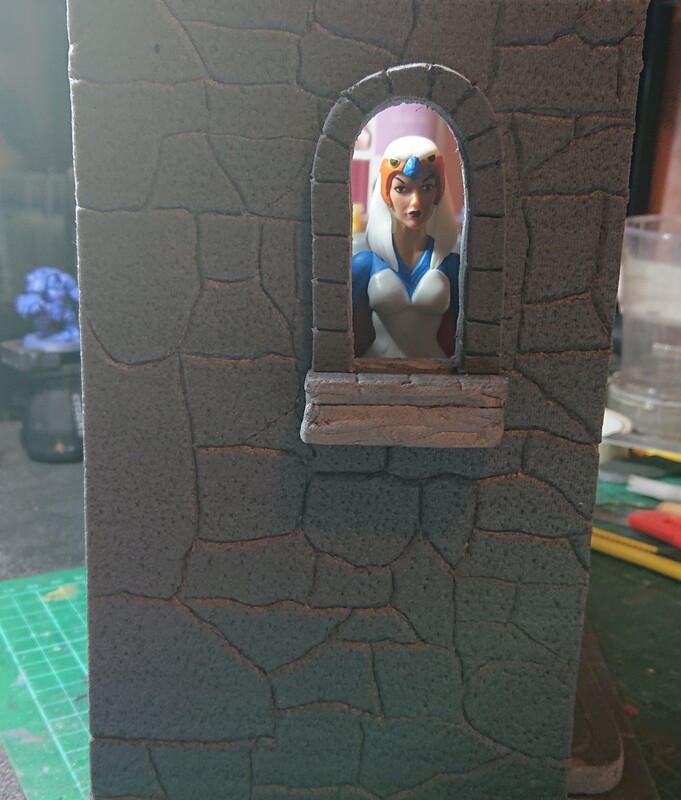 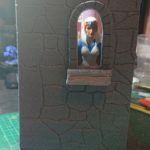 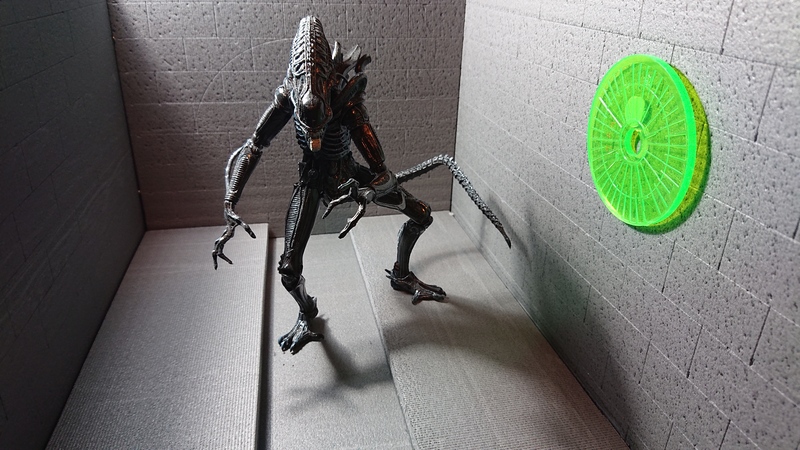 With the external being based upon the 80’s toy, I’ve put in a small window for the Sorceress to view out of. 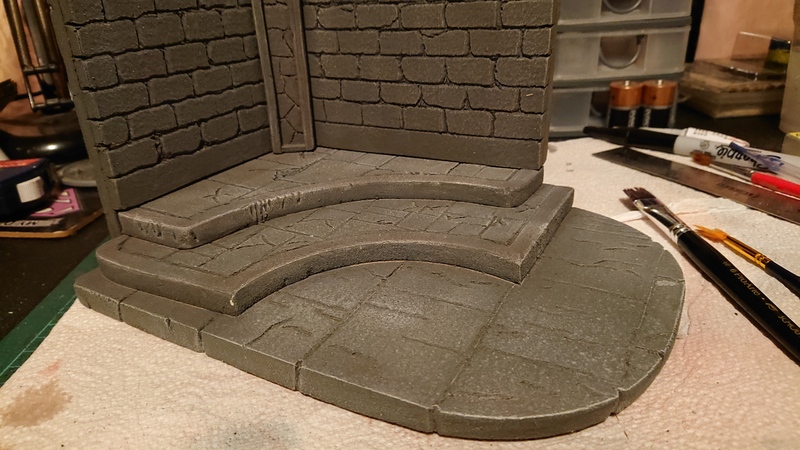 Stone slabs have been etched into the floor and steps. 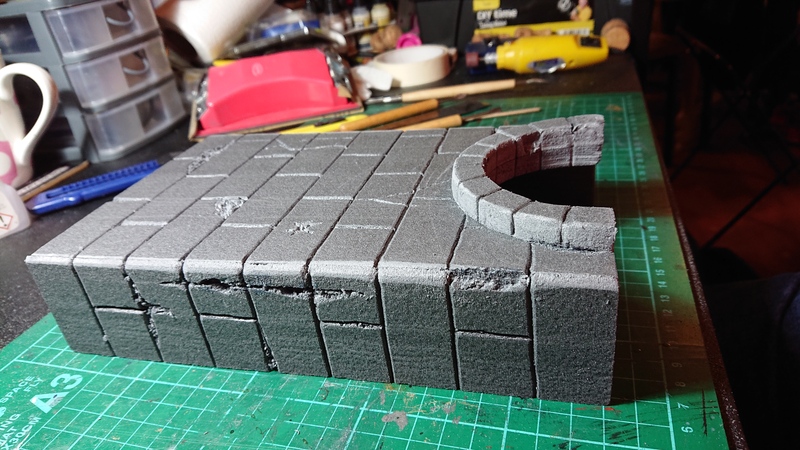 Sanded down all edges and started playing with ideas on how this will look when it’s finished. 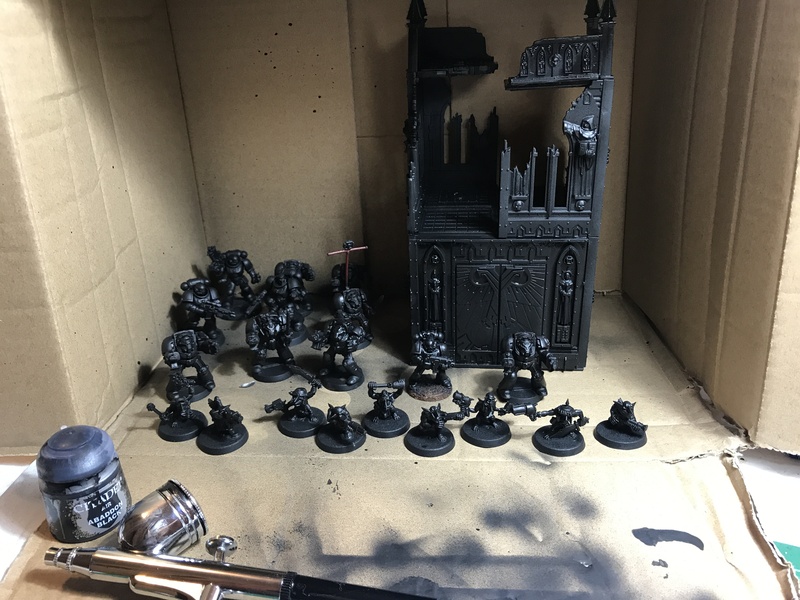 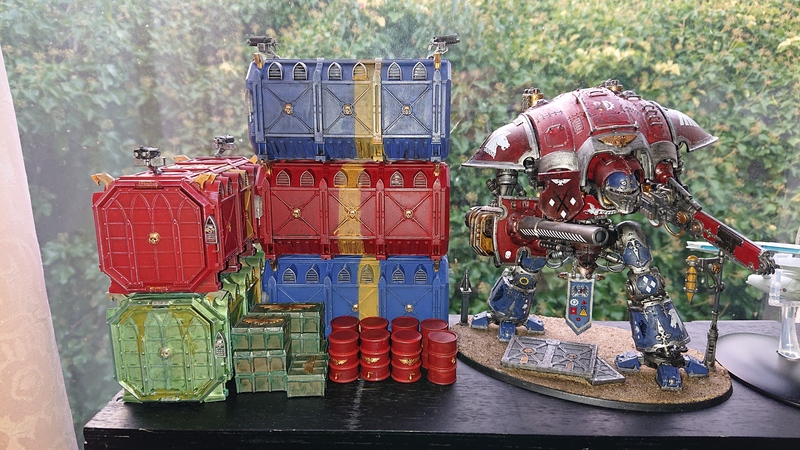 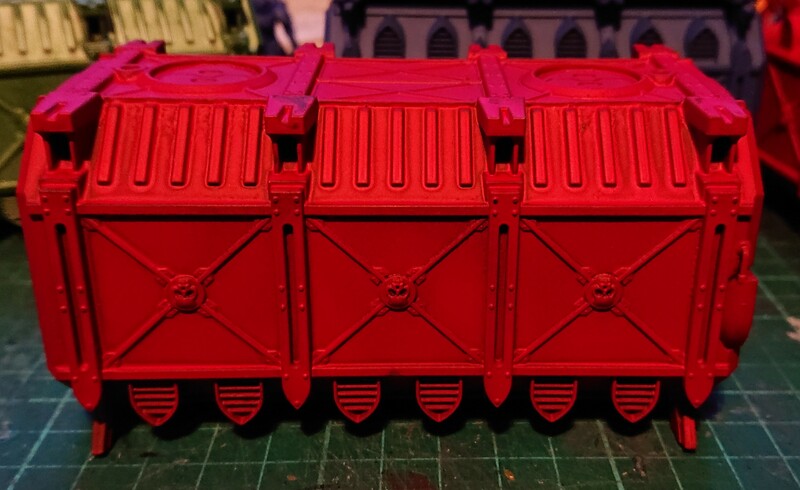 With the build completed, it is time to start painting. 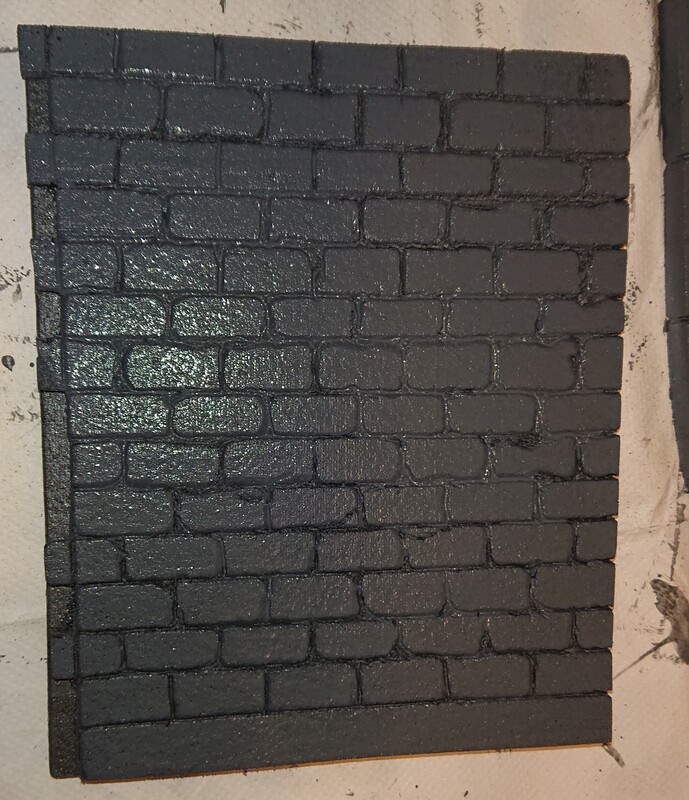 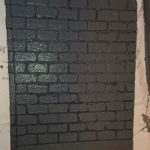 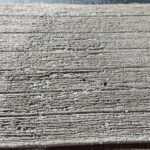 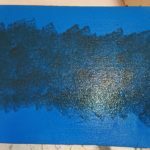 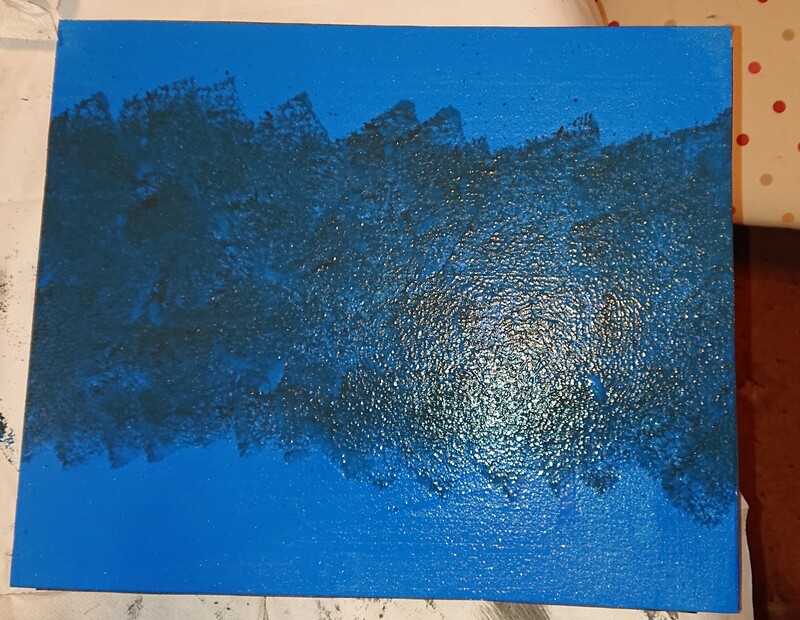 The base coat for the walls and floor were applied using a watered done mixture of white/black and touch of blue, applied using a sponge. 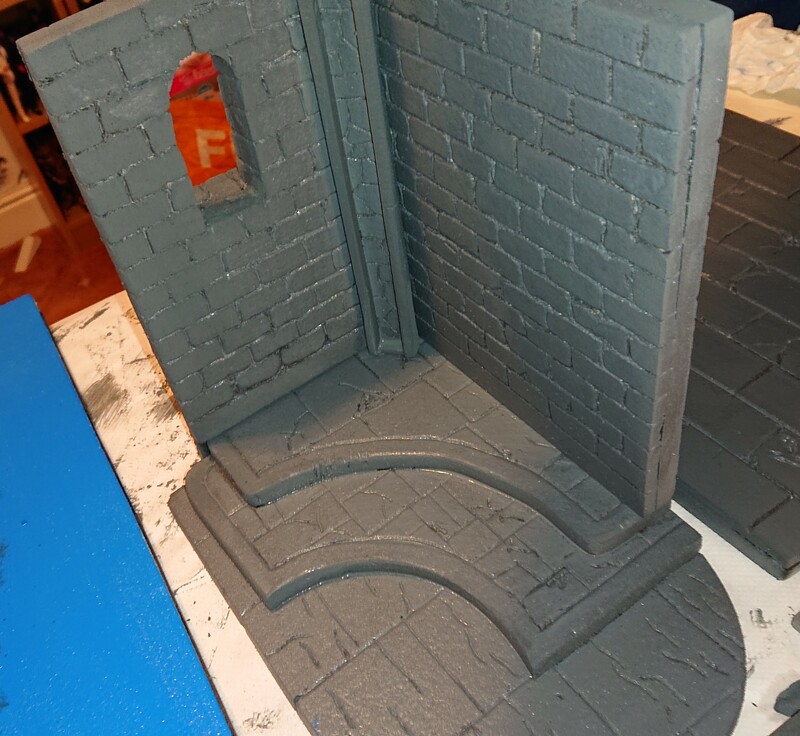 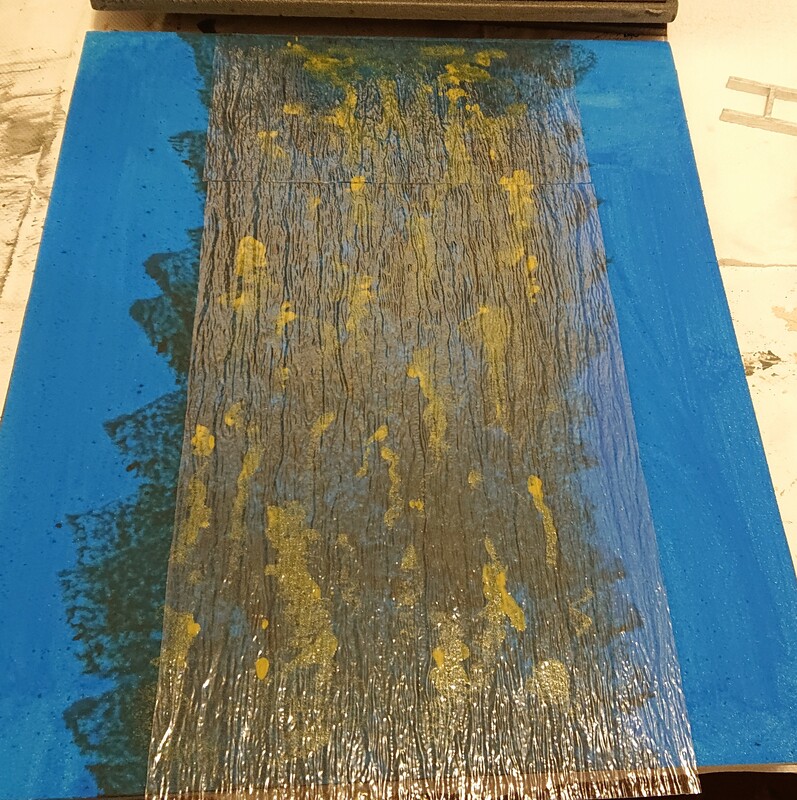 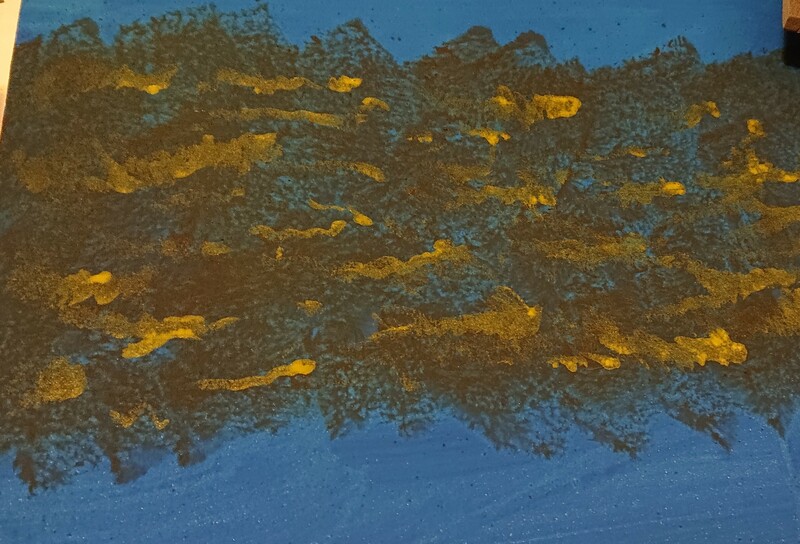 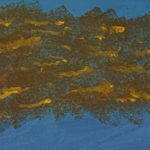 With the base coats dry, sponged over the walls with a water downed burnt umber mixed with yellow, dabbing the paint all over. 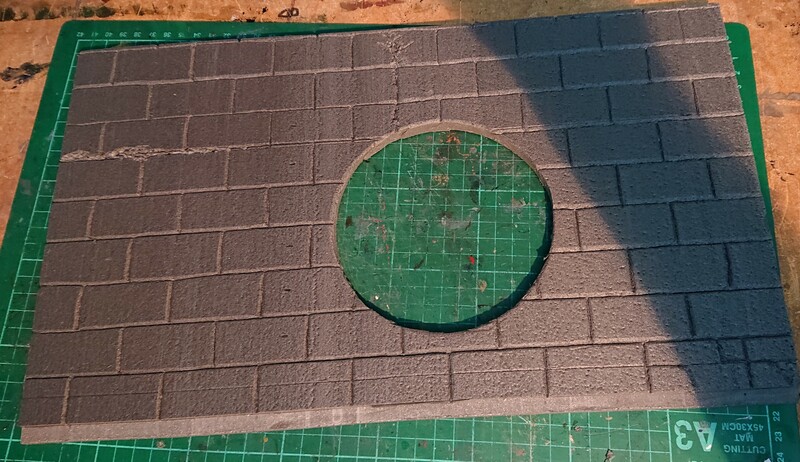 The floor was given another grey coat using my airbrush, random flags were sprayed a darker grey. 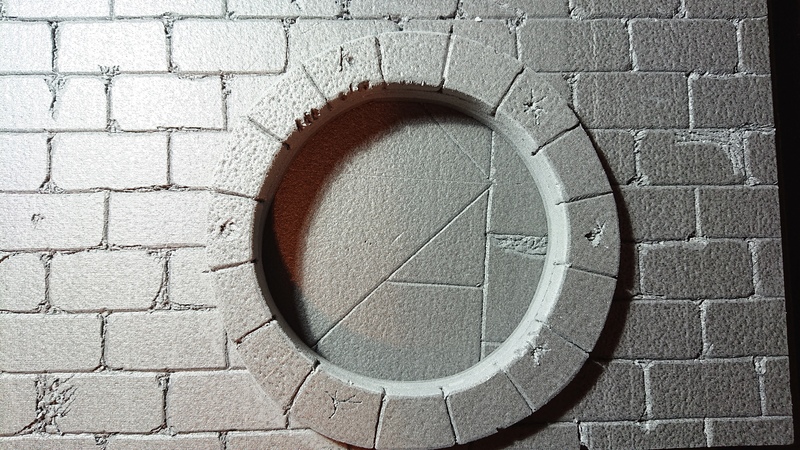 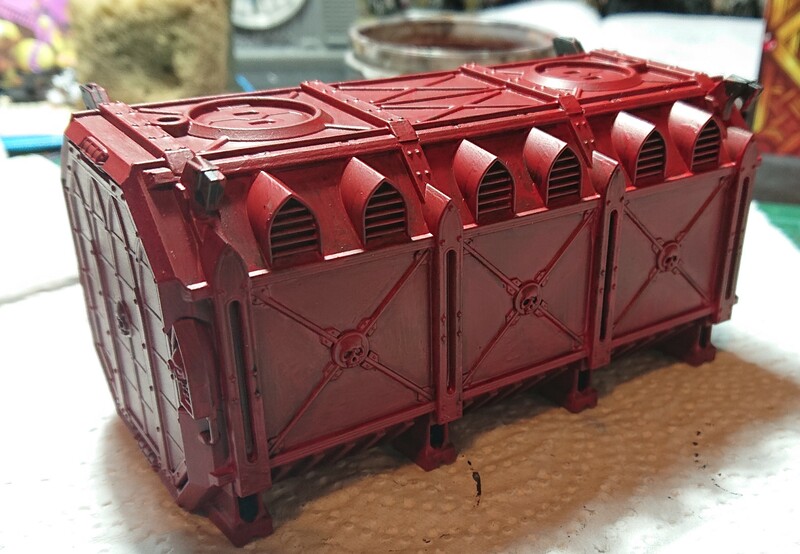 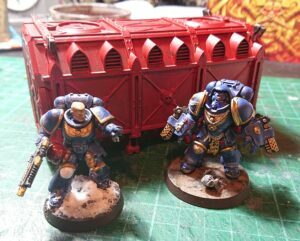 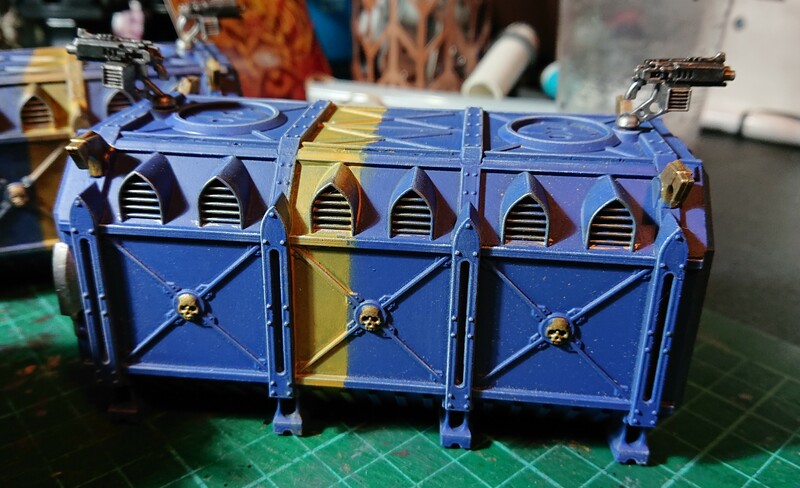 Once dry it was dry brushed with Games Workshop Longbeard Grey to pick out all the detail. 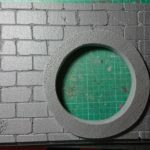 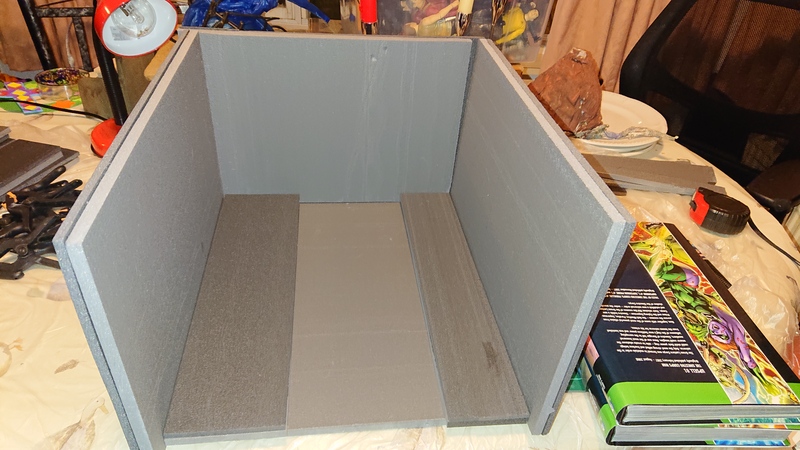 The inside walls I gave another coat of grey using the airbrush, once dry it was dry brushed with Games Workshop Longbeard Grey to pick out all the detail. 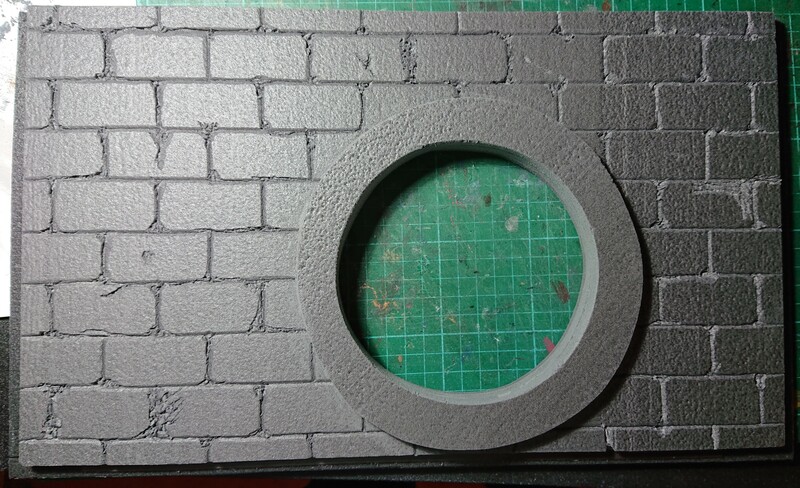 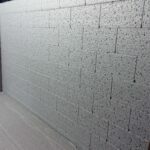 The exterior walls where sprayed with a grey/brown solution, then random stones where sprayed different shades of grey. 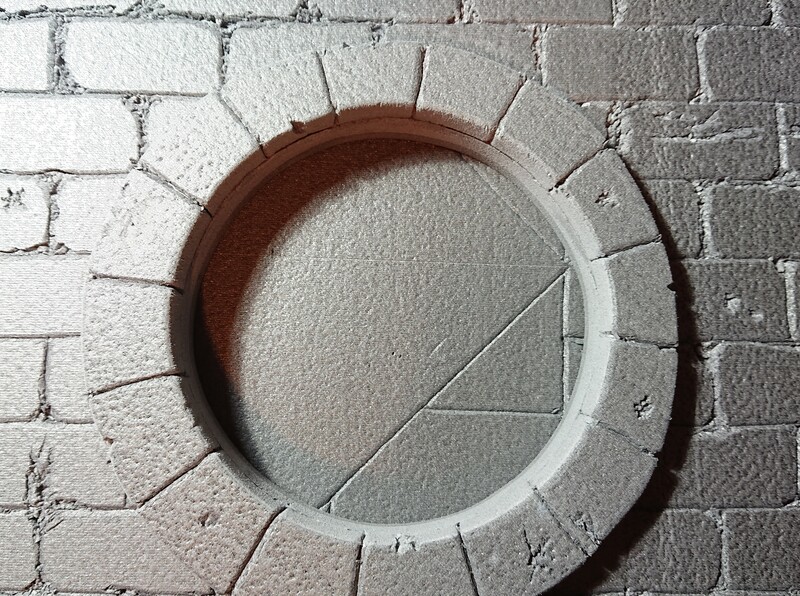 Once dry it was dry brushed with Games Workshop Longbeard Grey to pick out all the detail. 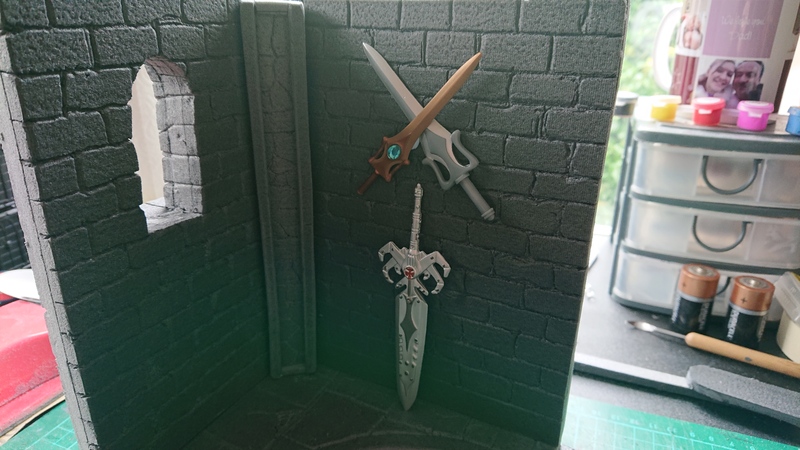 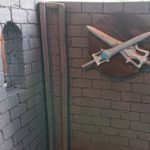 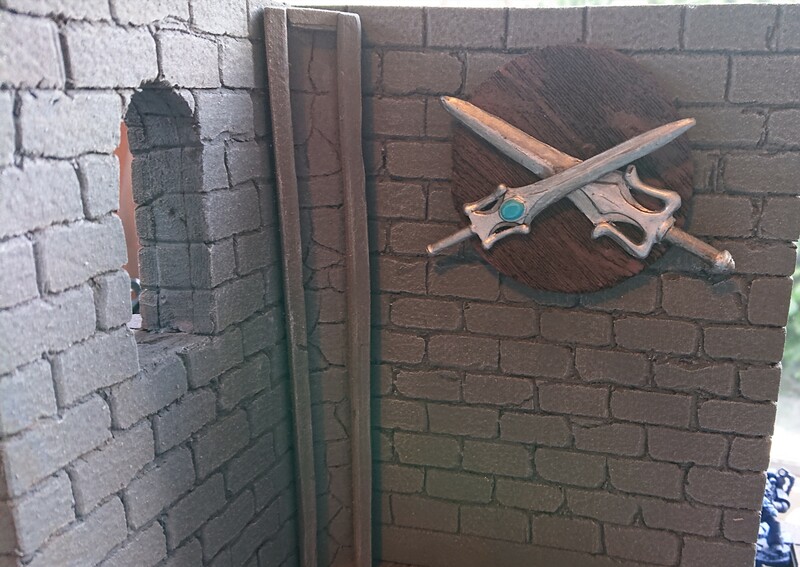 Now the diorama build is complete, I wanted to decorate one wall with two hanging swords. 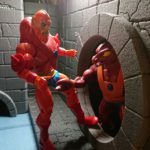 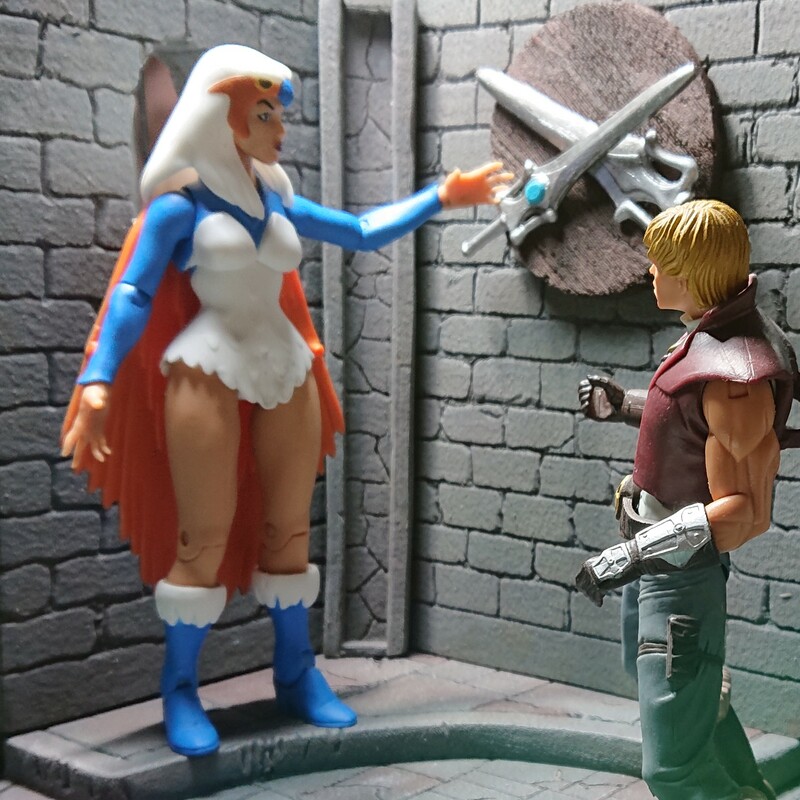 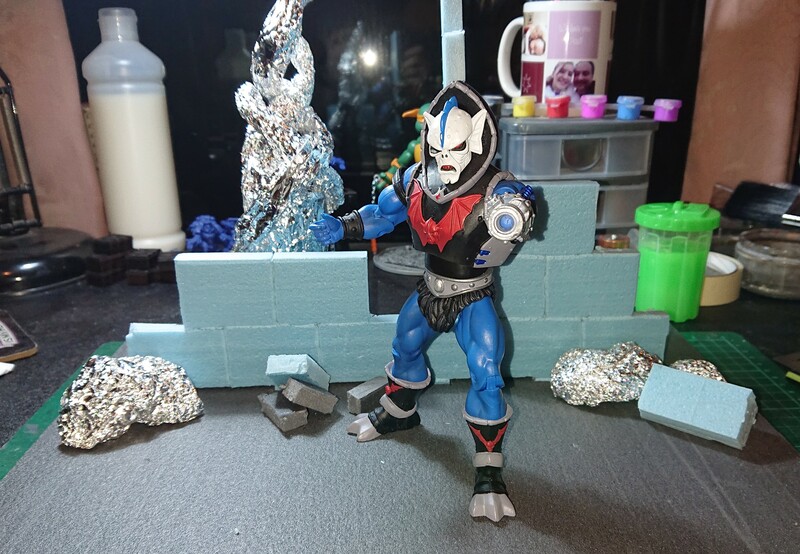 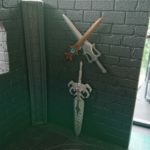 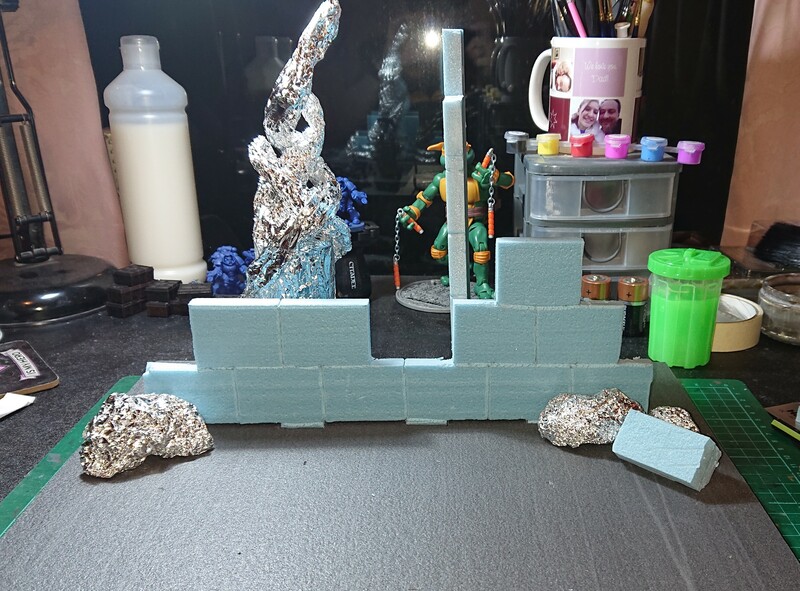 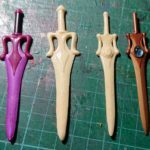 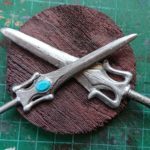 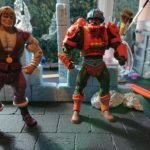 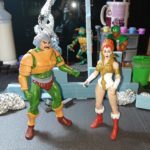 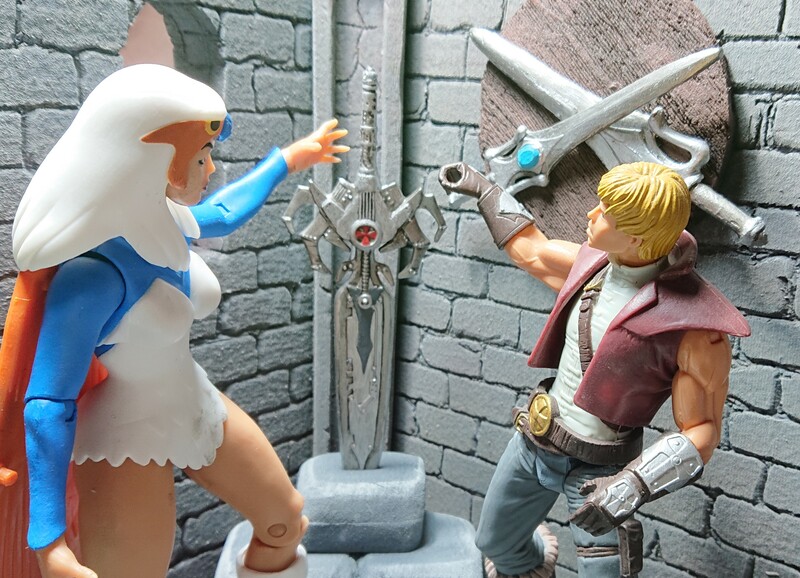 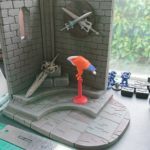 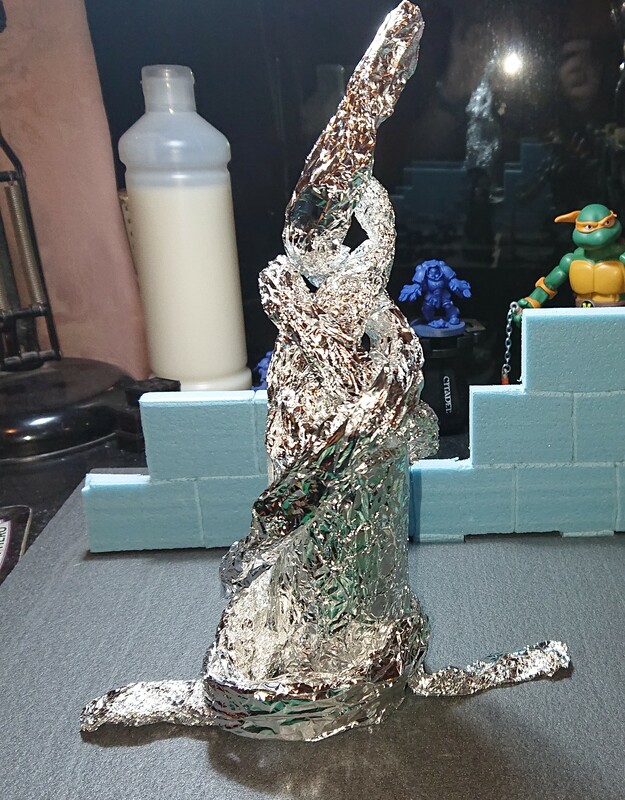 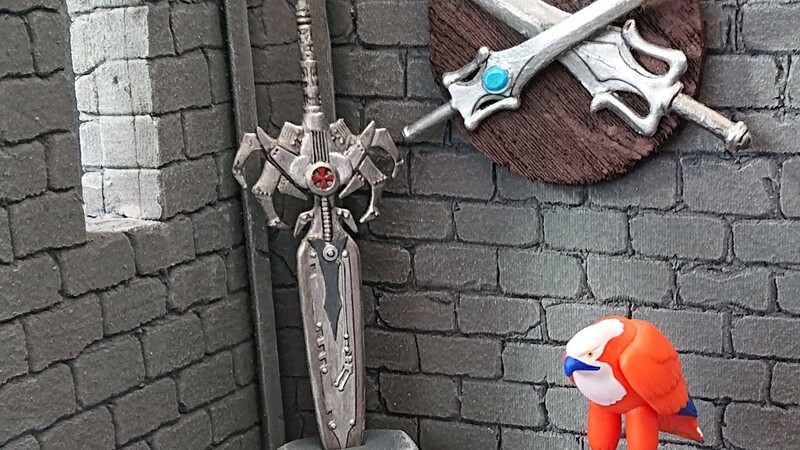 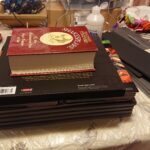 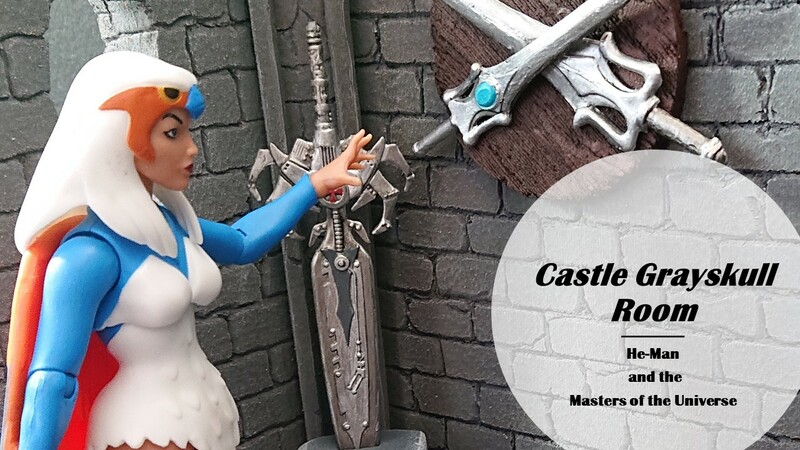 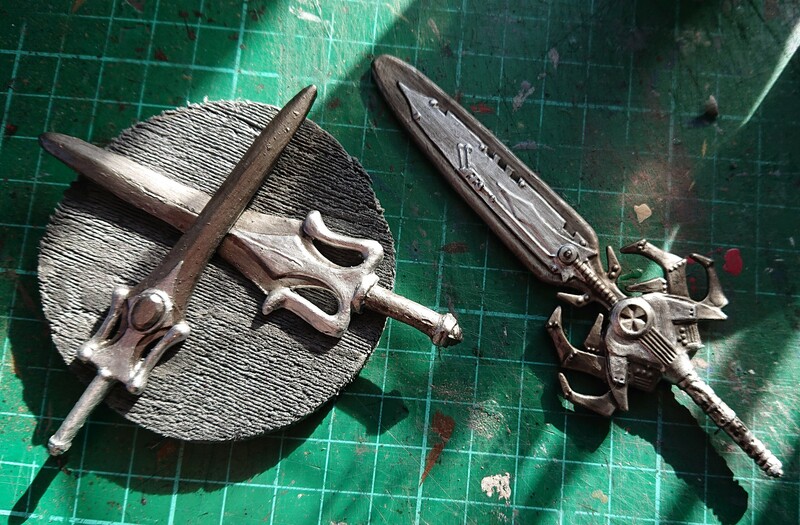 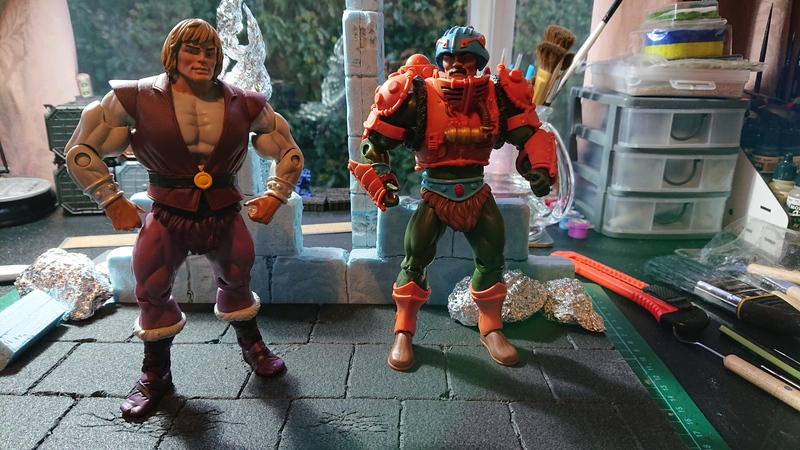 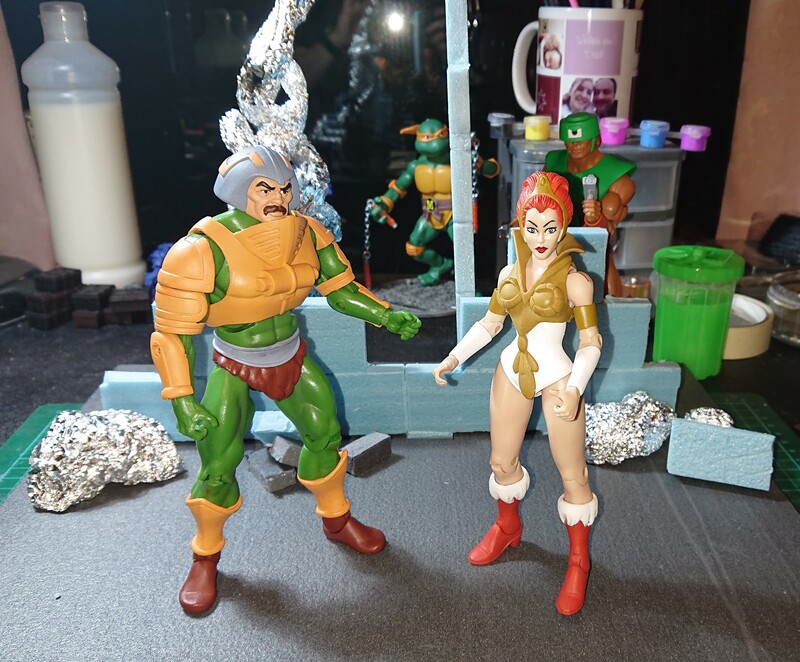 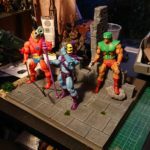 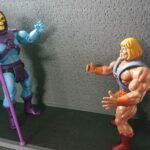 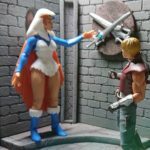 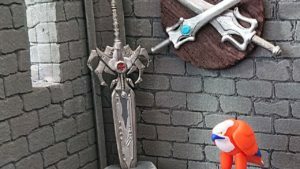 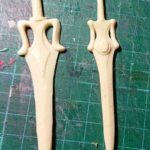 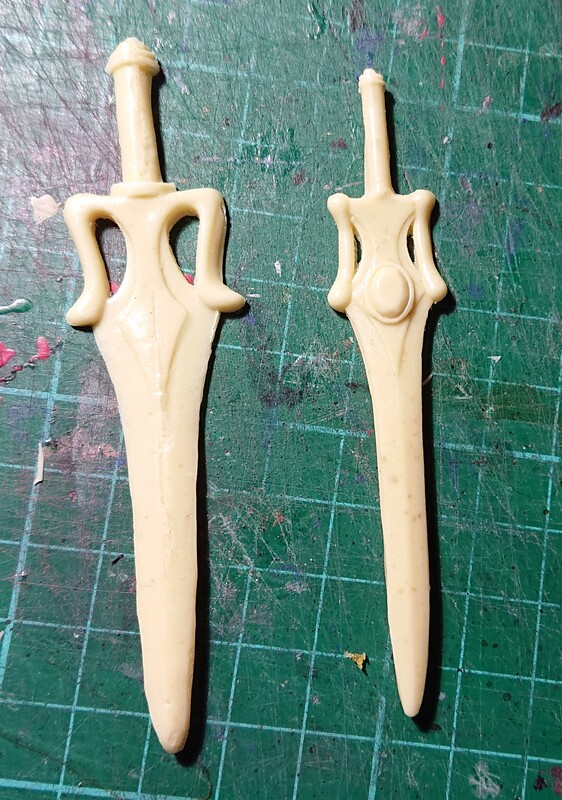 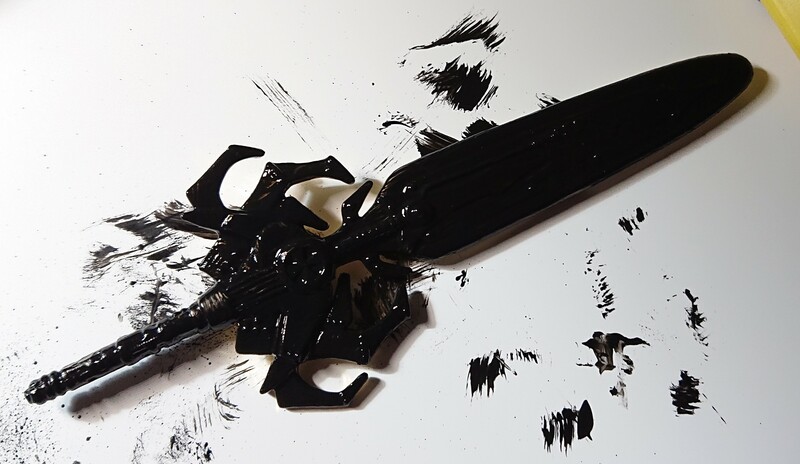 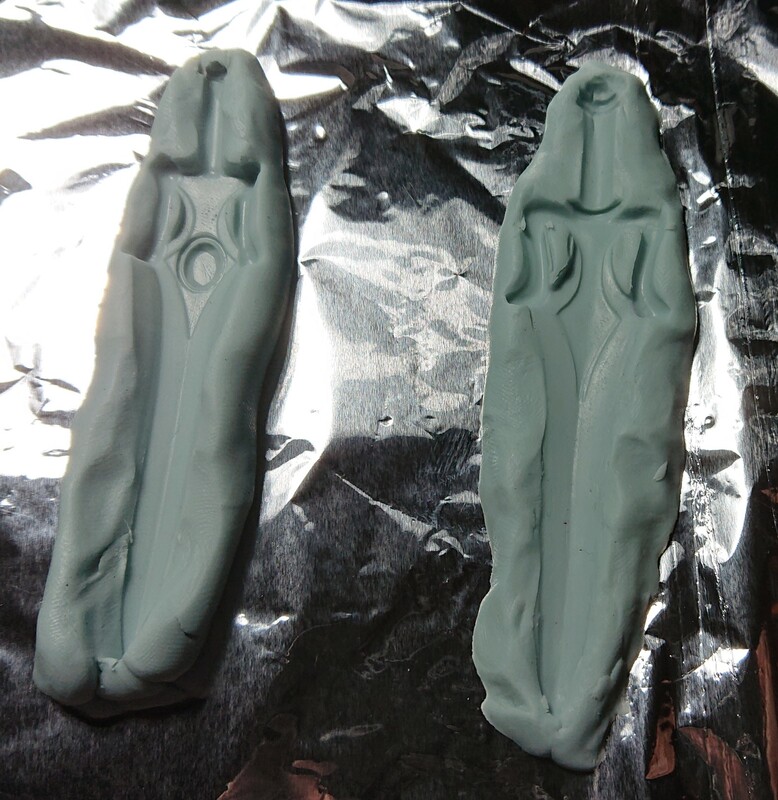 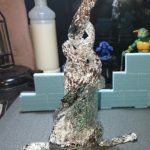 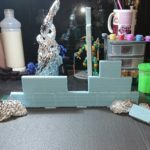 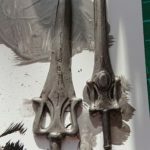 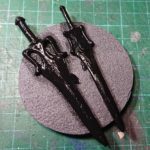 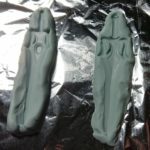 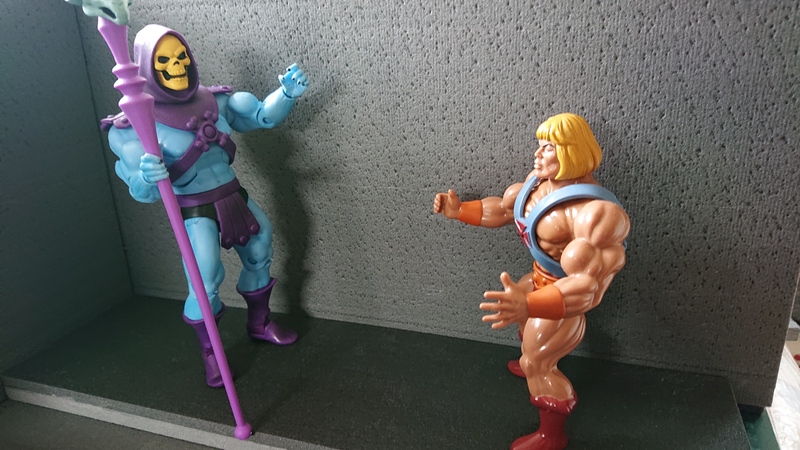 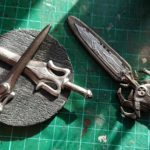 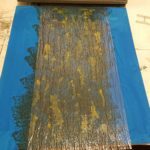 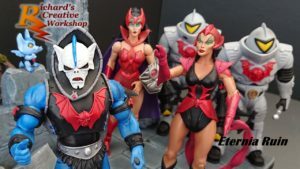 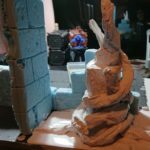 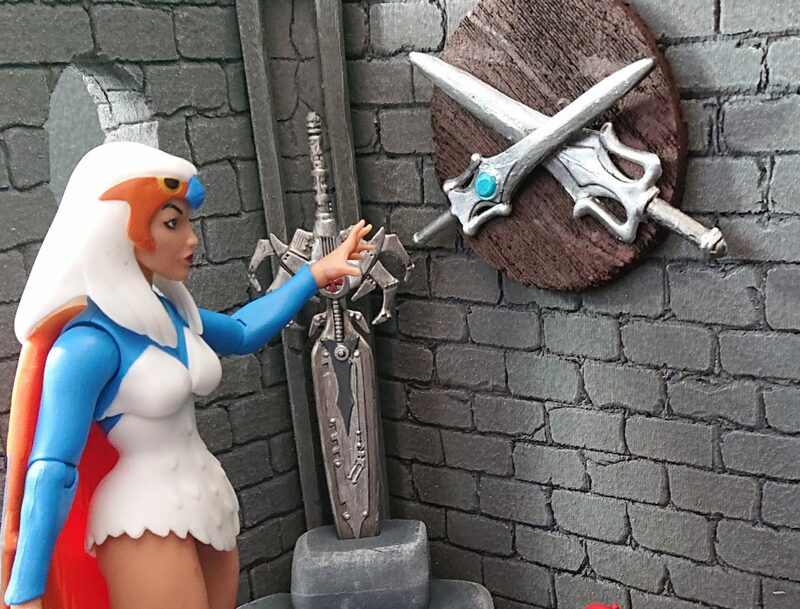 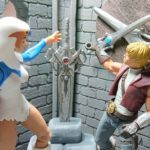 I took casts of both Masters of the Universe Classics He-Man and She-Ra’s swords, since the swords are permanently fixed to walls I took half casts of each sword using blu-stuff to make the molds. 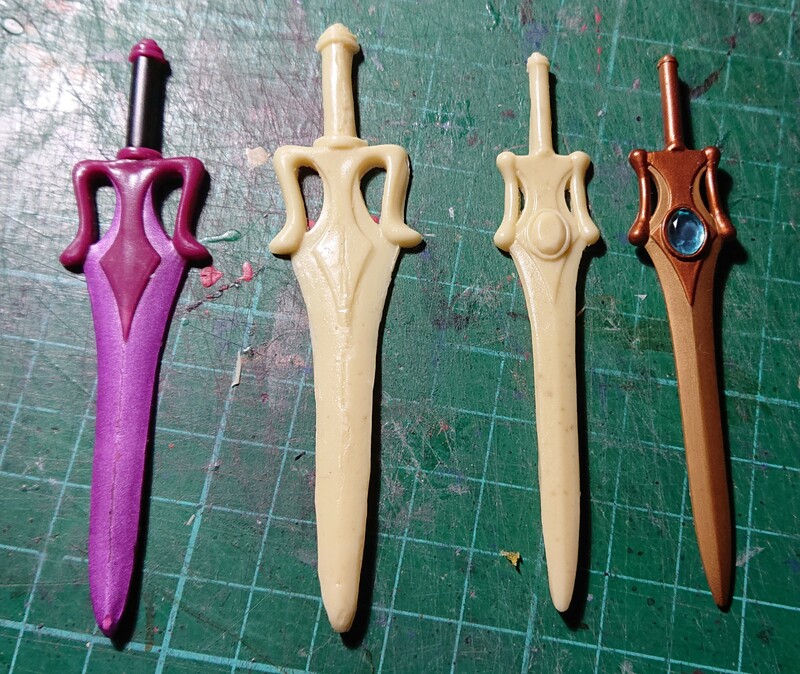 When it was safe to remove the curing swords from the molds, I trimmed the excess off and left them to finish curing. 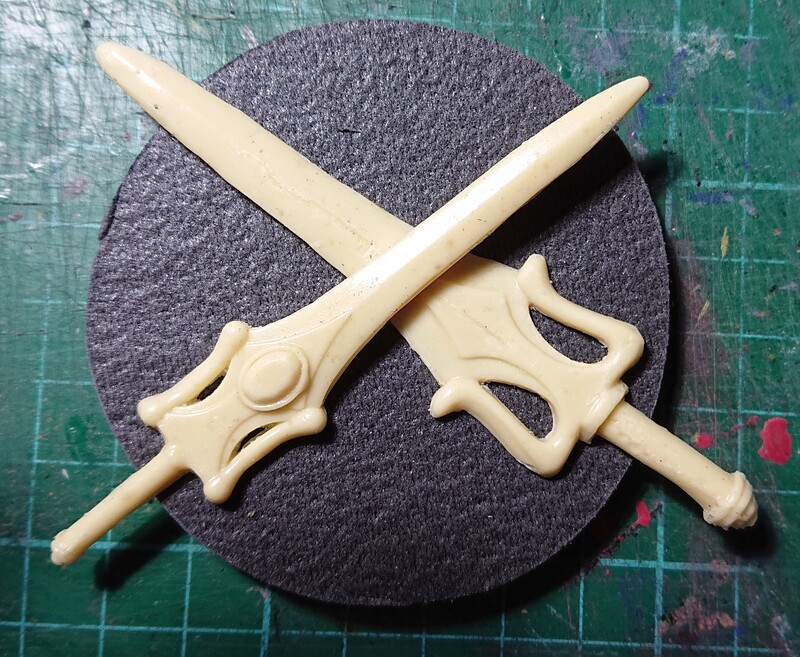 I base coated both the swords using Abaddon Black and did the same to a spare MOTU 200x golden sword of power. 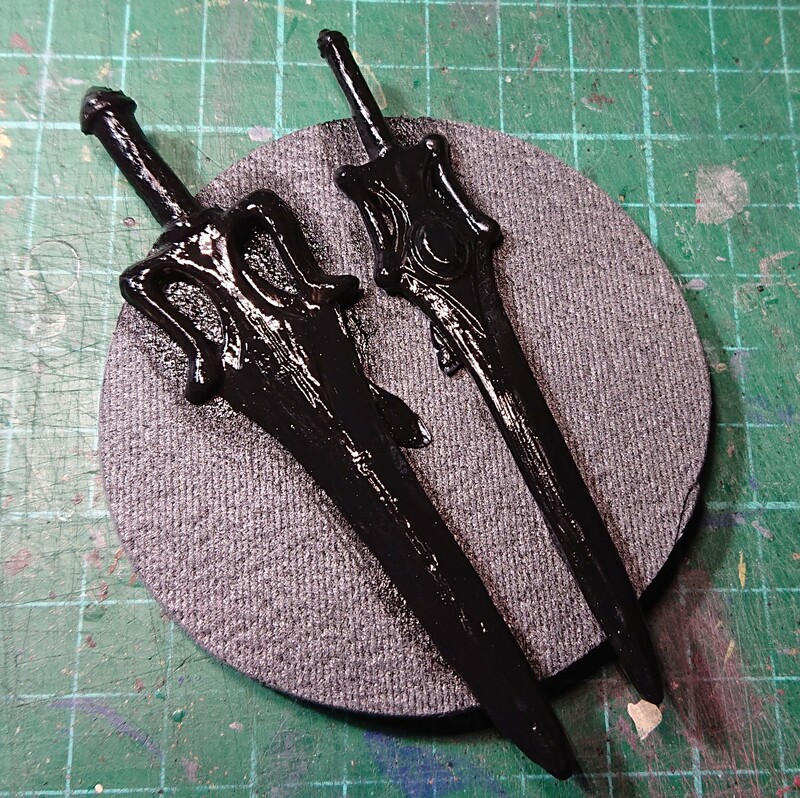 All three swords where then base coated with Leadbelcher, layered with Runefang steel and edged with Stormhost Silver. 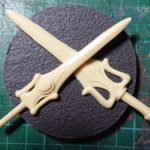 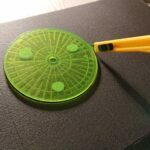 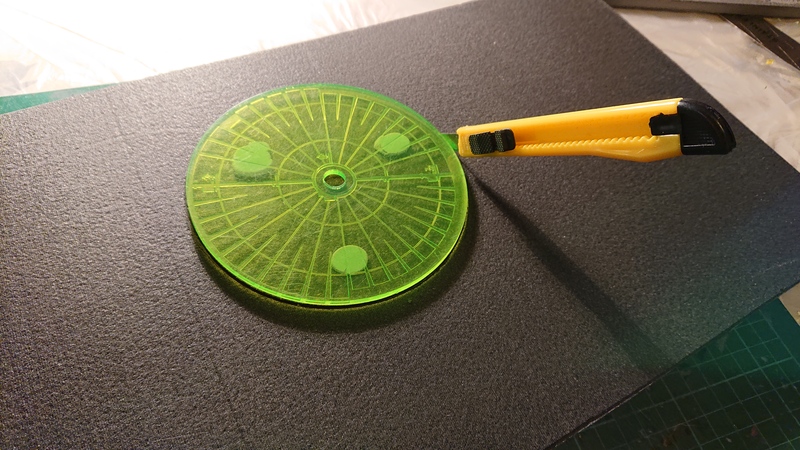 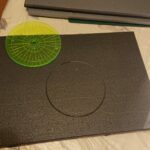 Turning my attention to plaque the classic swords were going to be mounted onto, a circle had been cut into a piece of 6 mm foam board. 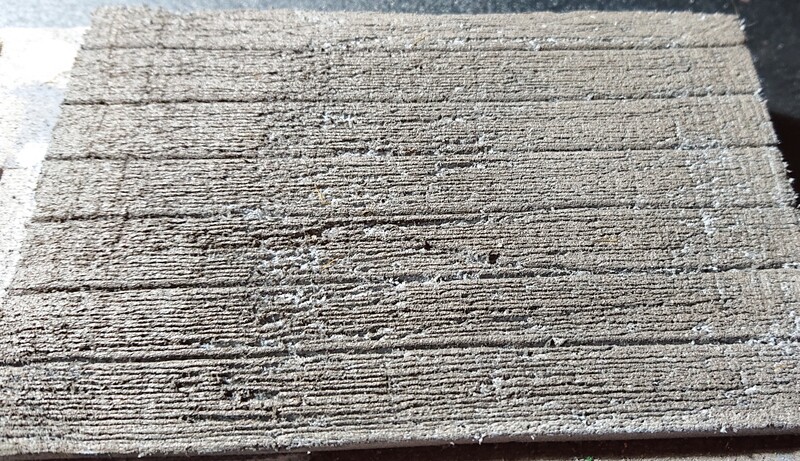 I used a wire brush to make it look like it had been made from a piece of wood. 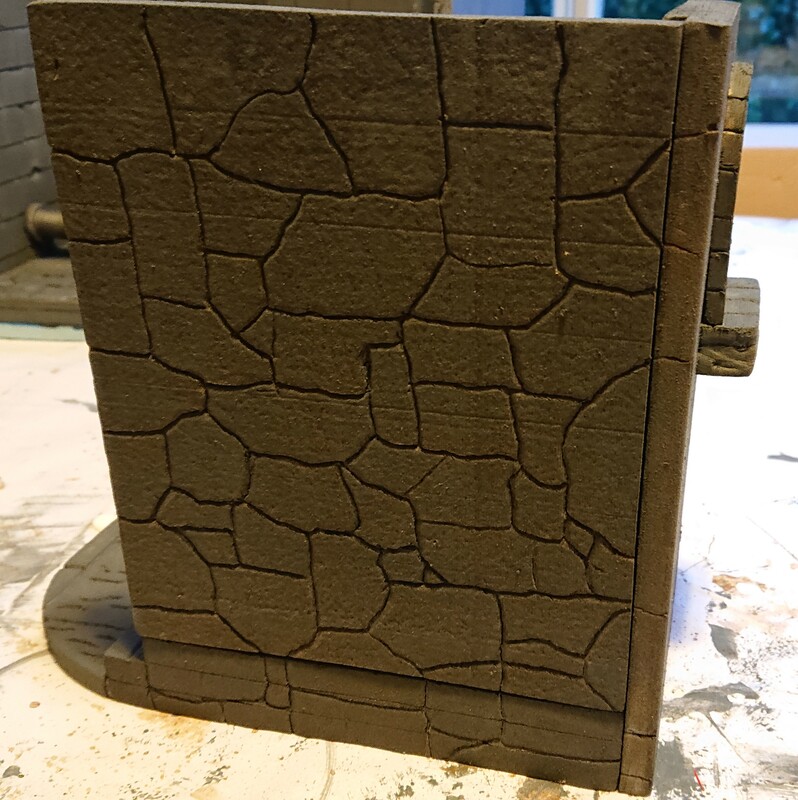 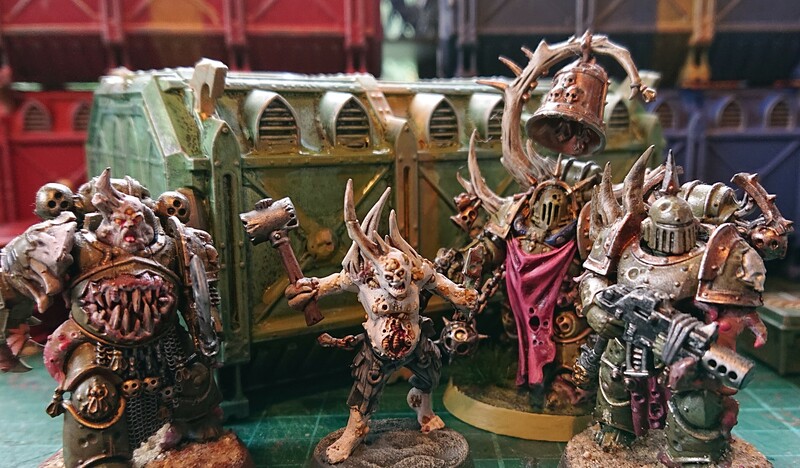 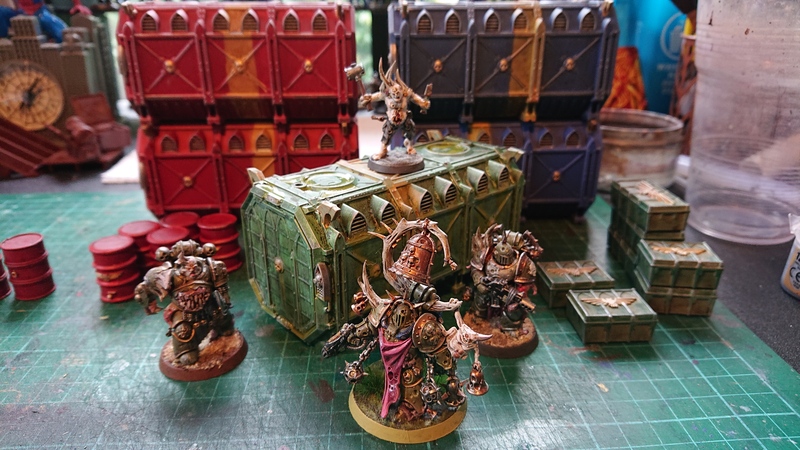 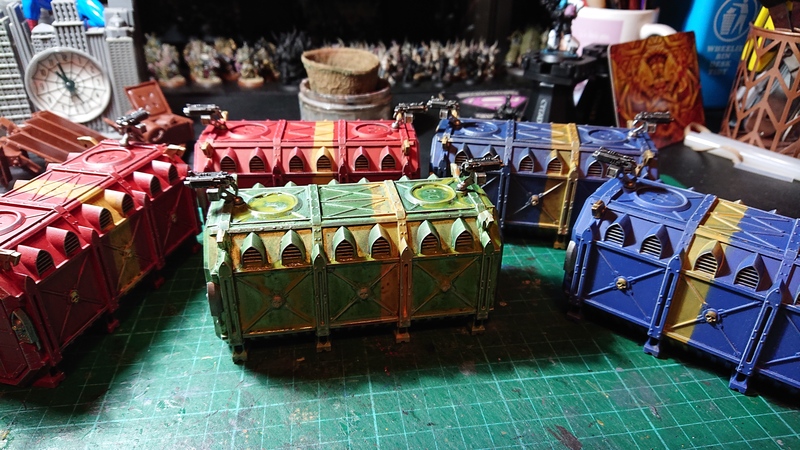 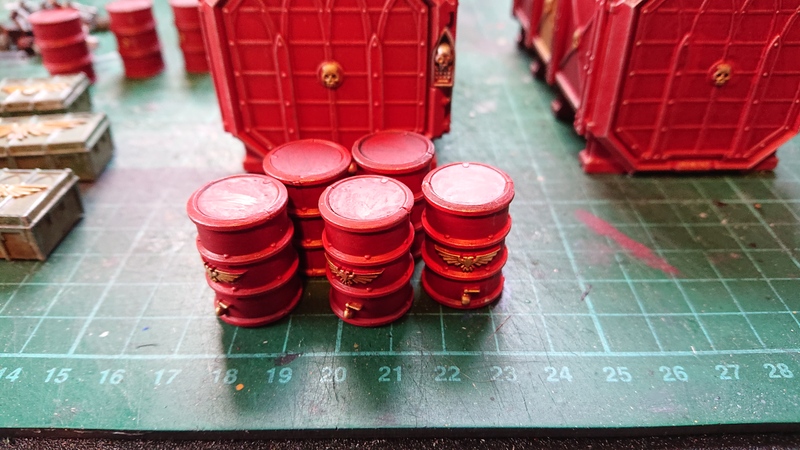 Base coated with Rhinox hide, shades with Agrex Earthshade and the washed over with Mournfang brown. 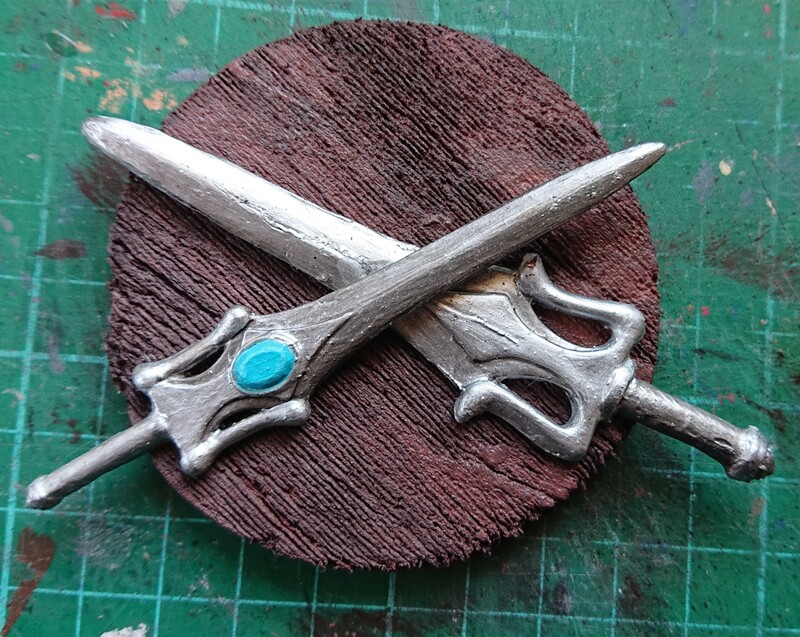 Both half swords where glued into place and then mounted onto the wall. 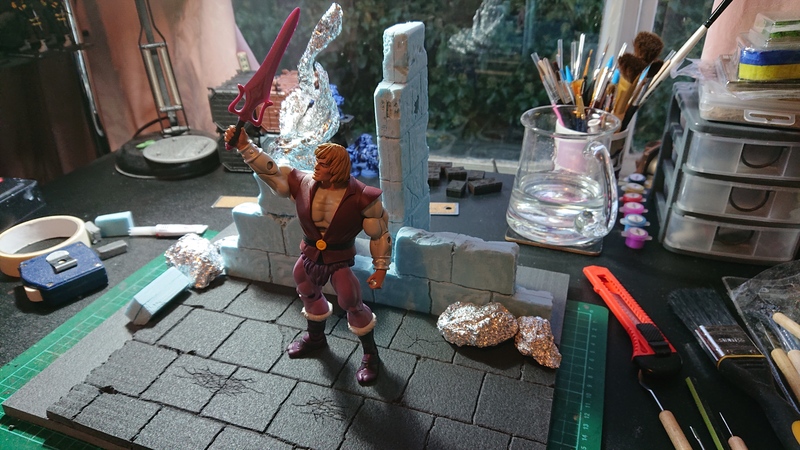 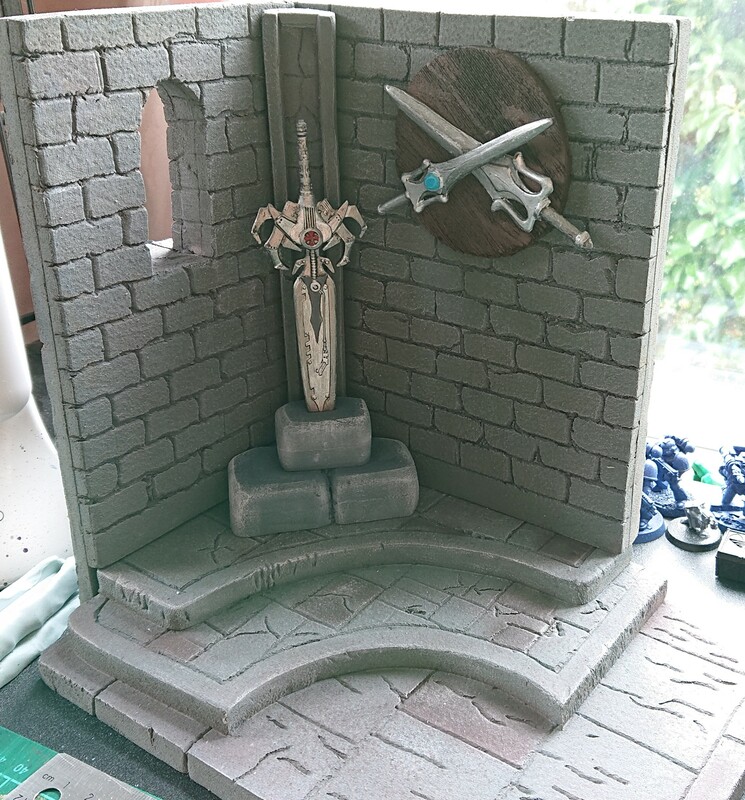 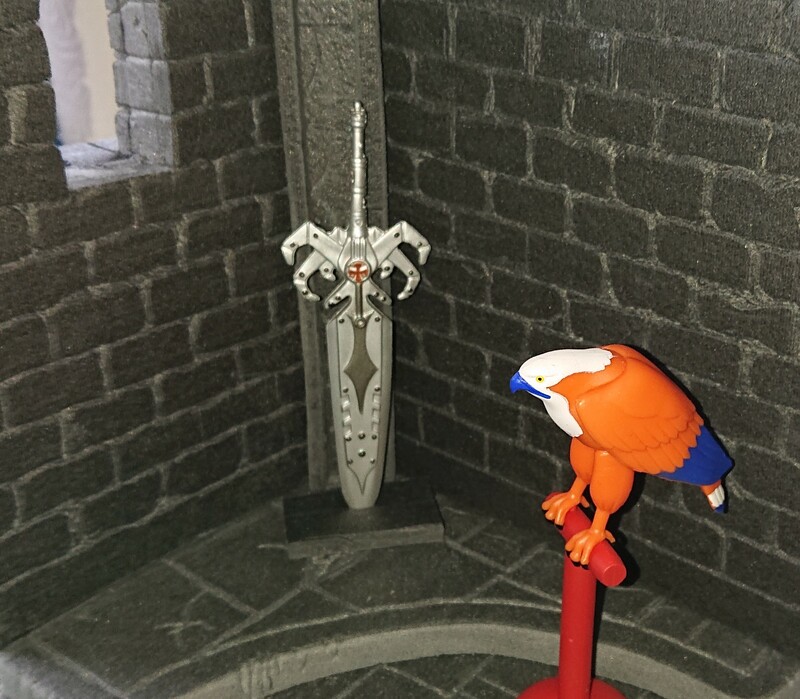 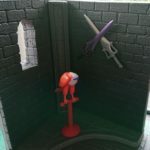 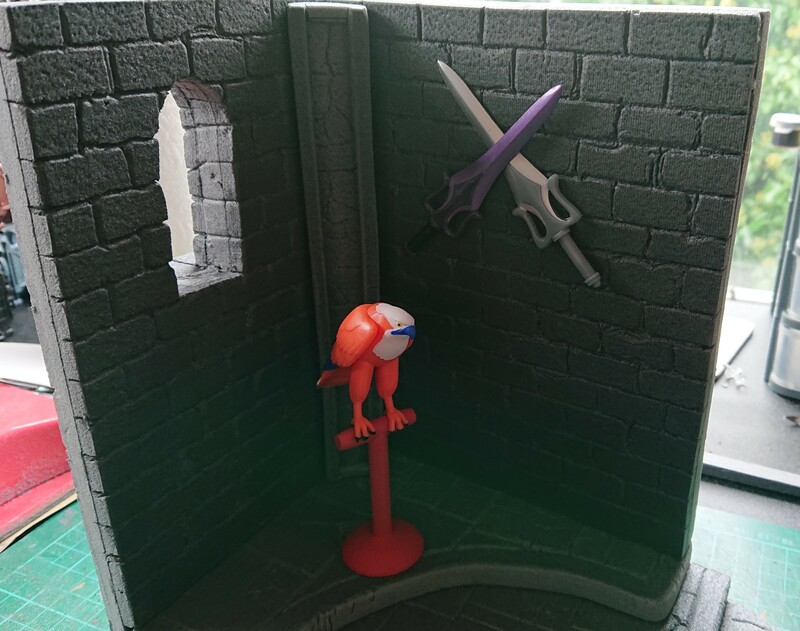 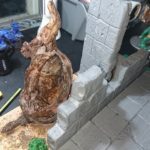 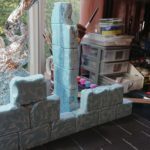 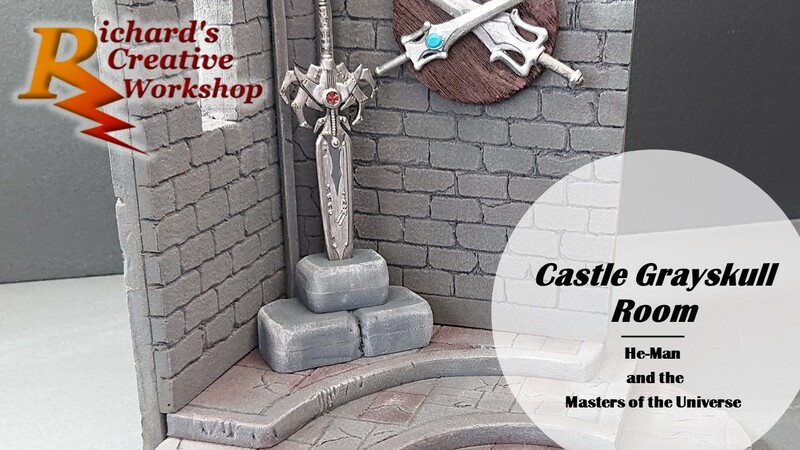 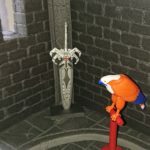 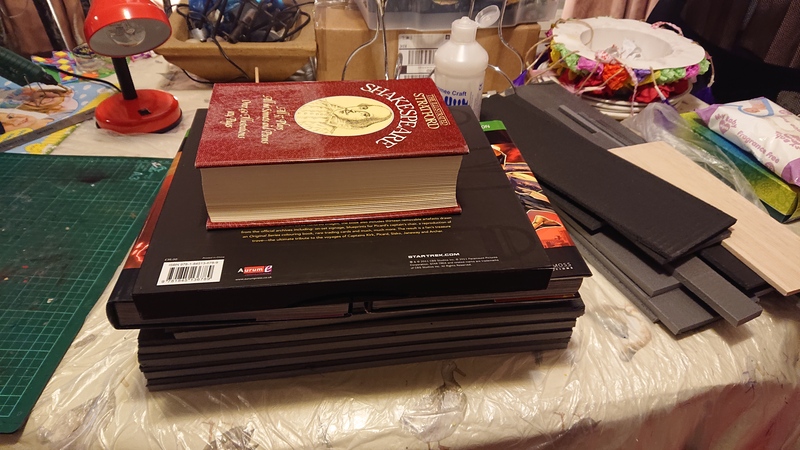 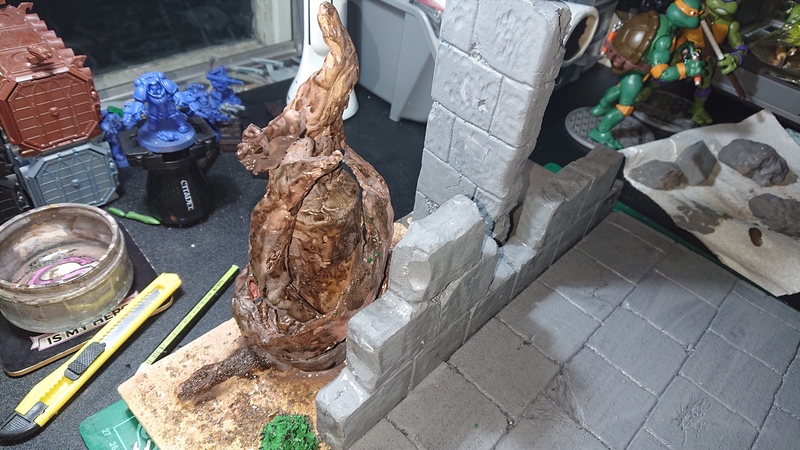 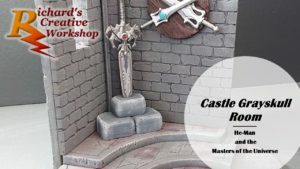 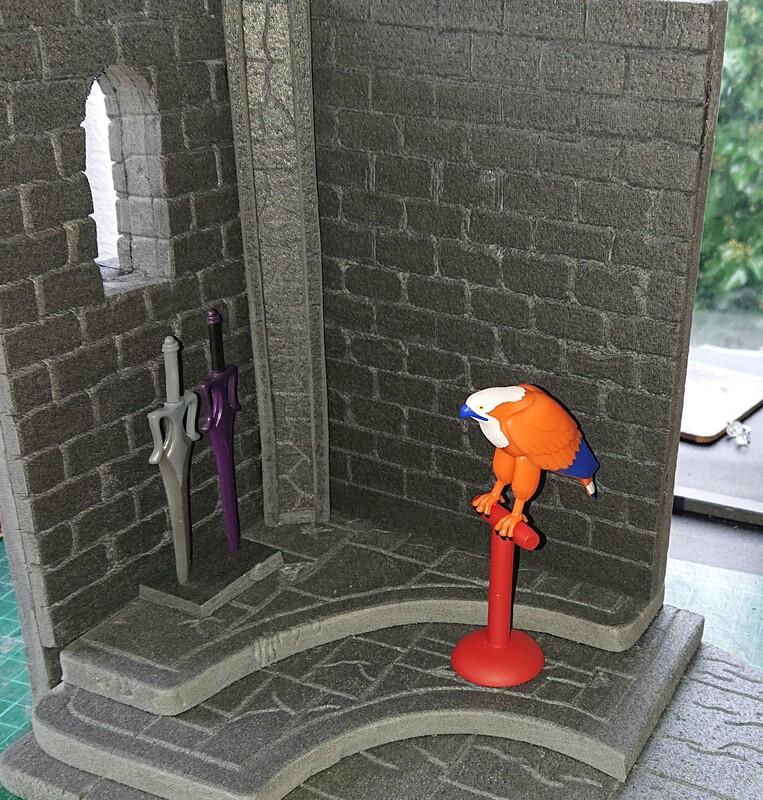 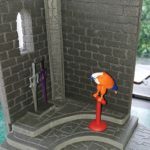 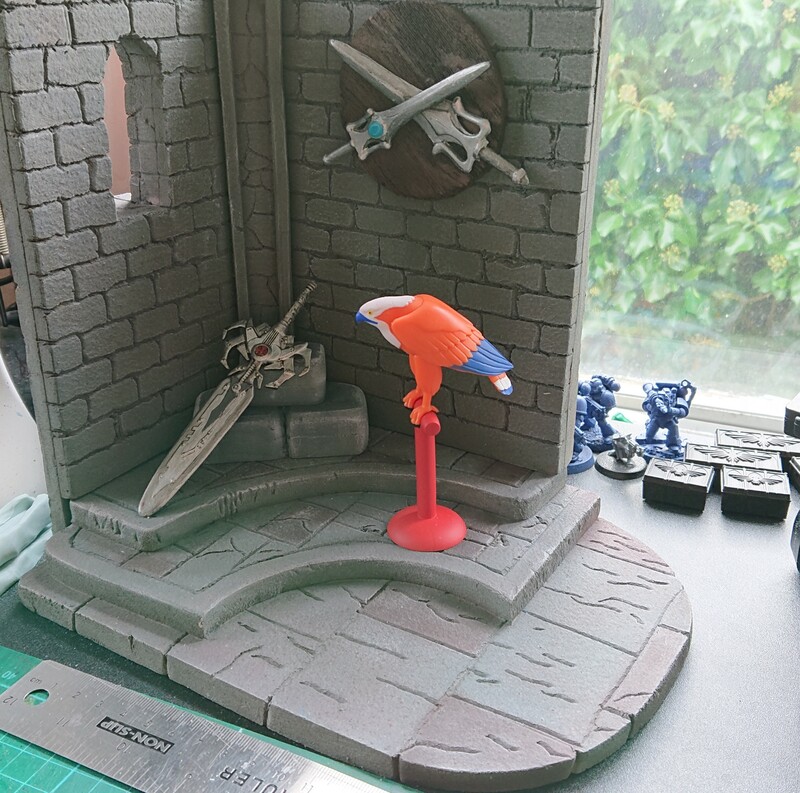 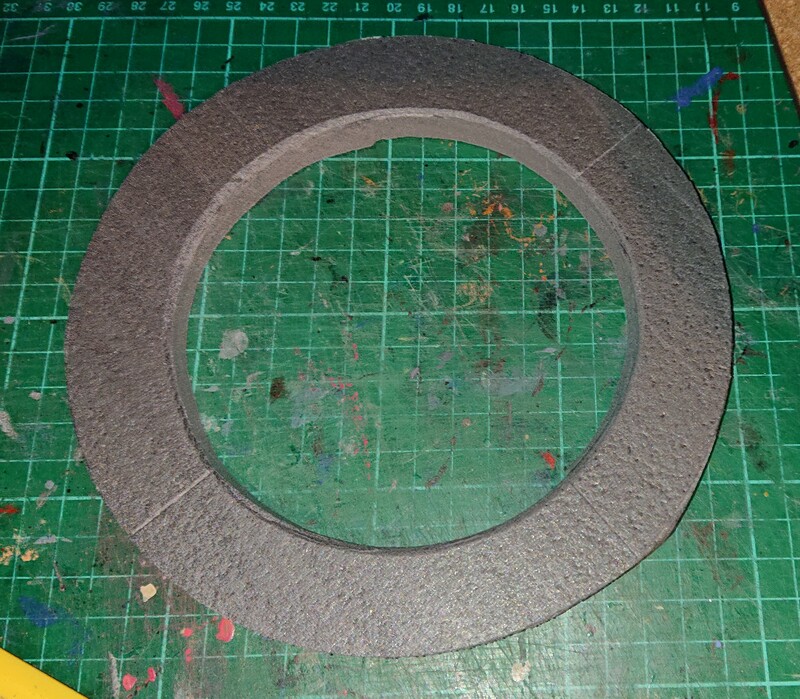 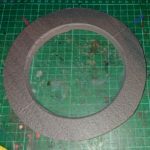 I created a stone plinth for the 200x Sword of Power to stand in and to be freely seated in the corner. 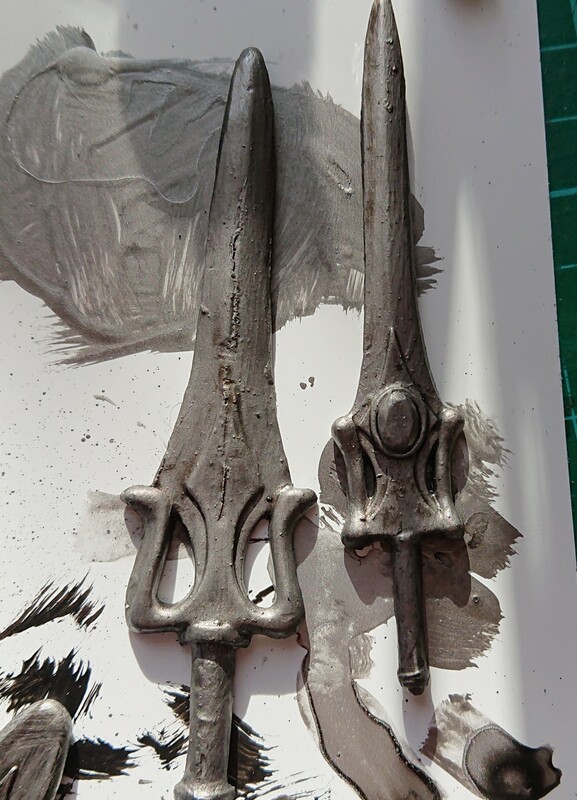 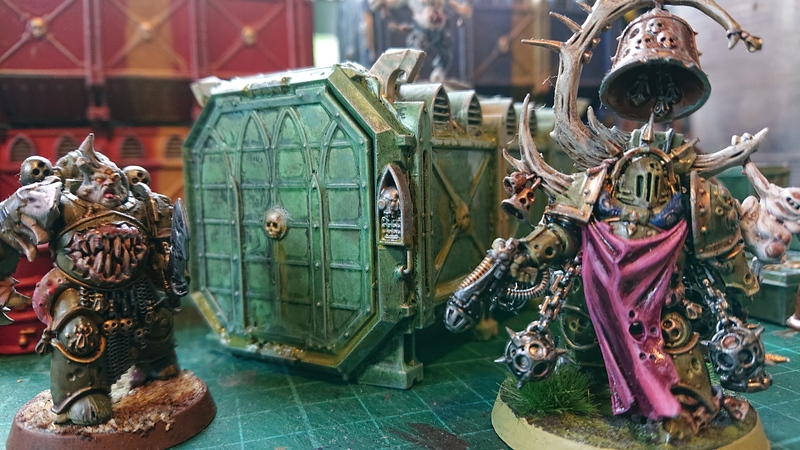 Painted with Mechanicus Standard Grey and then edged with Longbeard Grey, the sword was embedded into the stone.